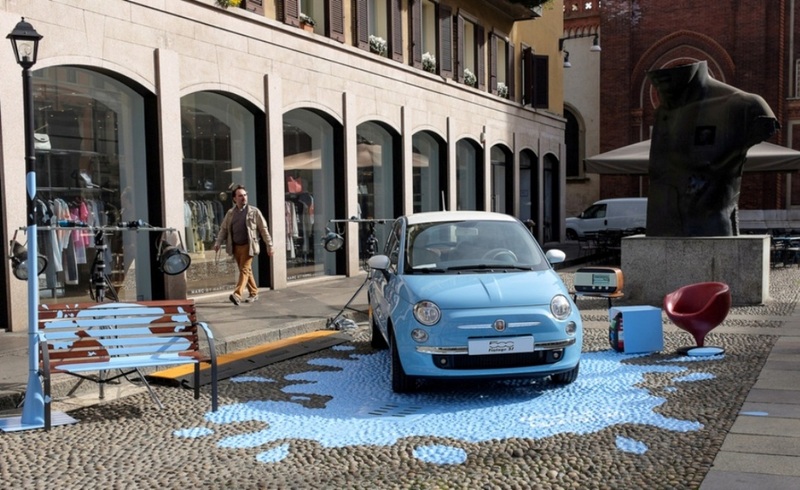 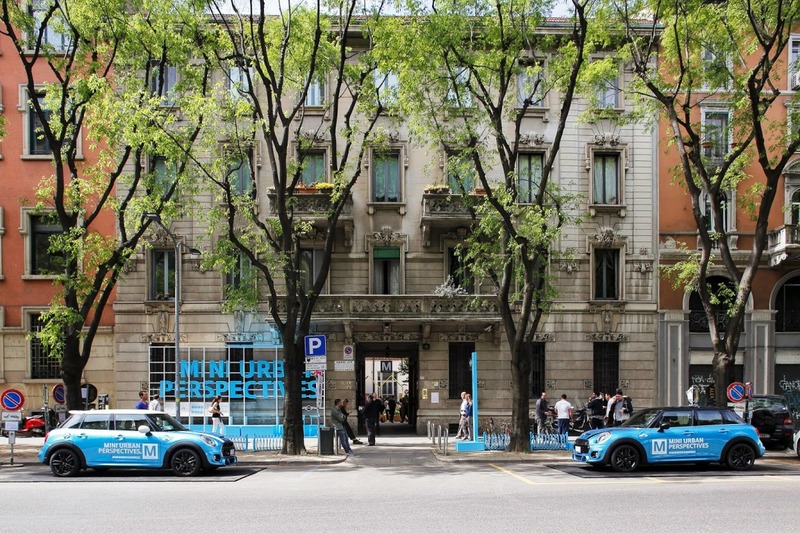 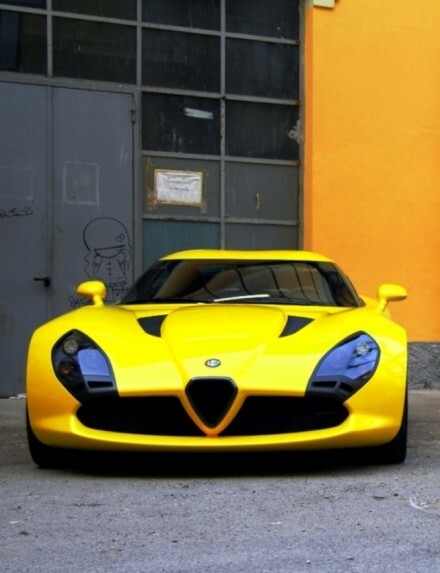 There was a time when car makers came to Milan merely to observe. 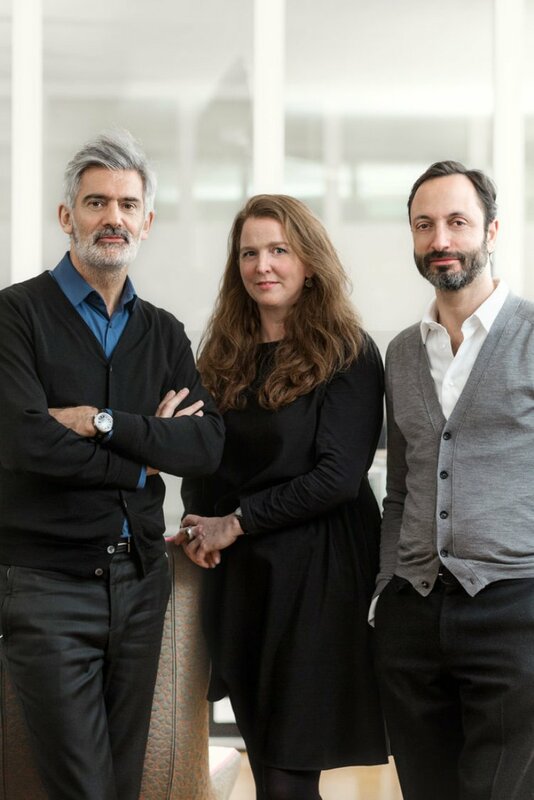 A handful of the more advanced designers would visit the Salone to be inspired by the wider creative community. 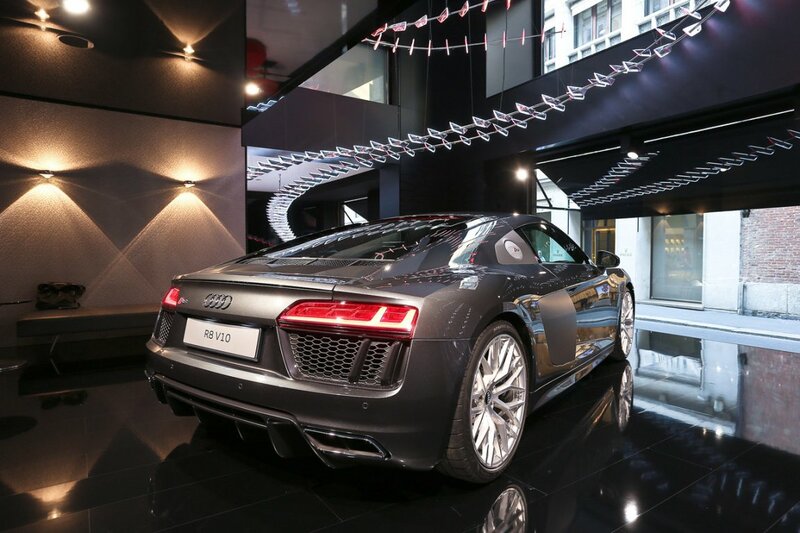 However, this has been steadily changing, with an increasing number of car manufacturers partaking in the last few years – with mixed results. 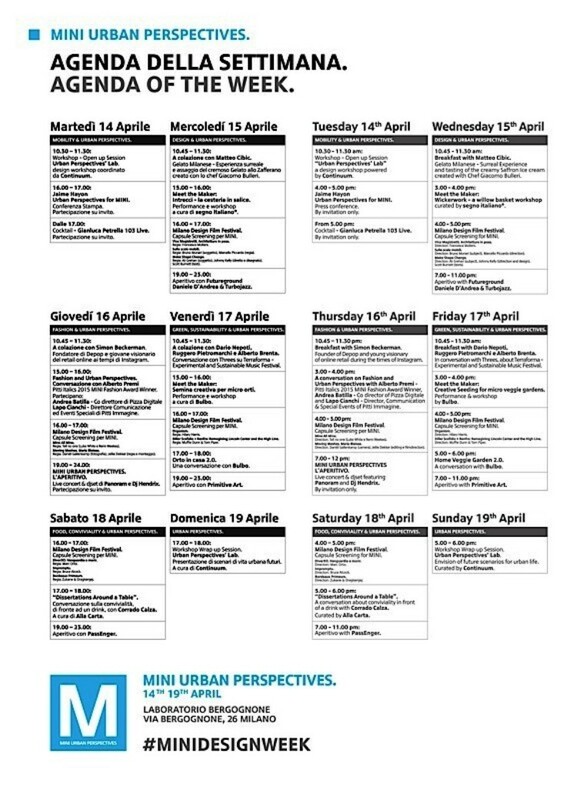 You might ask why the car manufacturer’s go to Milan, spending serious amounts of money to buy a presence for the five days of activity. 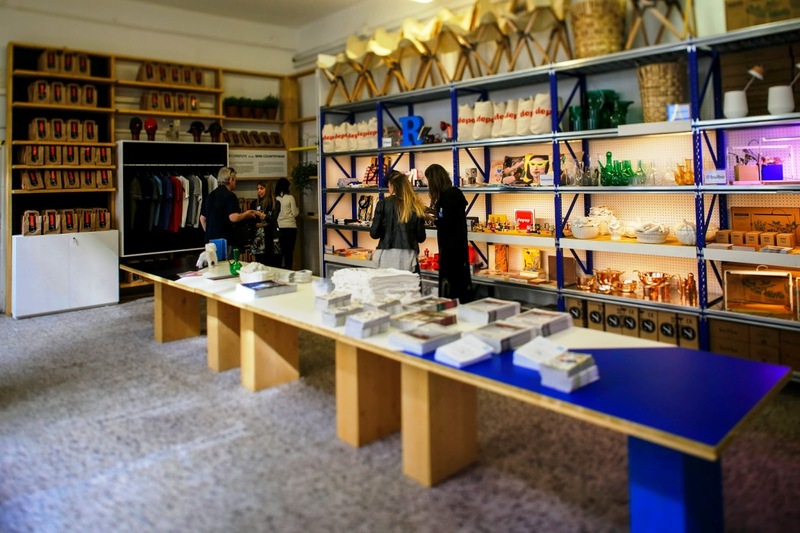 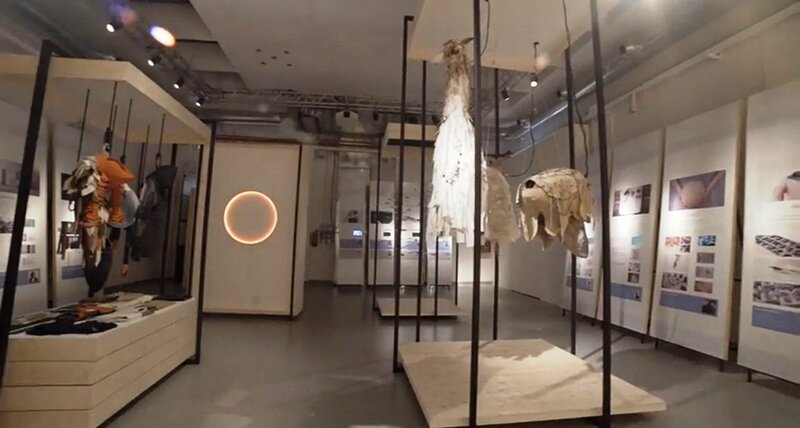 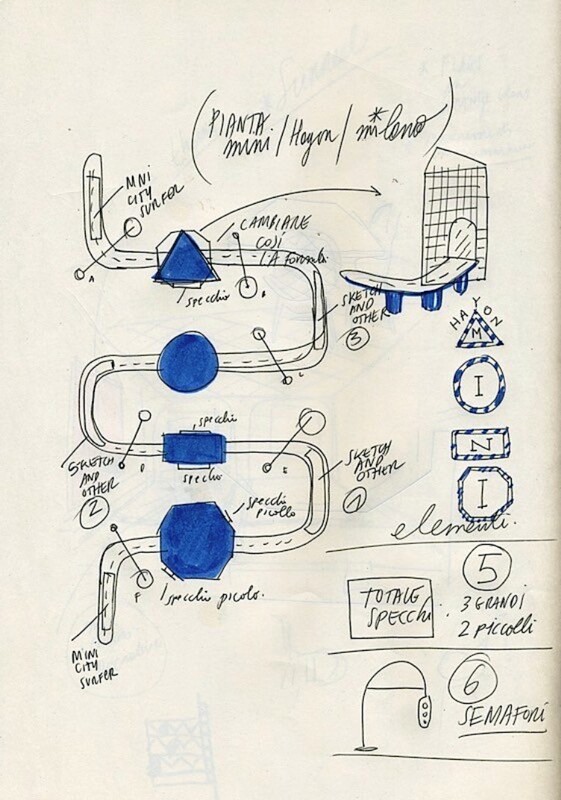 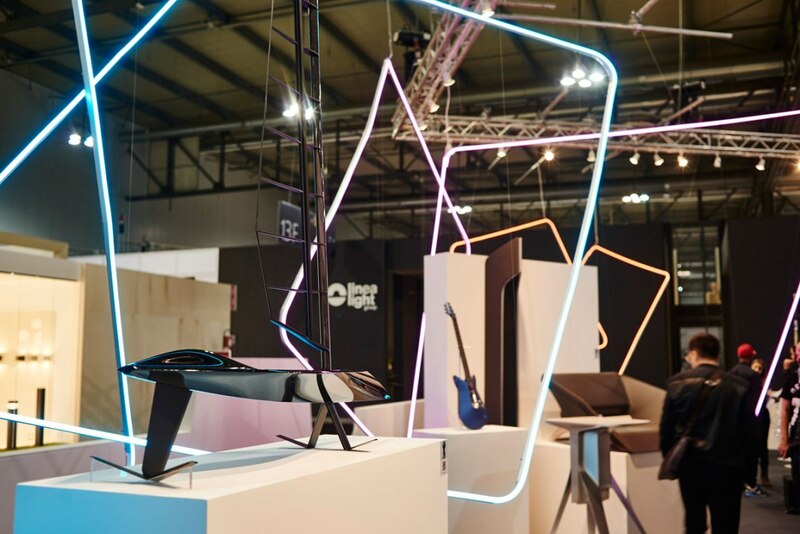 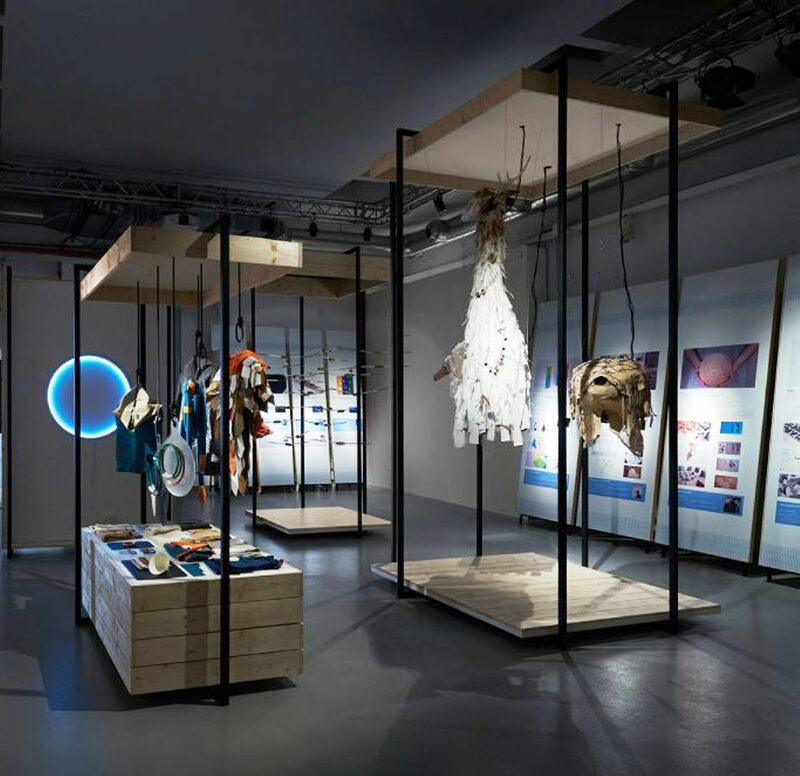 Being the largest trade fair of its kind in the world, Milan Design Week typically welcomes a number of automotive design teams presenting their visions in unorthodox ways. 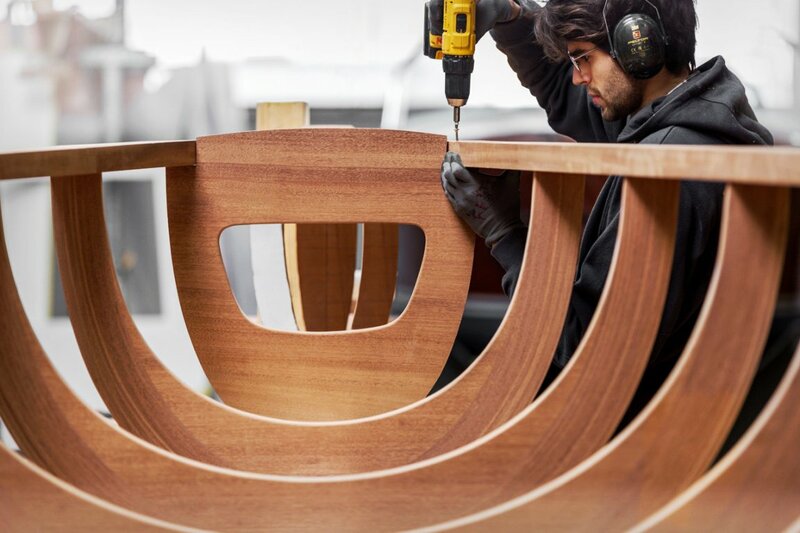 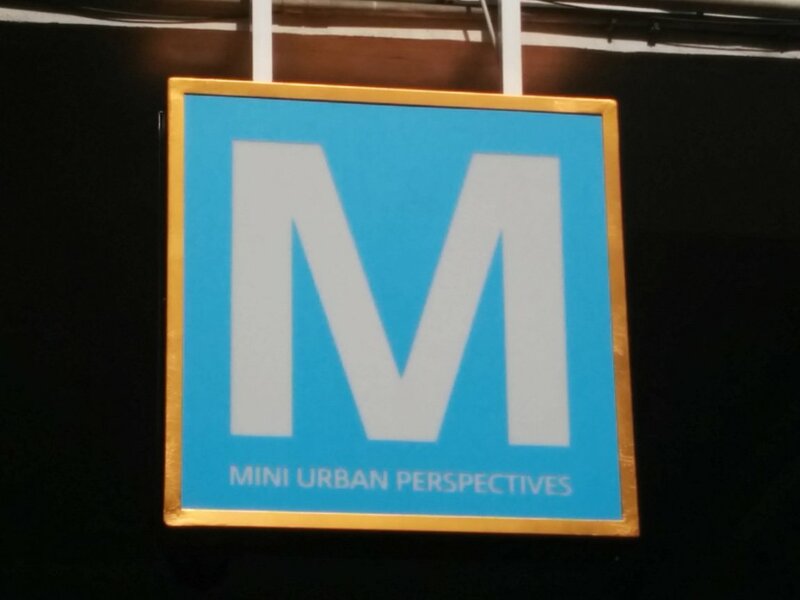 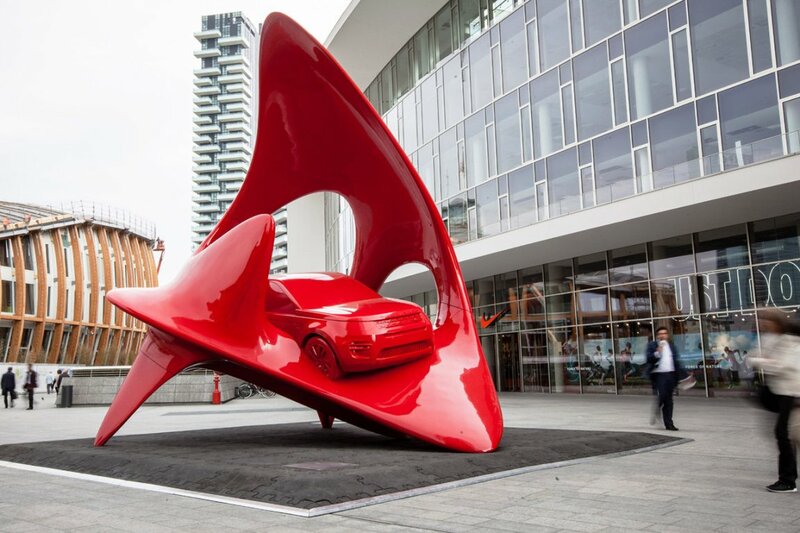 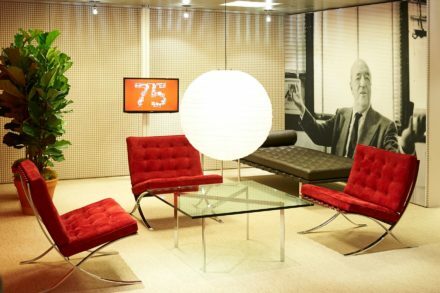 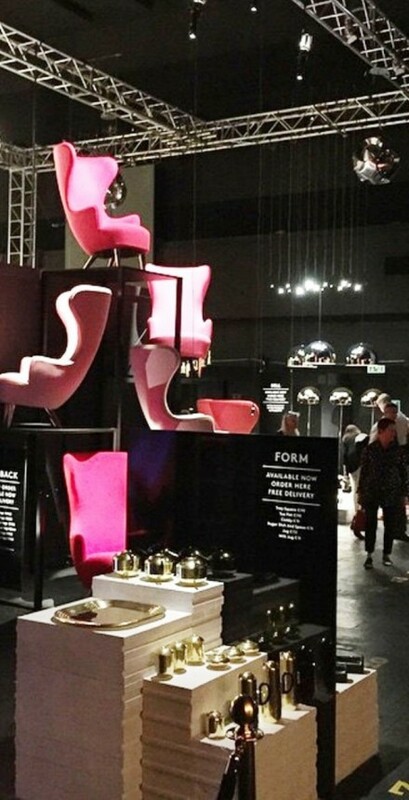 Because of the level of innovation, vision, and prestige surrounding the Milan Furniture Fair, many automakers use this week-long event as a chance to build their brand. 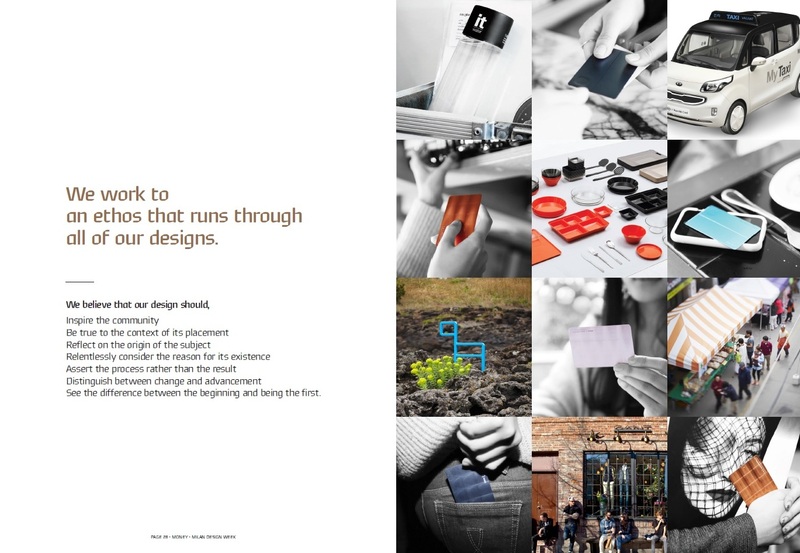 But is it all about building brand ? 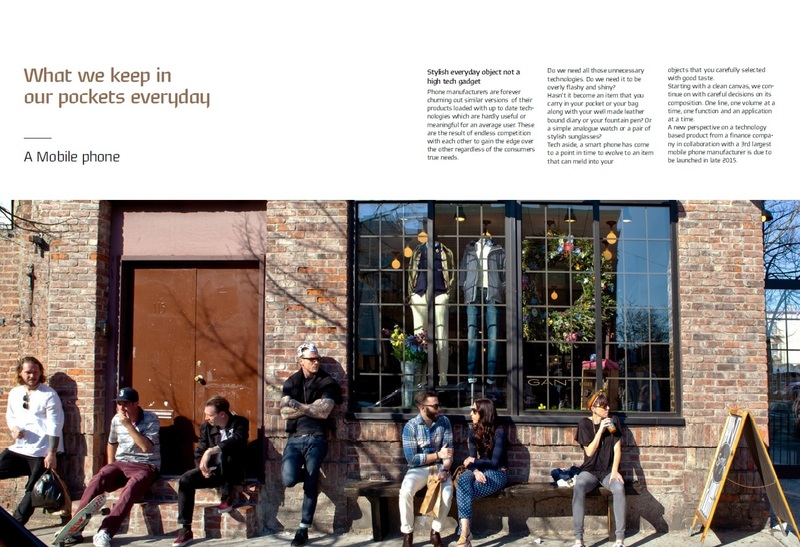 Is it to get mileage in the press ? 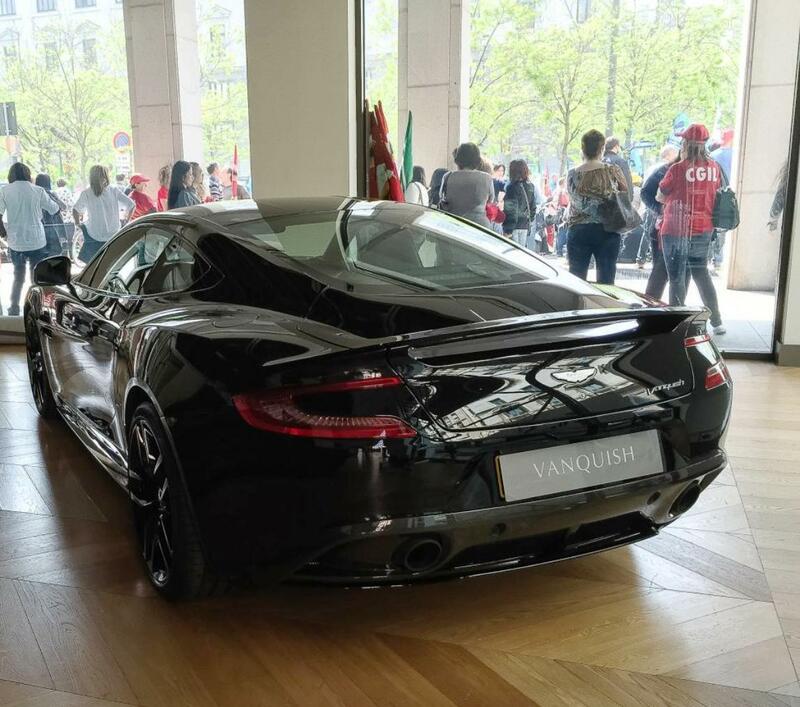 You hardly see any motoring journalists in Milan this week. 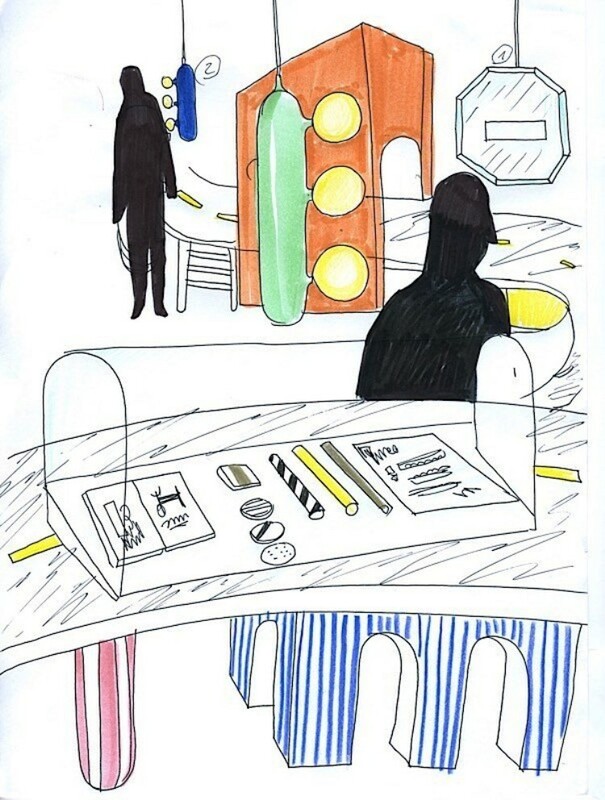 Or are they there because they want to attract new talent ? 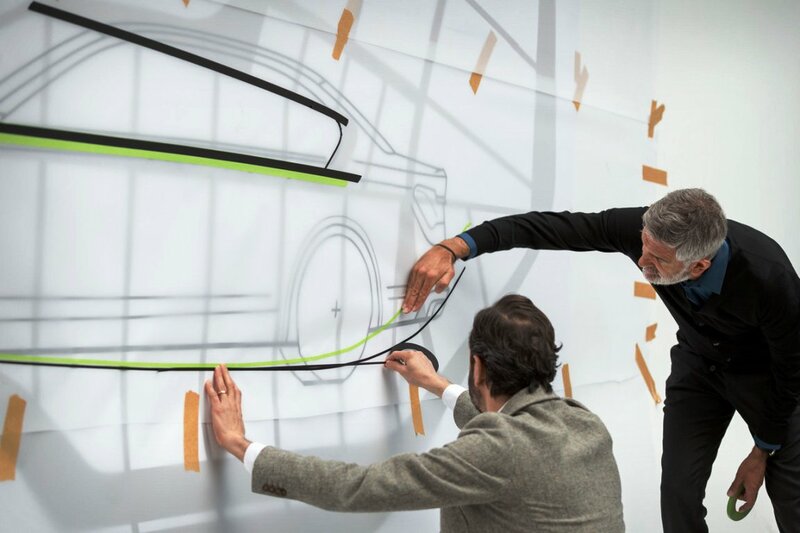 Young designers with fresh ideas are hard to find – Top auto designers usually attended the world’s best design schools – before they were scooped up by the car makers. 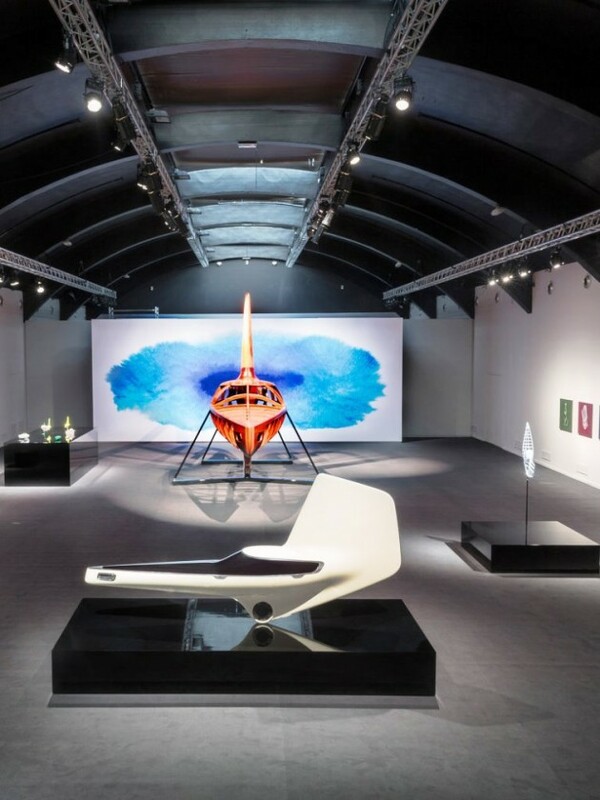 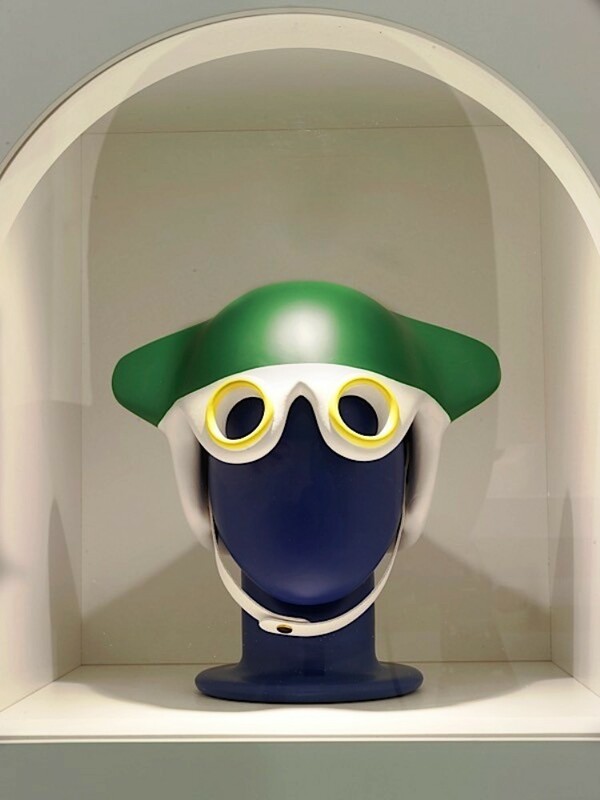 Whilst most of the time, their creativity shows up atop four wheels, the Salone allowed them to displayed their artistic creations to large audience of design afficienados. 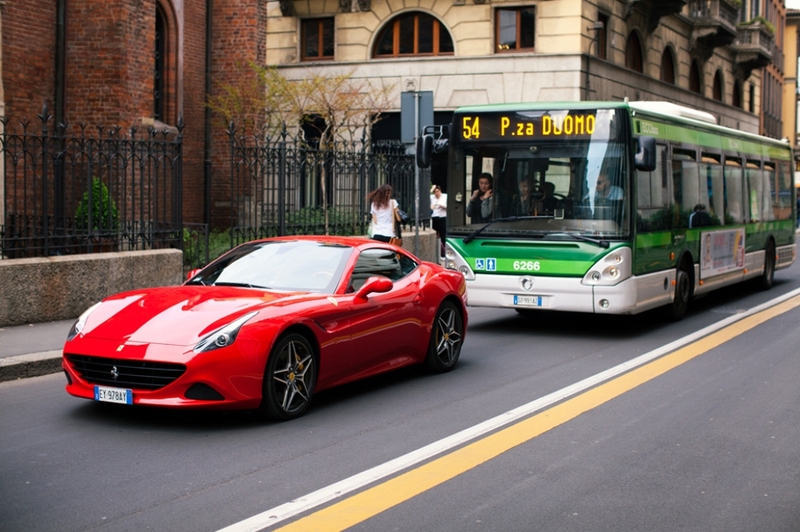 And so, as ever, it was a mixed bag from the car makers in Milan. 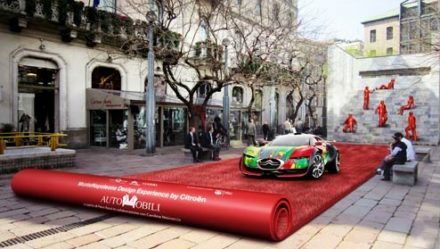 Some truly get it ( like BMW, Hyundai, Audi, Toyota, Ford, Mazda ) and understand that in order to have an authentic presence here they need to do something more than simply try to flog their wares and create something truly original that, hopefully, shows the creativity of its designers outside the world of cars. 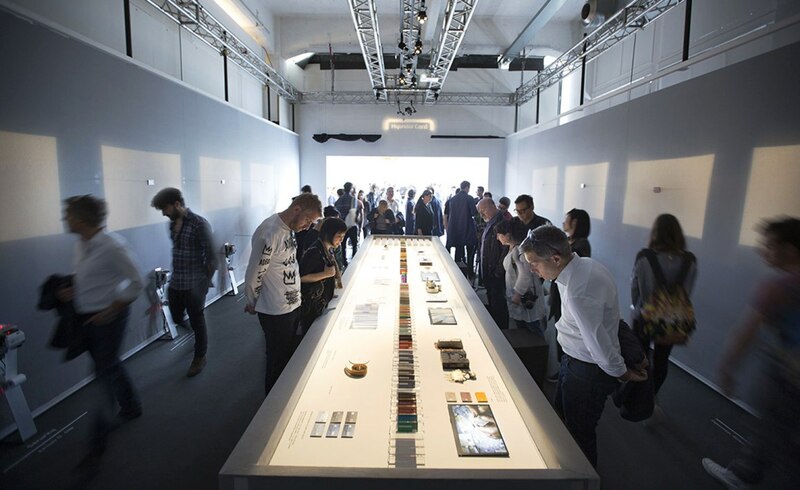 General Motors, with the industry’s longest design studio traditions has yet to discover the Salone Milan magic. 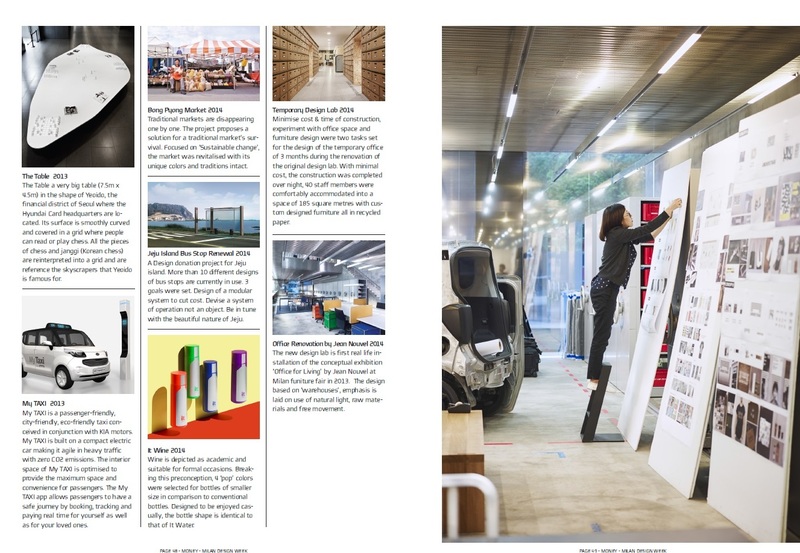 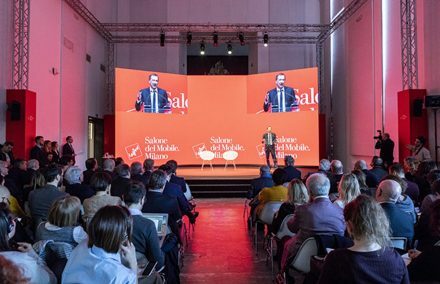 This year dedece ranked the participating Salone car manufacturers presentations in order of their impact / effort / concept development ……..
What they showed with their choice of collaborations – provides an insightful window into their philosophy. 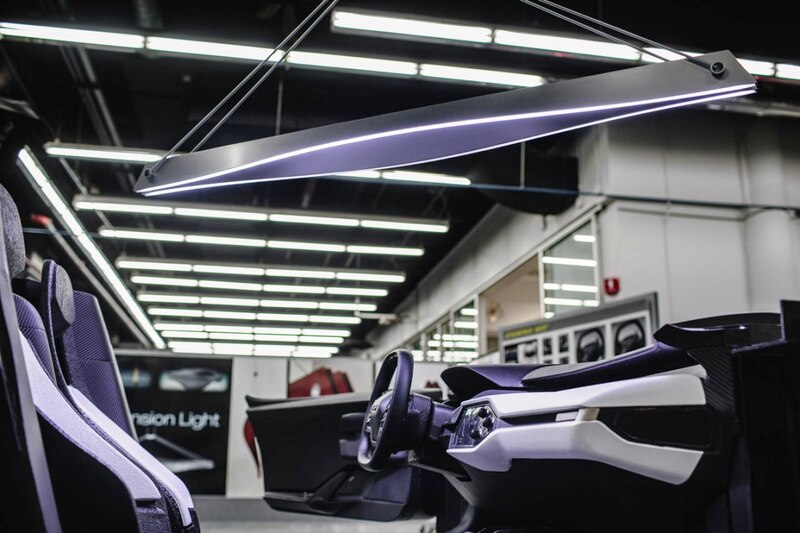 The BMW Group took on the theme of future mobility by engaging non-automotive designers in the dialogue. 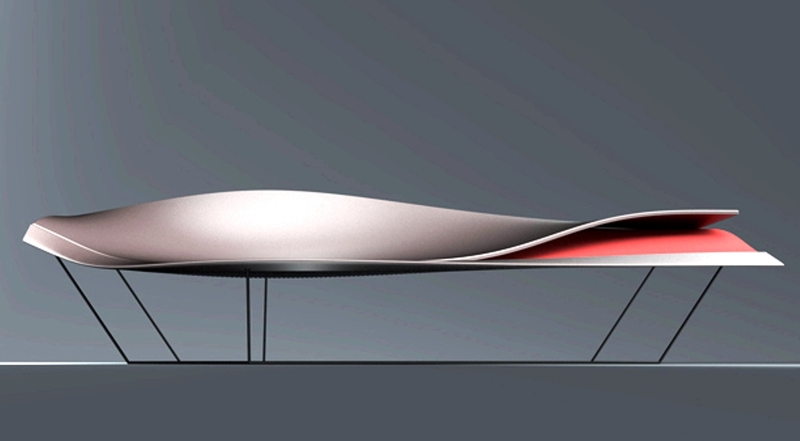 Spheres’ by Alfredo Häberli for BMW: – Spheres’ is a study into the values of future mobility on a conceptual level. 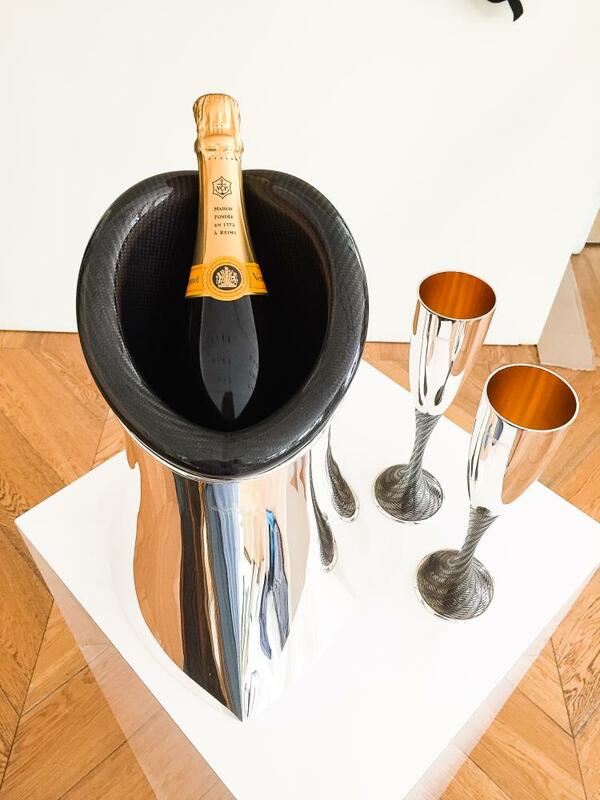 Alfredo Häberli works on the belief that ‘silence, space and time’ are what constitute luxury in the future – that it is beyond the material dimension. 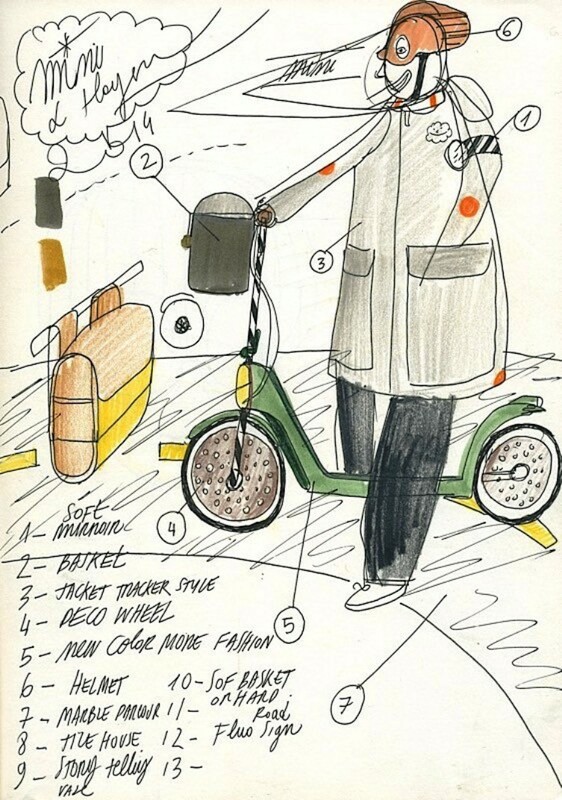 We are taken on a journey that begins with childhood memories, sketches and studies. 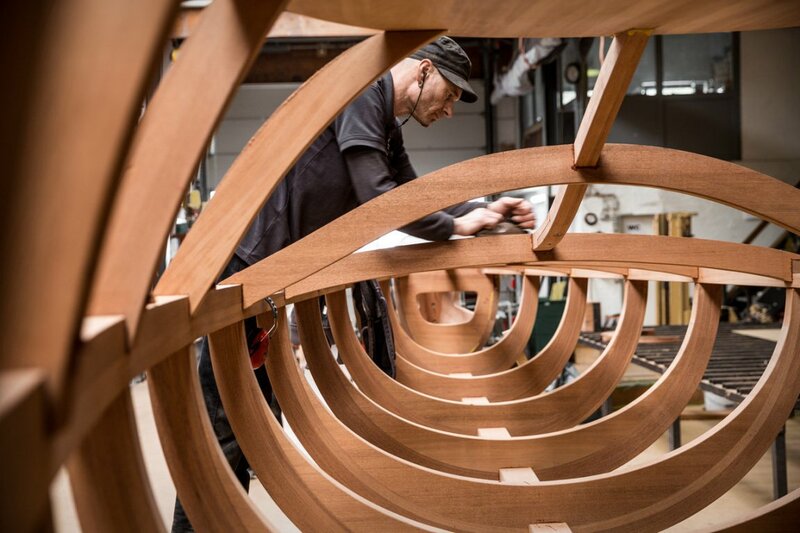 It ends with a large-scale model, a giant ten-meter teak sculpture that resembles the skeleton of an old ship discovered at the bottom of the ocean. 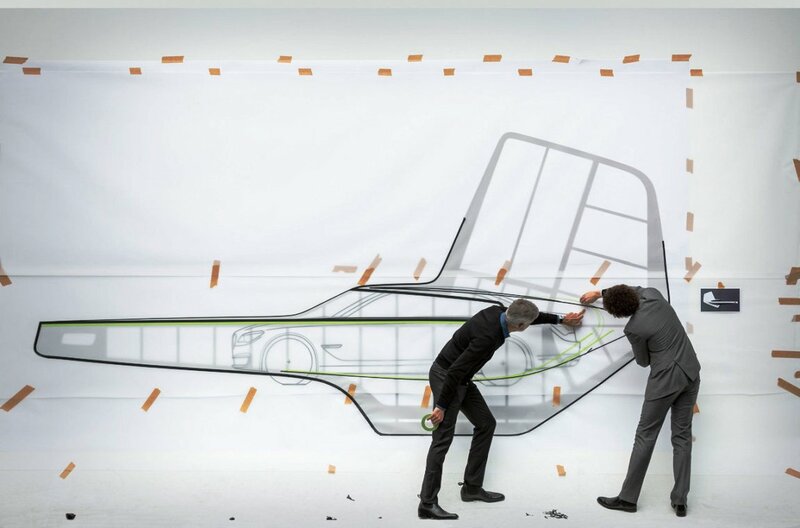 “Spheres” began as the speculative sketches of Alfredo Häberli, who eventually partnered with the BMW Design Team (headed by Karim Habib and Martina Starke) to produce his vision as a large-scale model. 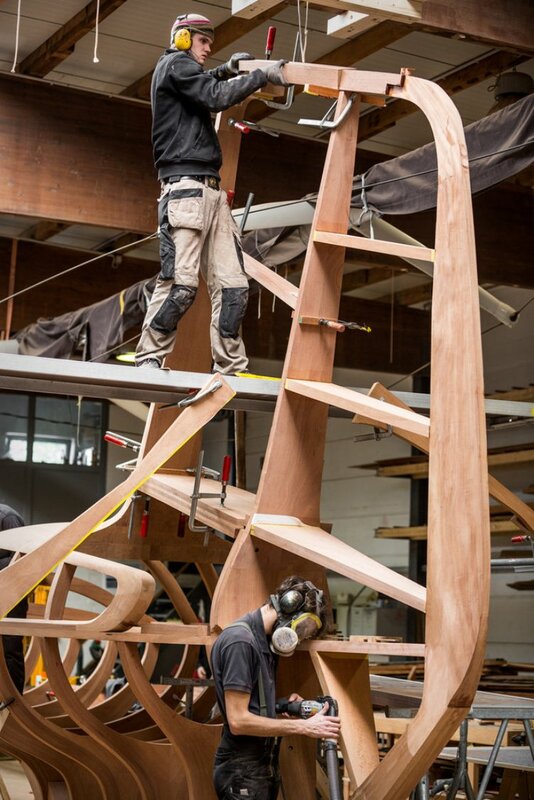 The installation was based on the BMW Design theme of “Precision & Poetry,” and its focus–which is divided into four thematic elements (Spheres, Dwell, Couch, and Vessel)–is a wooden ribbed model that measures 30 feet in length by 12 feet in height. 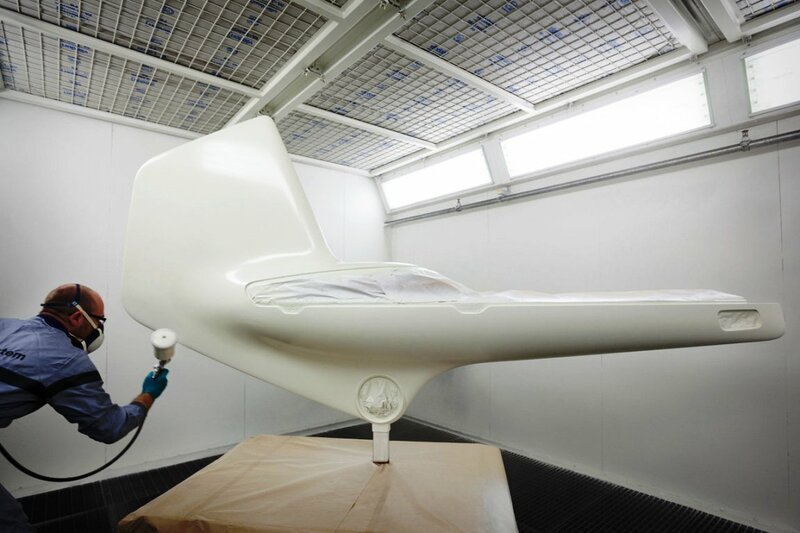 “Through the abstract sculpture of a vehicle that projects the luxurious gliding of a sedan in the future, my vision becomes three-dimensional,” stated Häberli. 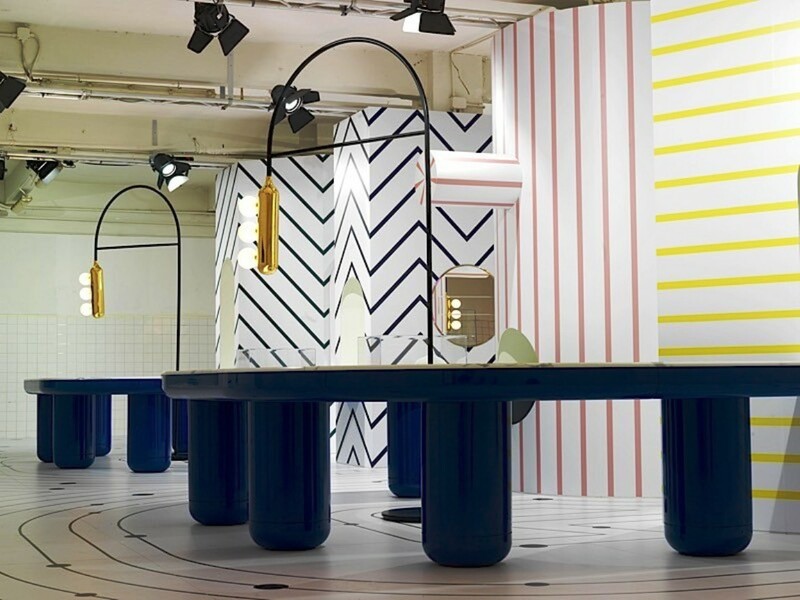 It took Häberli a full six months to conceive of, design, and build this installation, which includes multiple sculptures, such as his “Take a Line for a Walk” seats designed by Häberli to complement the theme of the future of transportation. 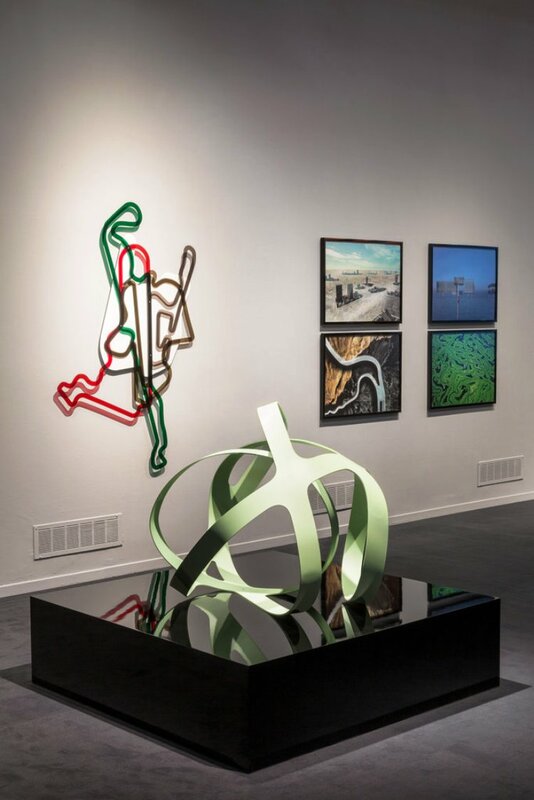 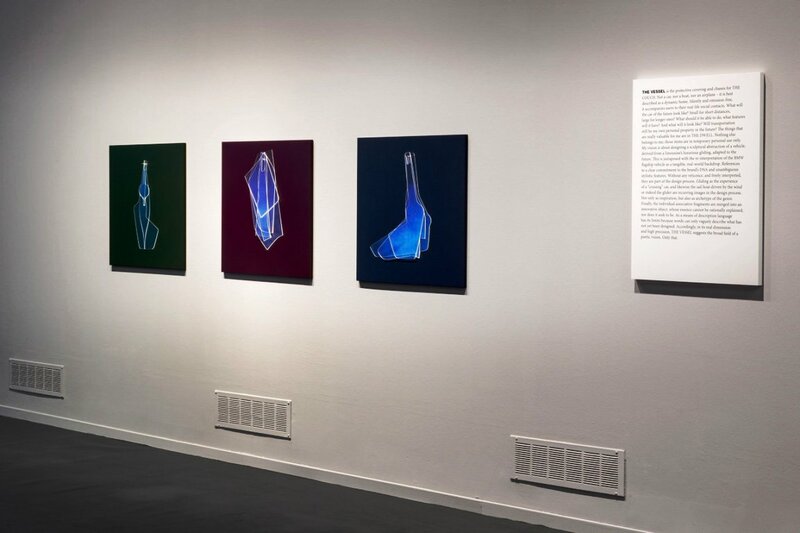 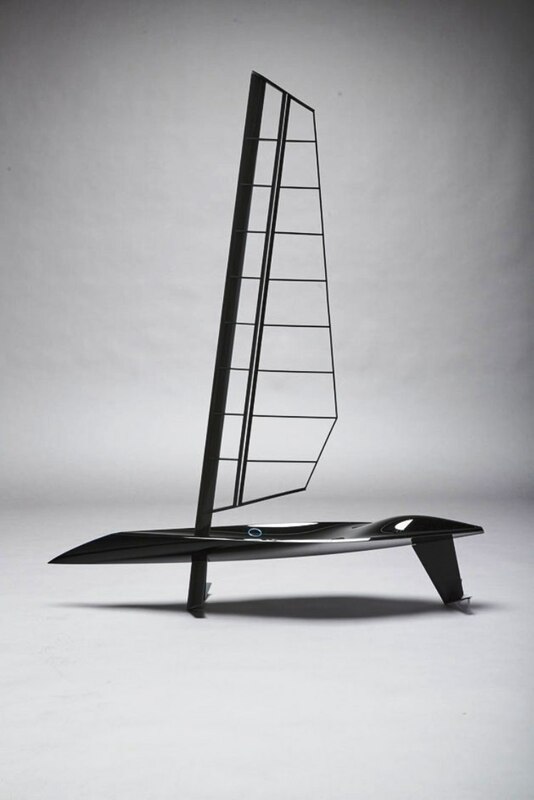 The artist uses automotive design tools to crate new geometrical shapes to explore high-tech types of luxury, ones dependent on space and time. 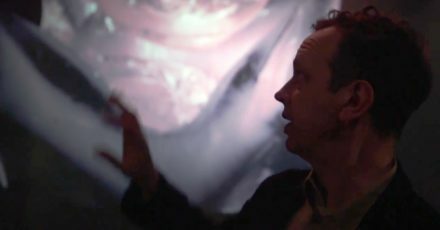 Häberli refrains from dictating a single solution. 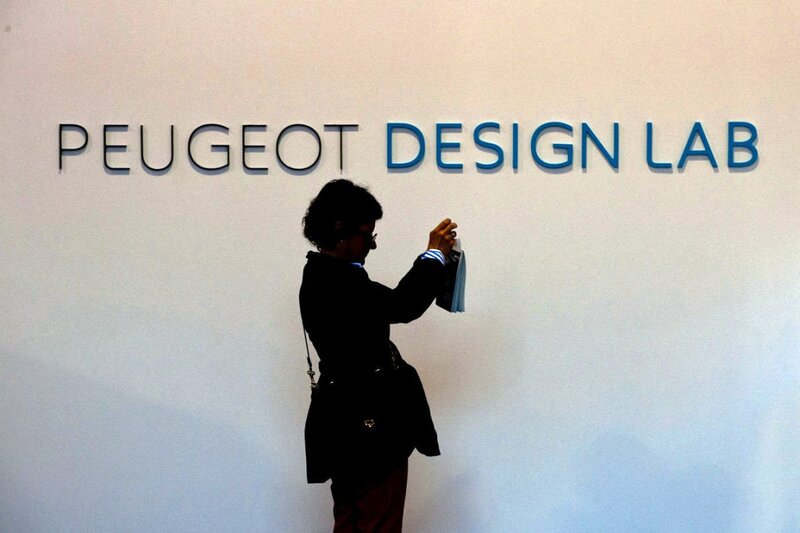 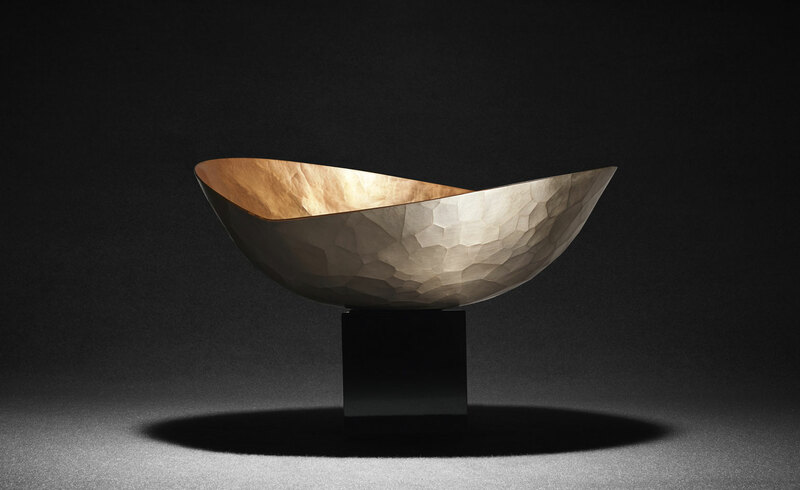 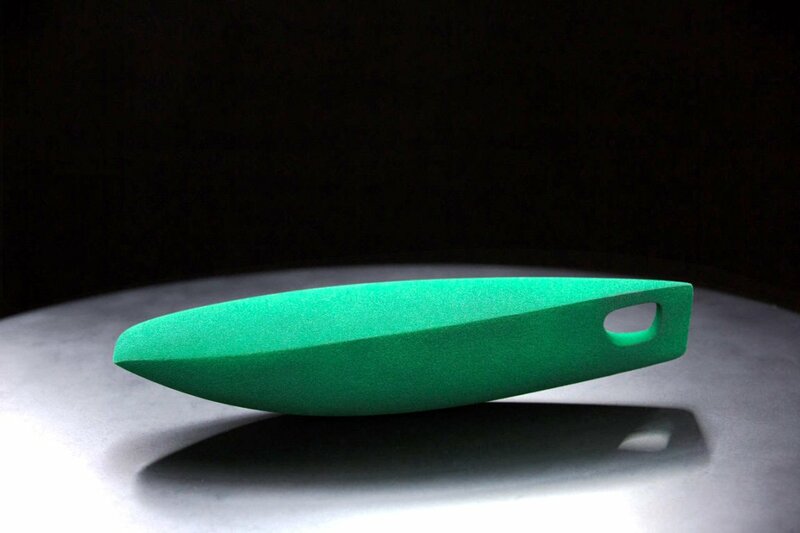 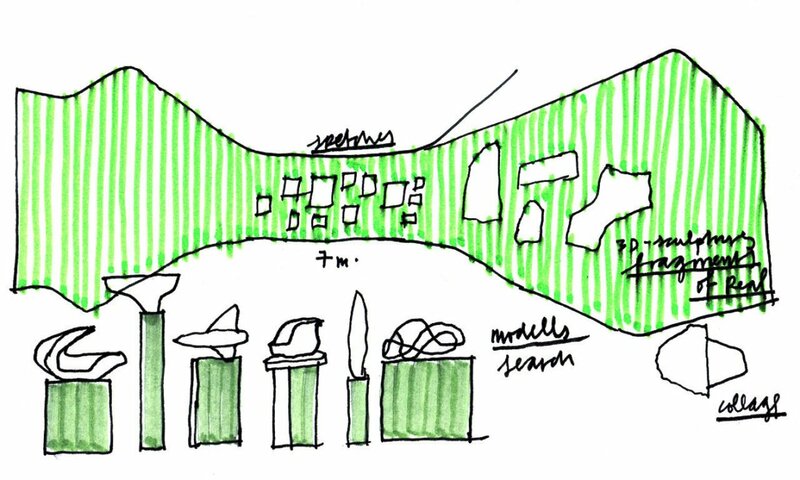 Instead the designer examines the vessel, architecture and urban planning. 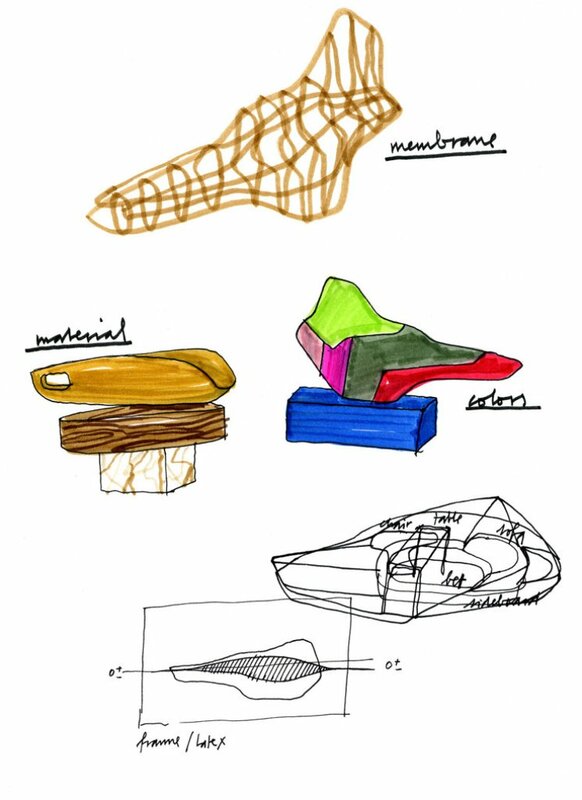 This unusual but ingenious construction reflects on the future of mobility at a conceptual level. 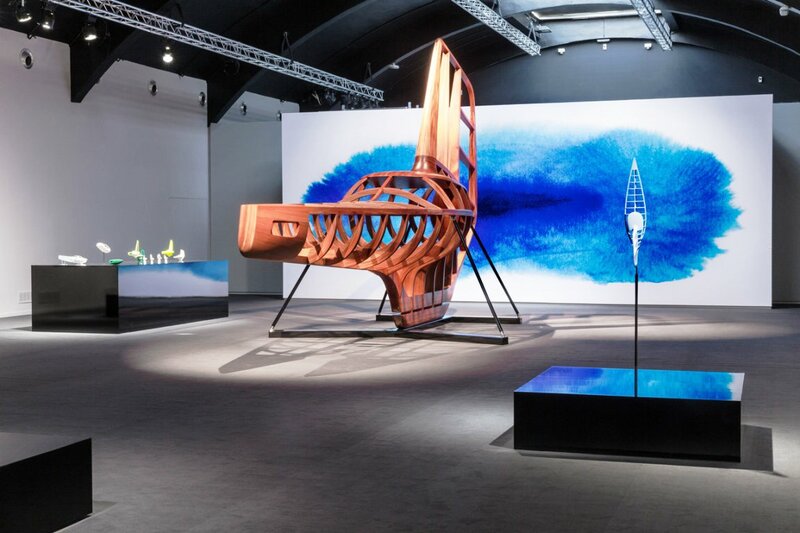 “Through the abstract sculpture of a vehicle that projects into the future the luxurious sail of a saloon, my vision becomes three-dimensional,” said Haberli, which thus covered BMW Design leitmotif “Precision and Poetry”. 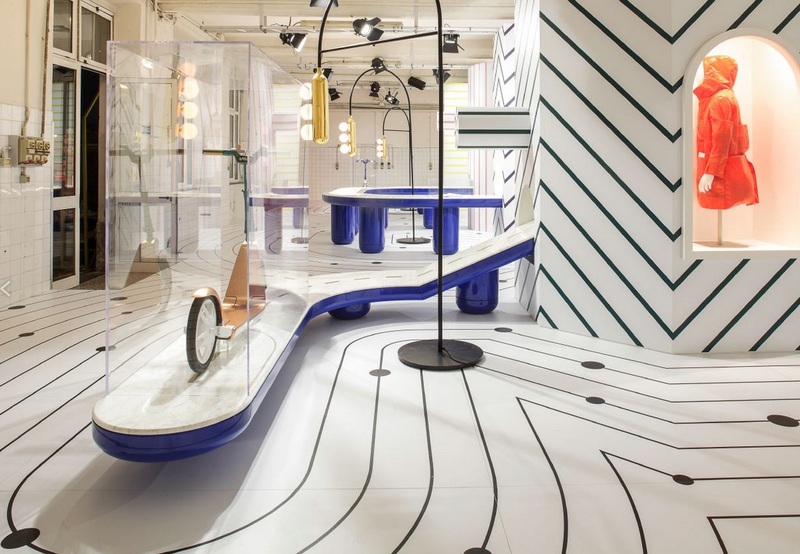 The installation is divided into four thematic units (from “Spheres” to “Dwell” to “Couch” and “Vessel”) and calls for “a custom trip into the future of mobility,” etc. 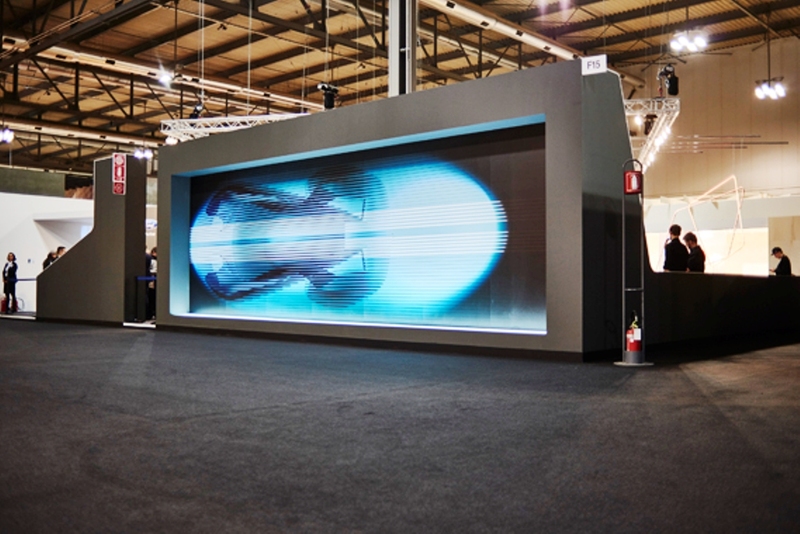 Häberli worked closely with the team at BMW to unravel a range of scenarios that address driving in the future. 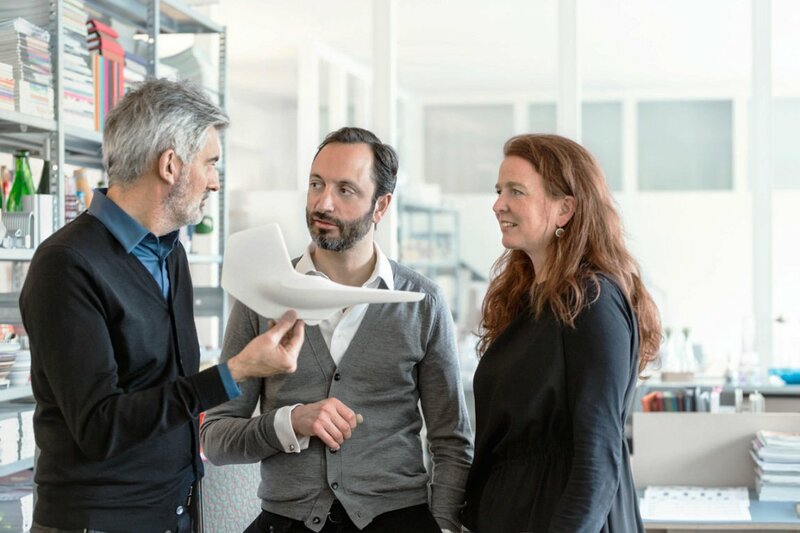 It was an inspiring study of how we could move from place to place – of our relationship with driving once the car becomes an autonomous object. 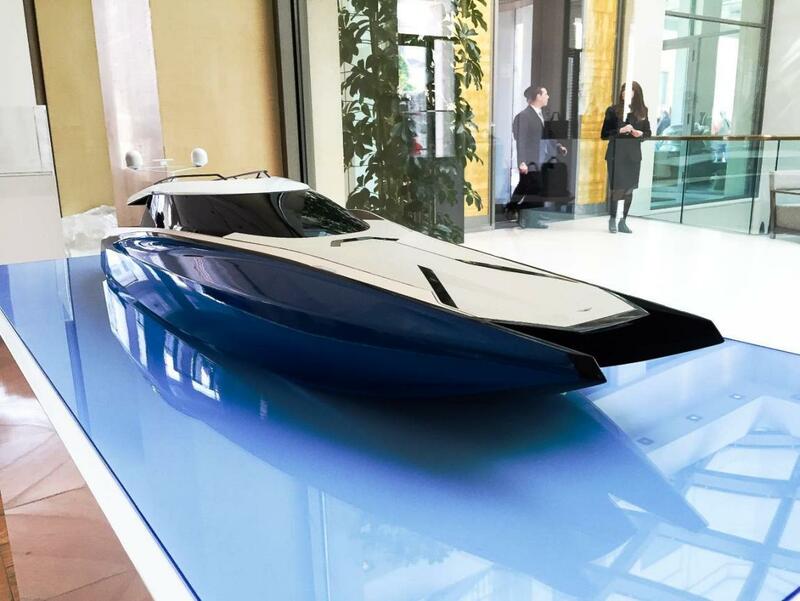 The display here addresses mobility in a much wider context, taking on the vessel, road structures, architecture and city planning. 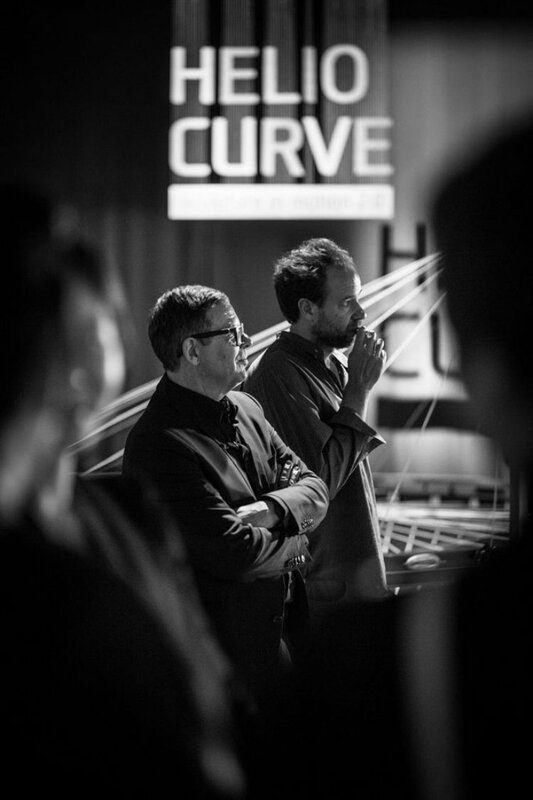 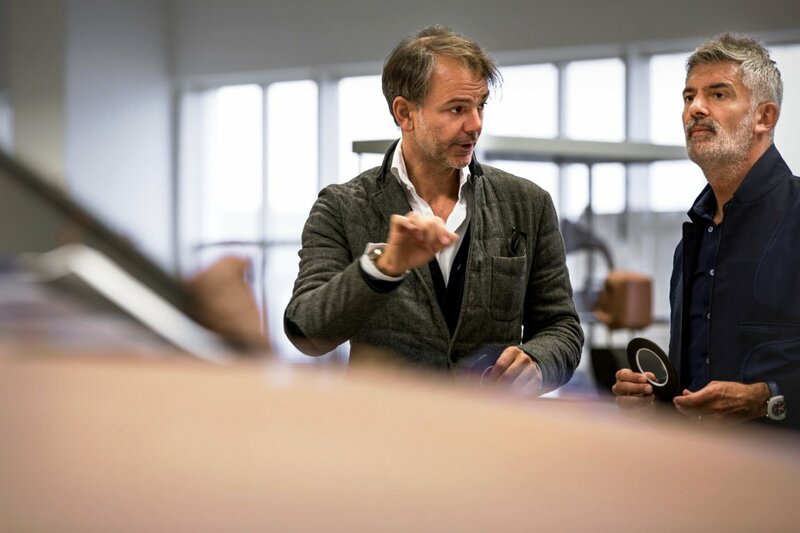 “I always enjoy philosophising with Alfredo on design and mobility, and I’m delighted to see these ideas now taking shape in an installation as well,” said Adrian van Hooydonk, Senior Vice President BMW Group Design. 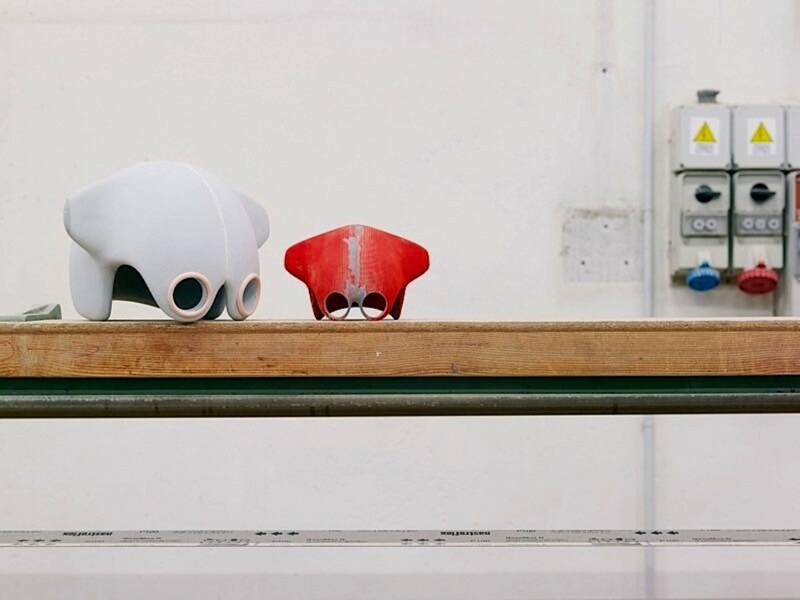 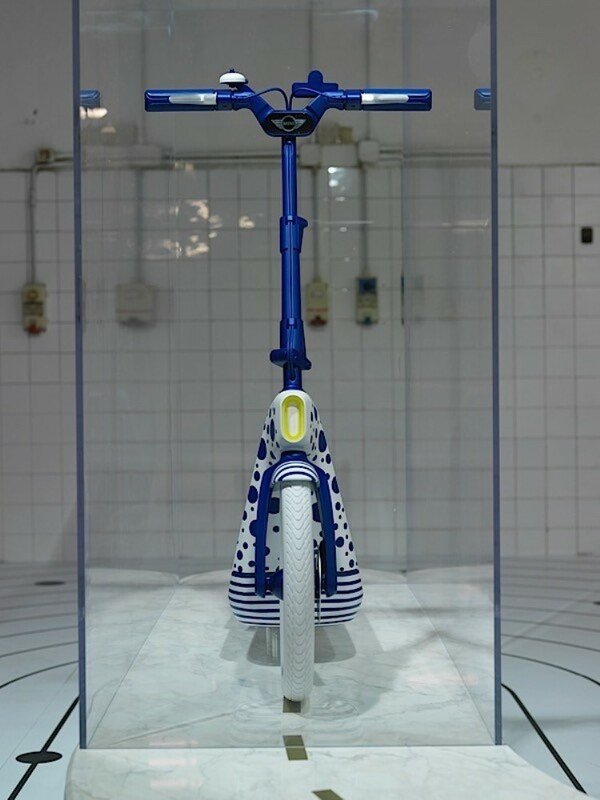 Spanish artist and designer Jaime Hayon embellished Mini’s latest CitySurfer with bold colours and textures, displaying the foldable scooter concept in a fictional city of marble roads and oversized road lamps. 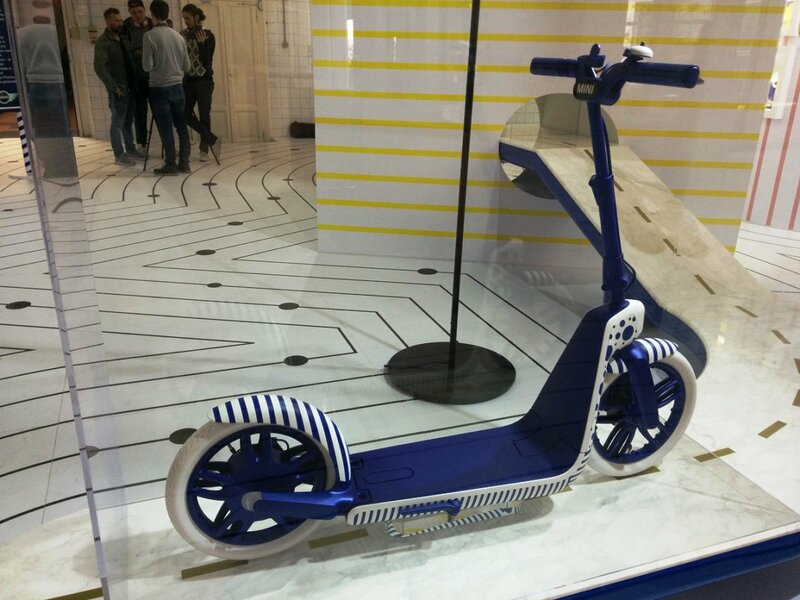 Originally shown at the Los Angeles Auto Show, the CitySurfer, which the maker developed with Spanish designer and artist Jaime Hayon, is small kick scooter with a back-up electric drive. 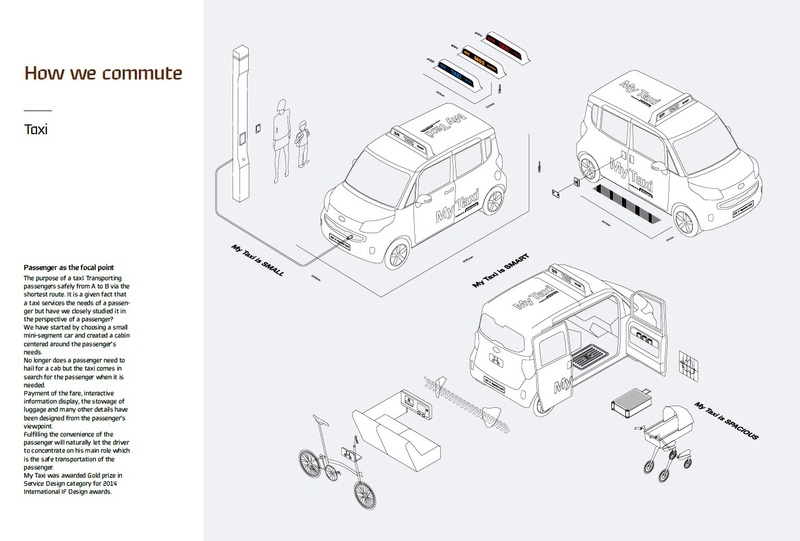 Designed to fold up into a package, the 40-pound CitySurfer will fit into the cramped cargo compartment of a four-wheeled Mini – or in a cargo compartment on a bus, train or even an aircraft, perhaps — letting a rider take it just about anywhere. 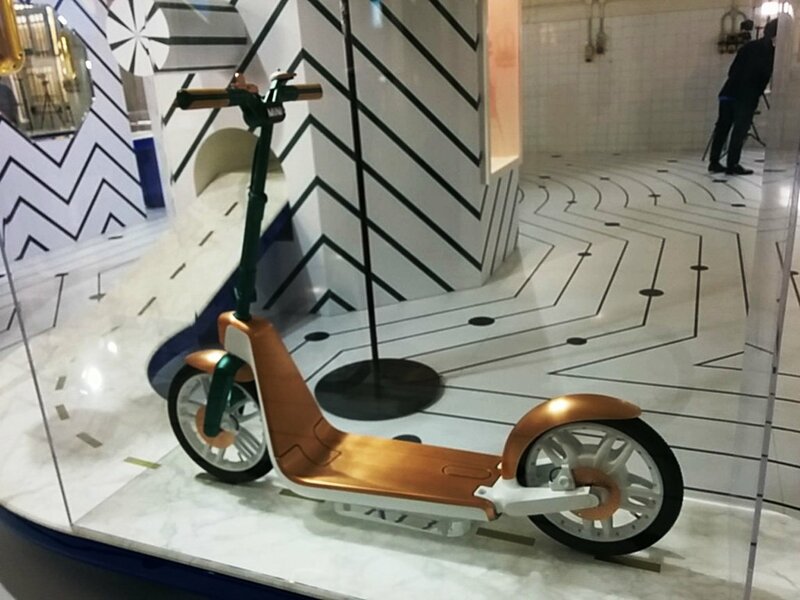 Hayon adds colour and texture – and a great dose of fun – to Mini’s small, foldable electric kick scooter concept. 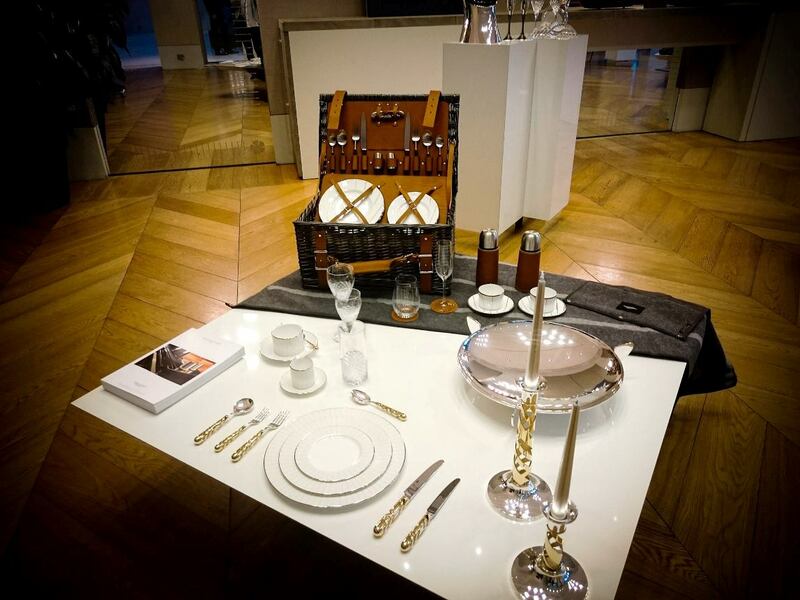 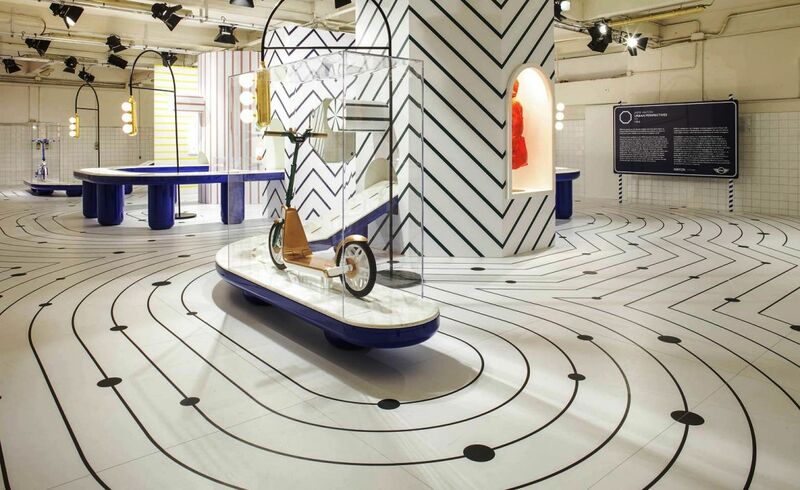 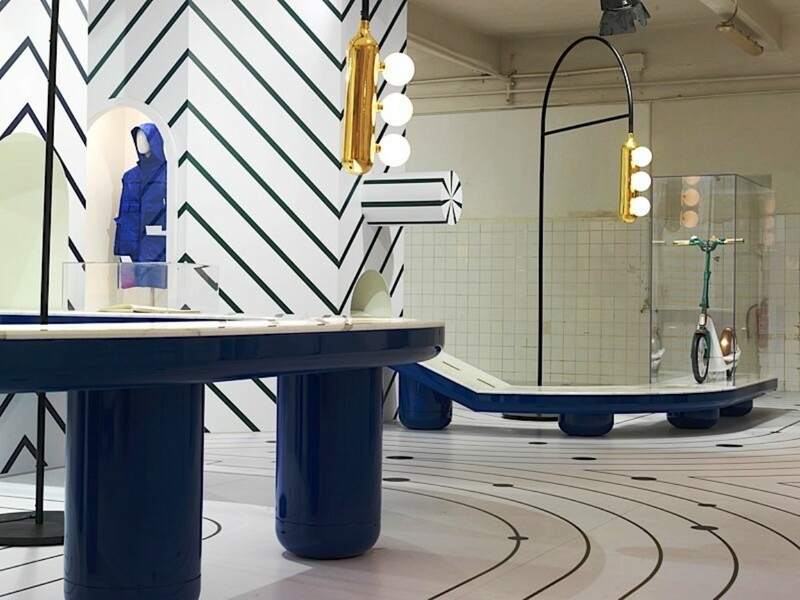 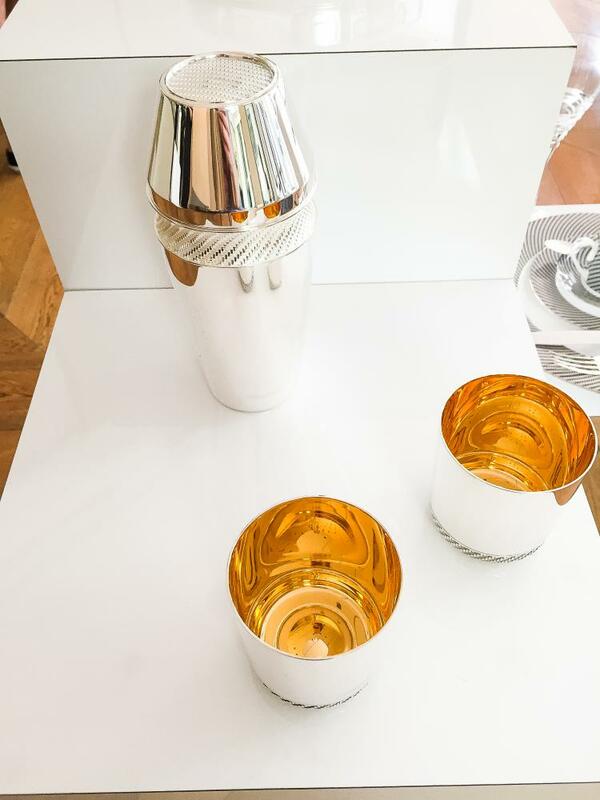 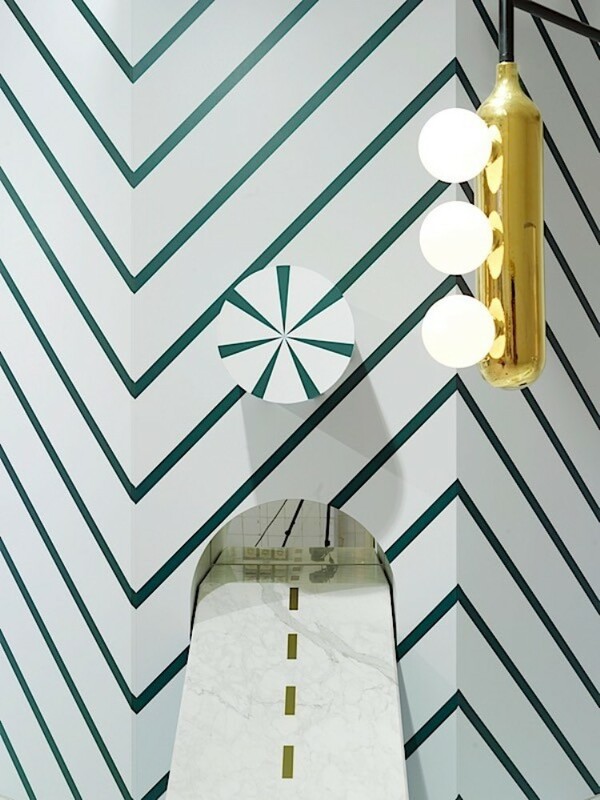 For Hayon, materials had to be ‘noble’, so we have roads of marble, with furniture and ceramic objects. 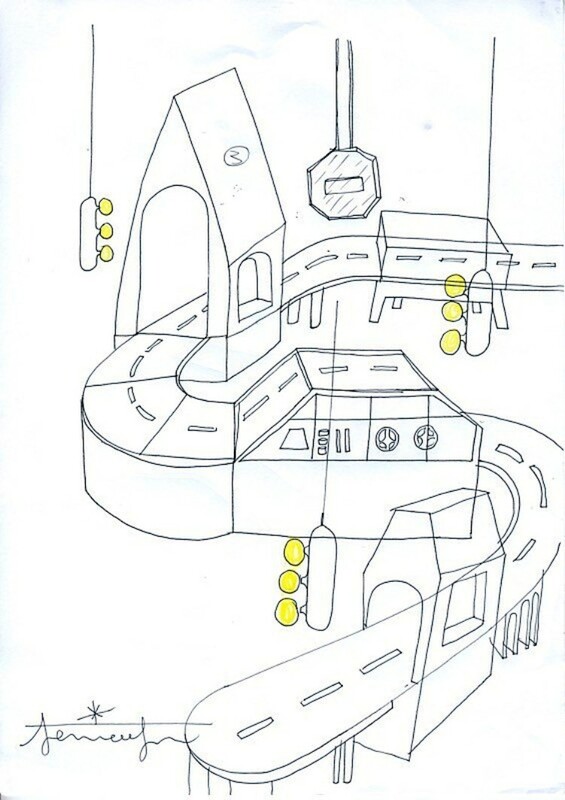 This is what the artist calls his ‘urban jungle’. 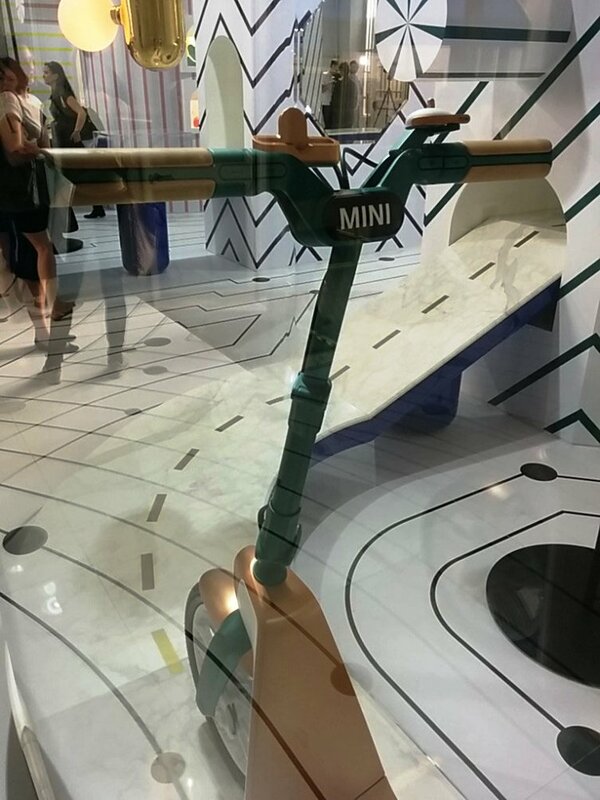 All this, however, without forgetting the true essence of MINI: thanks to its weight of about 18 pounds and folding structure, the scooter you can replace without difficulty, as it happens in the luggage compartment of the new 5-door MINI. 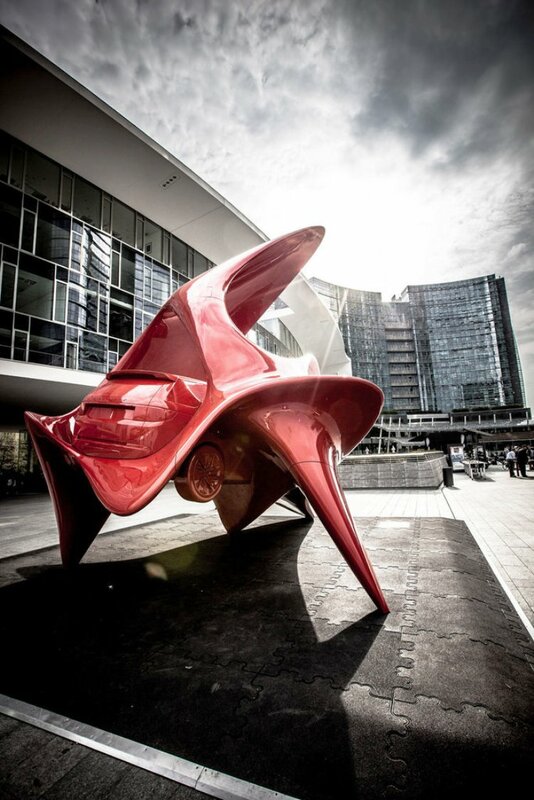 Moving beyond its first project, ‘Sculpture in Motion’, where 12,000 translucent spheres acted collectively as a screen occupying 1,000 square meters, the second part of Sculpture in Motion – Helio Curve – adds a breath of life to the Salone, as Hyundai’s design philosophy is reinterpreted in natural flow and energy. 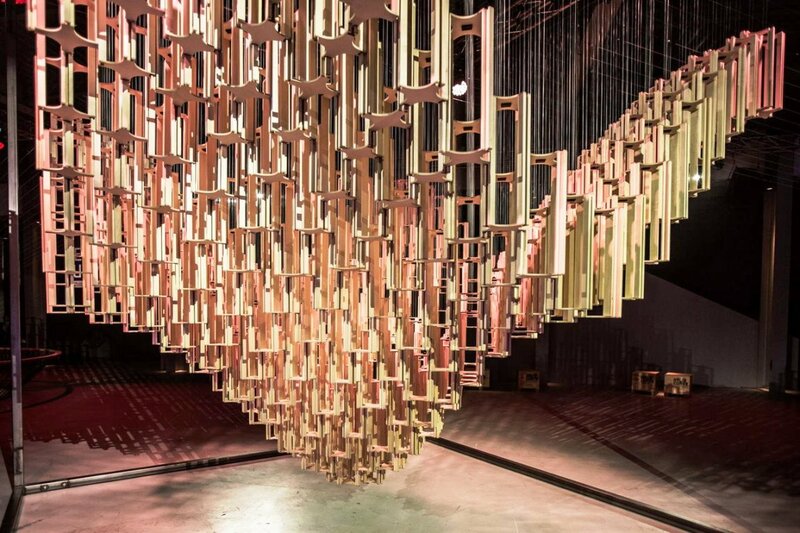 This collaborative art work of Californian kinetic artist Reuben Margolin and Hyundai Motor Design Center, celebrated the beauty of continuous movement of the ‘living form’; how the way ‘movement of motion’ takes ‘tangible’ form while still retaining its natural energy and movement. 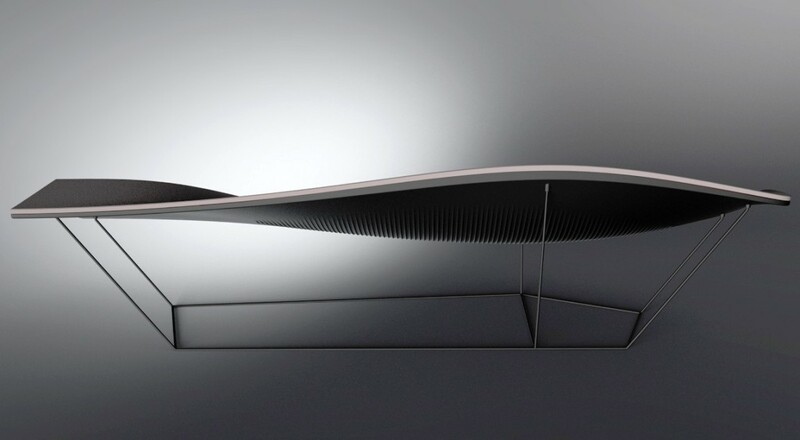 The art work gives expression to the vitality, harmonious unity of inter-connectivity of the natural world reflecting Hyundai Motor’s unique design philosophy, ‘Fluidic Sculpture’, where the design process is always adaptive, flowing and inspired by nature. 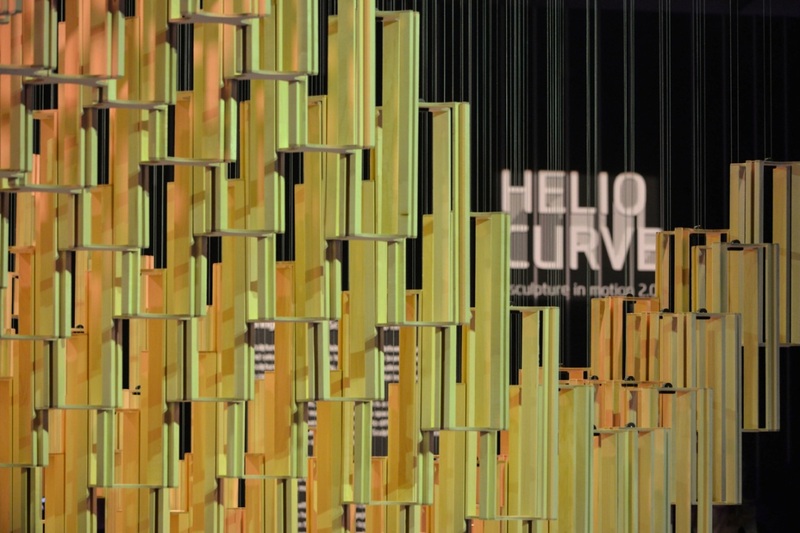 Helio Curves is a kinetic installation, that celebrates the bond between the fluidity of the movements of nature and the automotive world. 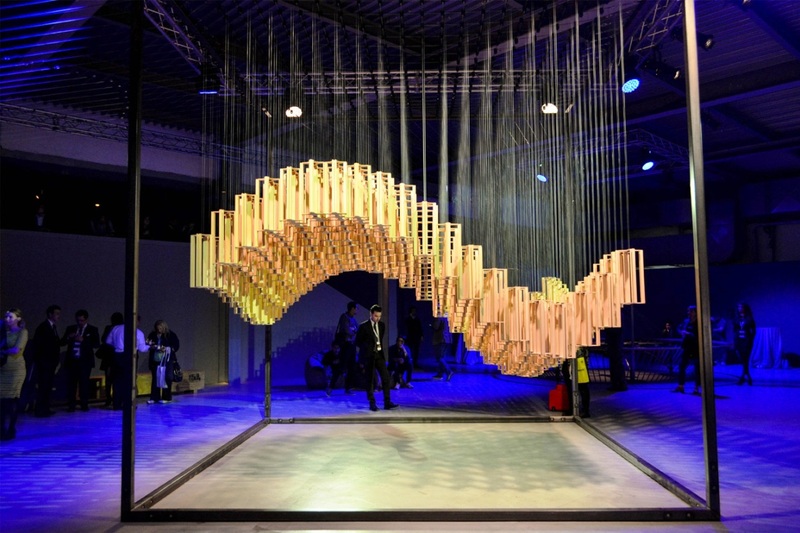 Helio Curve recreated the movement of an ocean wave by suspending 400 open-celled tongue-and-groove wooden blocks within a five-meter cube, each block linked by string to an electrically-powered metal drive. 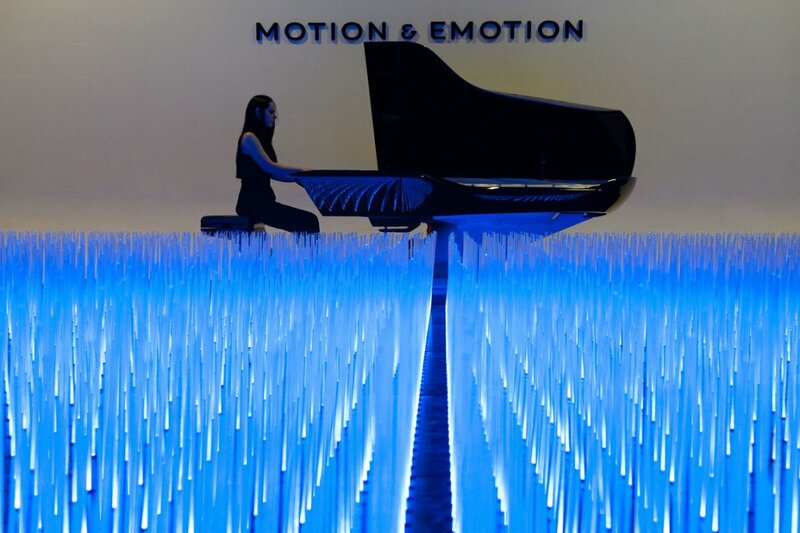 The individual blocks appear to be connected to form a wave over 3m high, which ebbs and flows in a continuous rhythms of ‘living motion’ that never repeats, highlighting the variability and harmonious flow of organic movement – and celebrating movement itself as an art form. 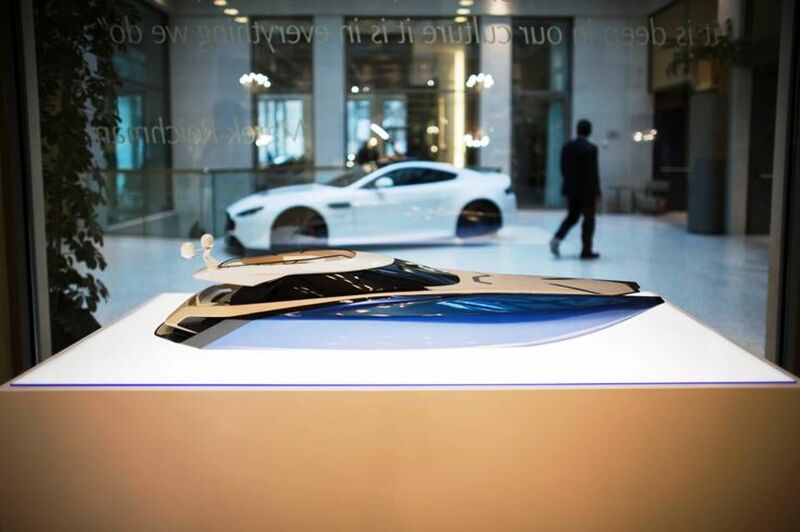 “Sculpture in Motion 2.0-Helio Curve” underlined the commitment of the Korean Hyundai brand in the continual search for shapes not only functional, but also satisfying for aesthetics. 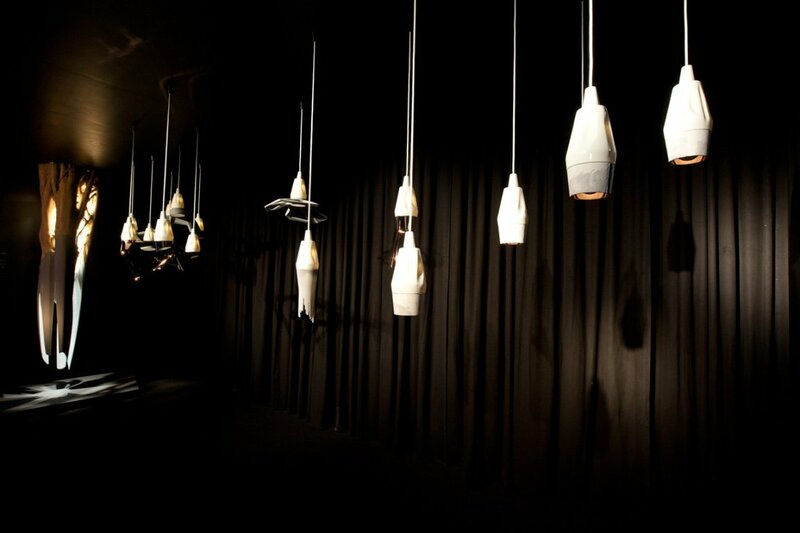 The work consists of a mix of lights, sounds and interactive media used to generate 3D images. 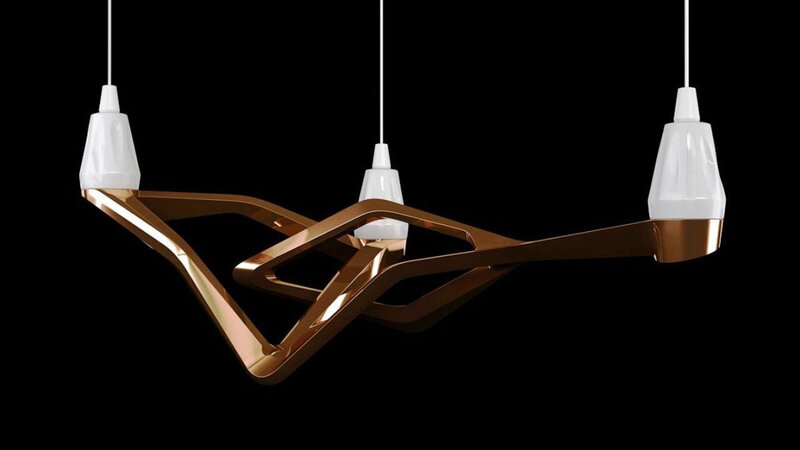 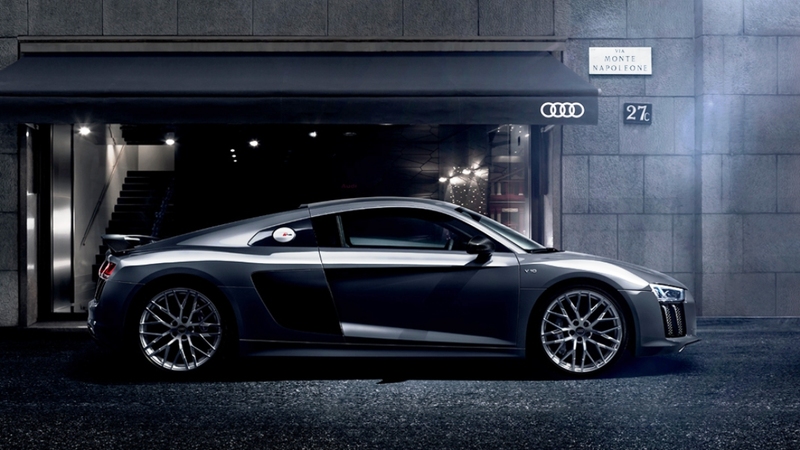 The room lighting, casts a huge fluidic shadow, enhancing the experience even further. 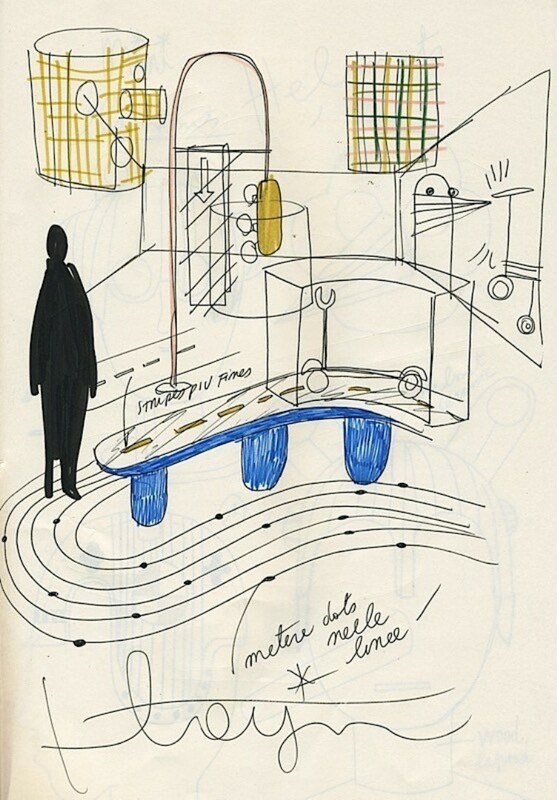 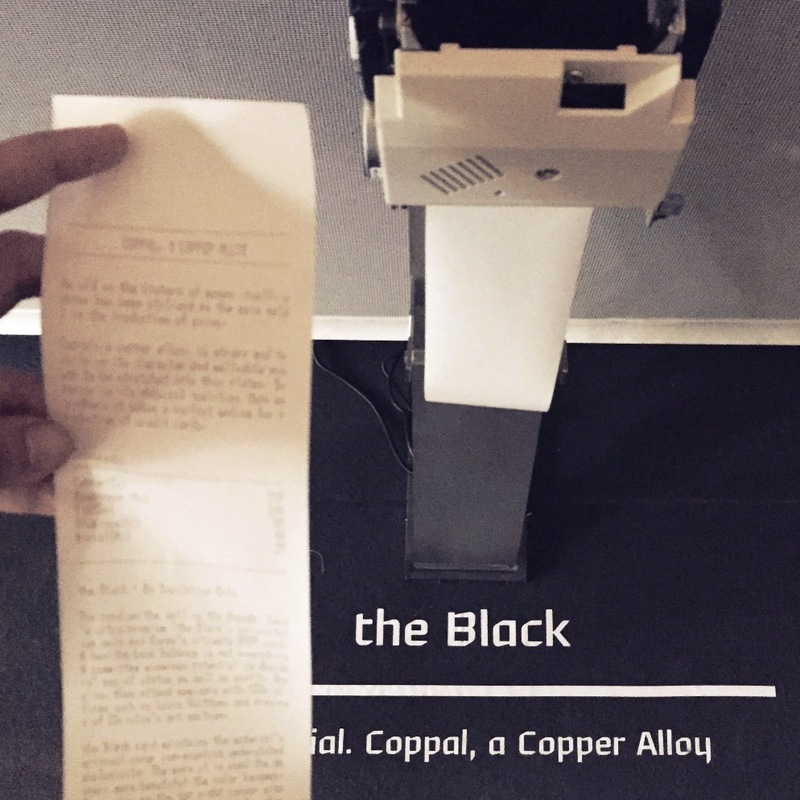 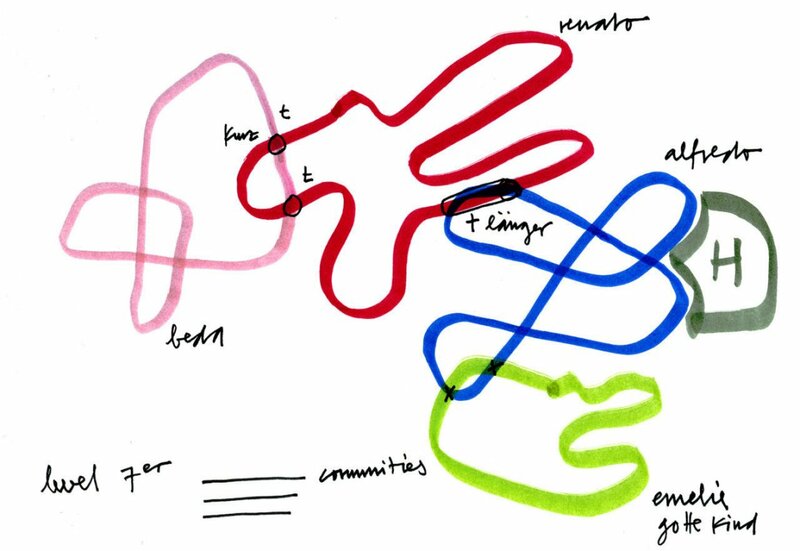 Margolin describes the process of creating its wavy installations as the Act of “orchestrating the movement“, for example by regulating the interaction between different pulley systems in which each element plays an important role. 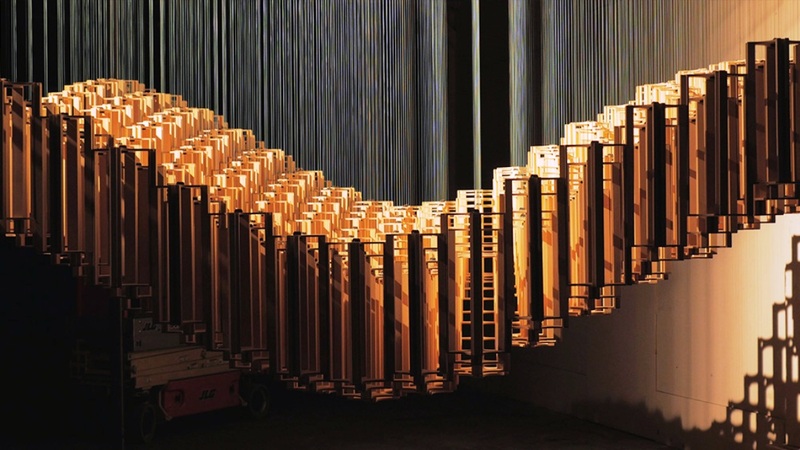 In order to give life to a fluid motion, the various chain reactions of the structure should succession smoothly and every single item must perform his task without errors. 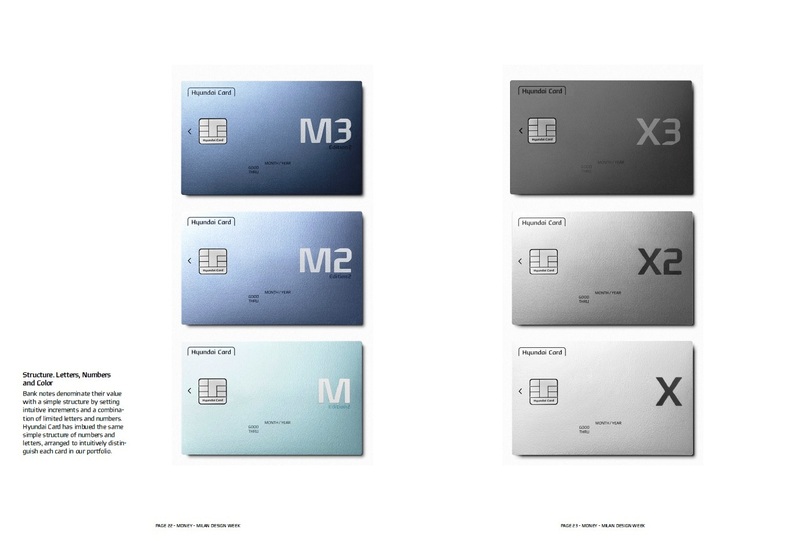 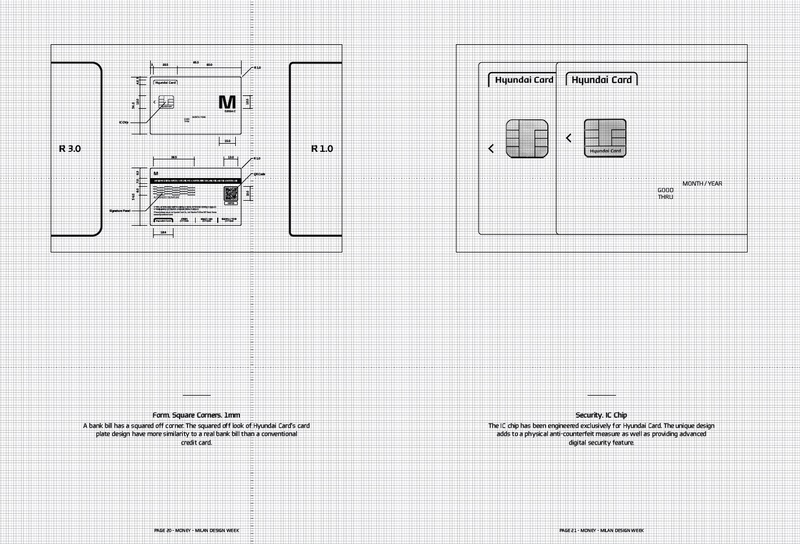 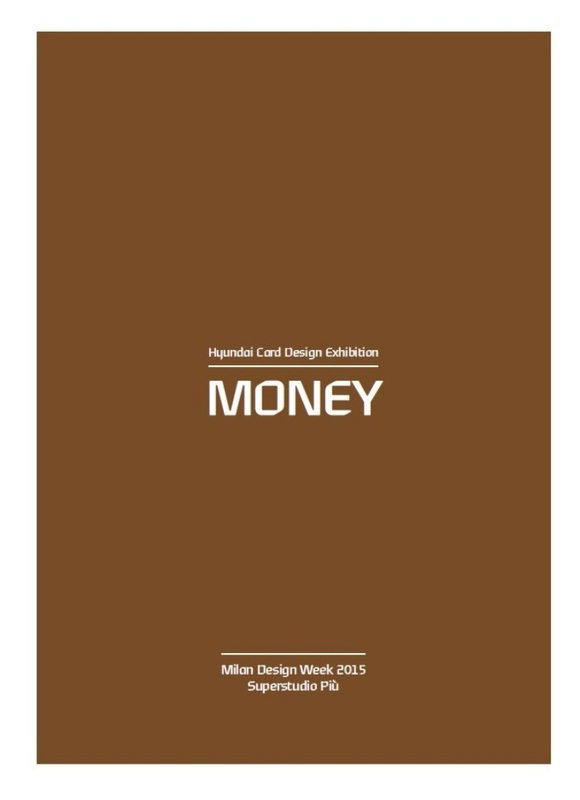 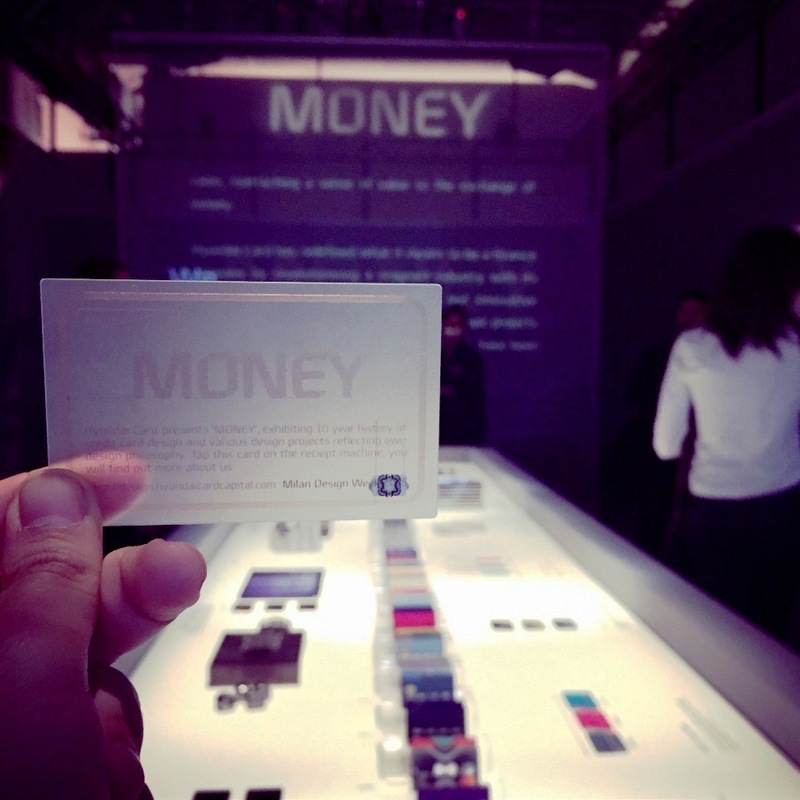 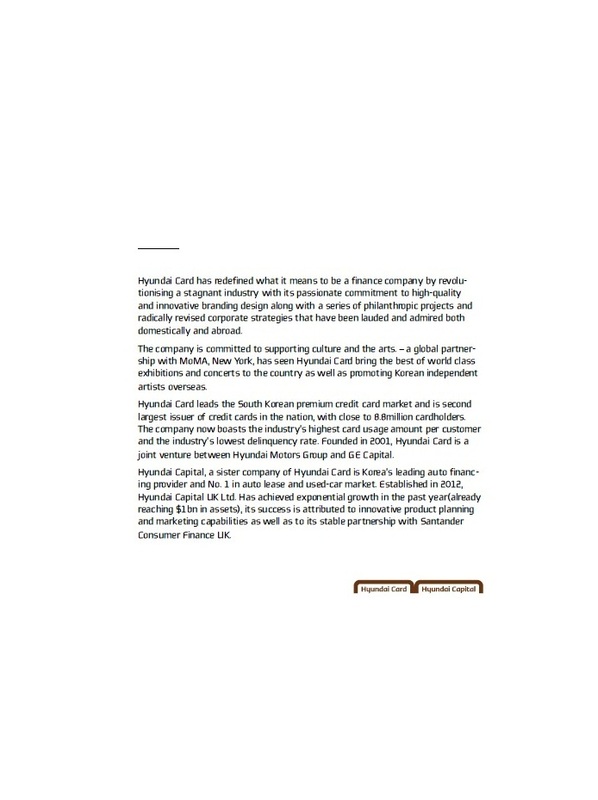 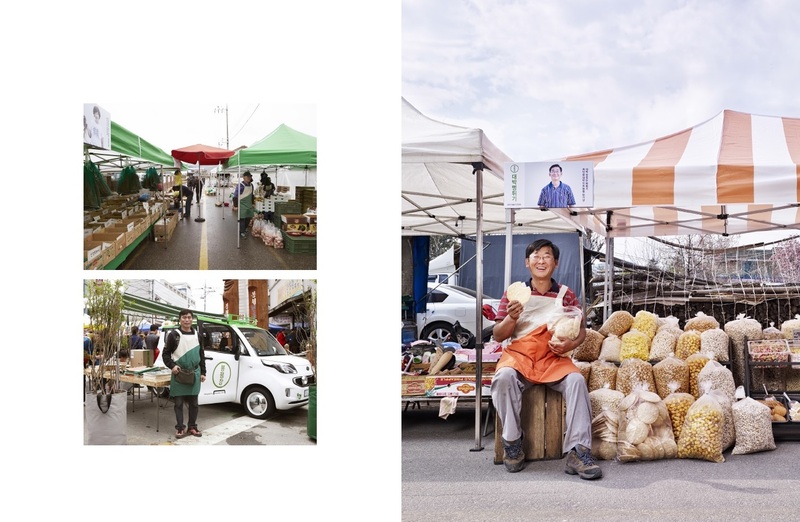 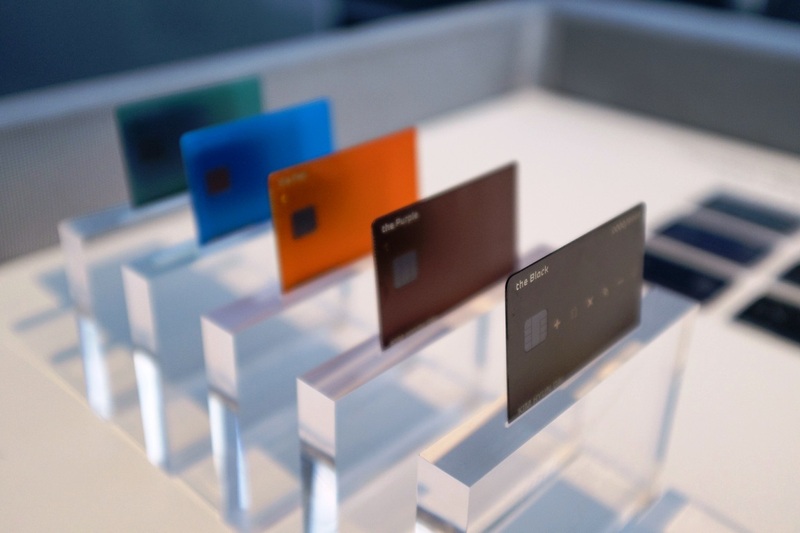 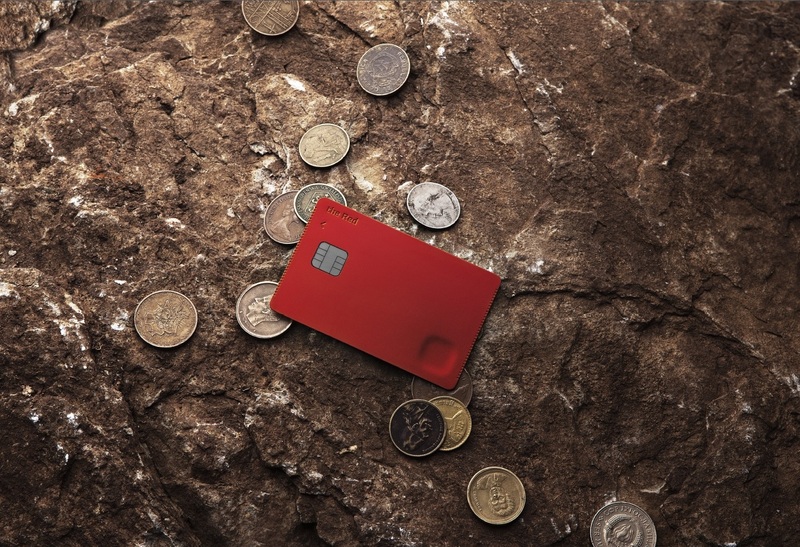 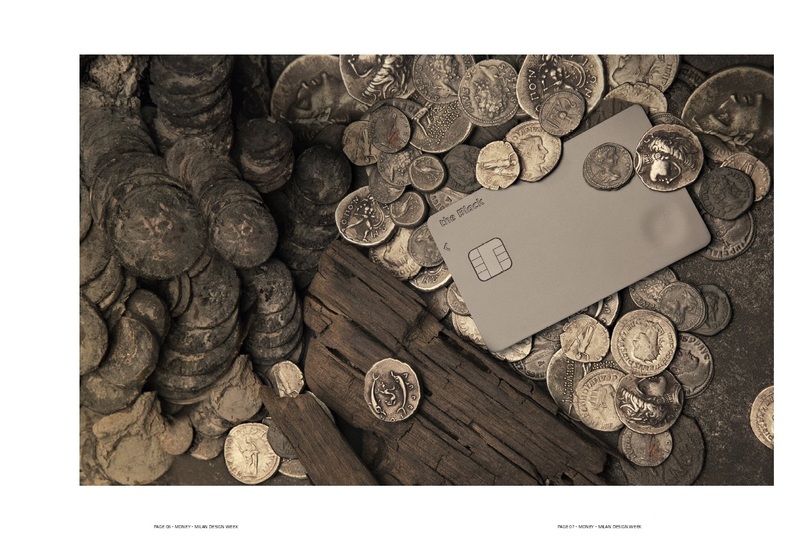 Here the company’s financial arm Hyundai Card unveiled Money designed to show how a credit card can express an individual lifestyle. 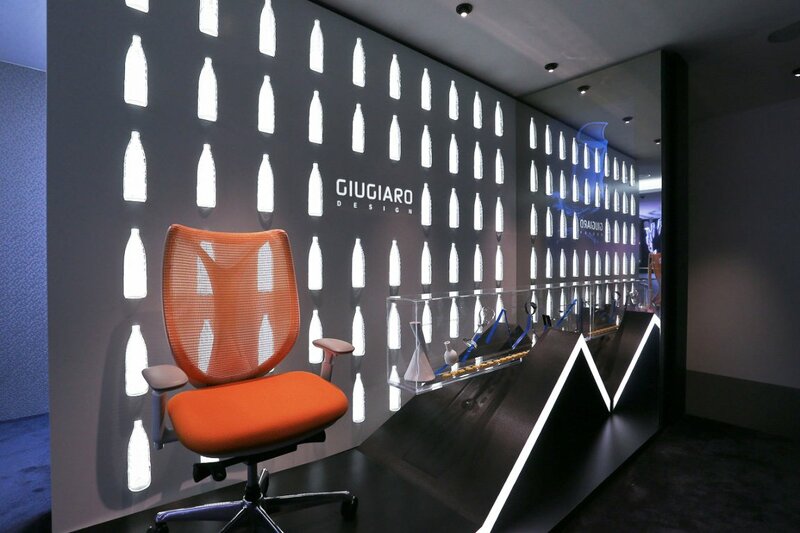 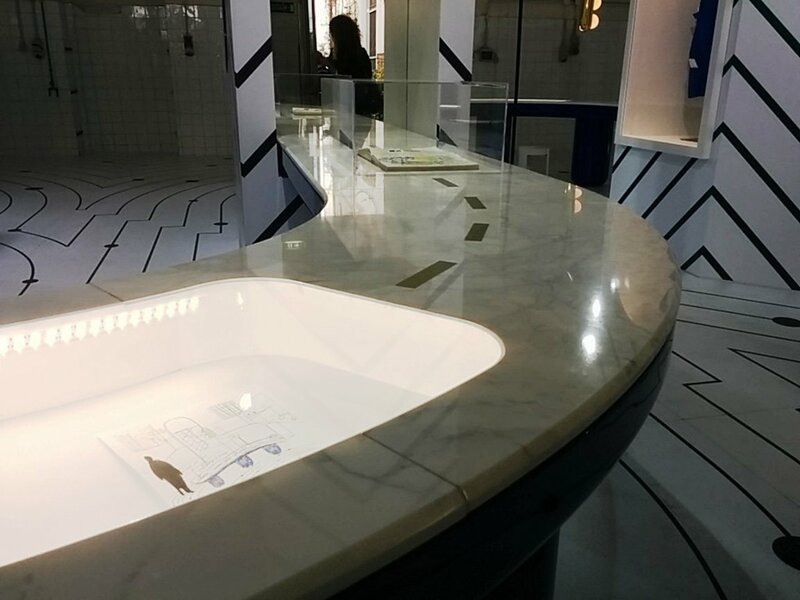 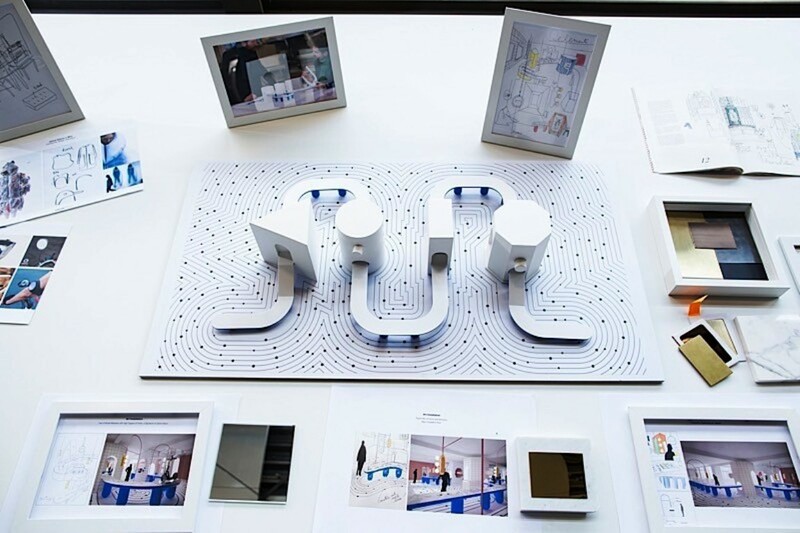 Ford really wants to be taken seriously as a design company—their most recent presence at Milan Design Week muscled some serious talent to bring this point home, with interactive installations and conceptual designs. 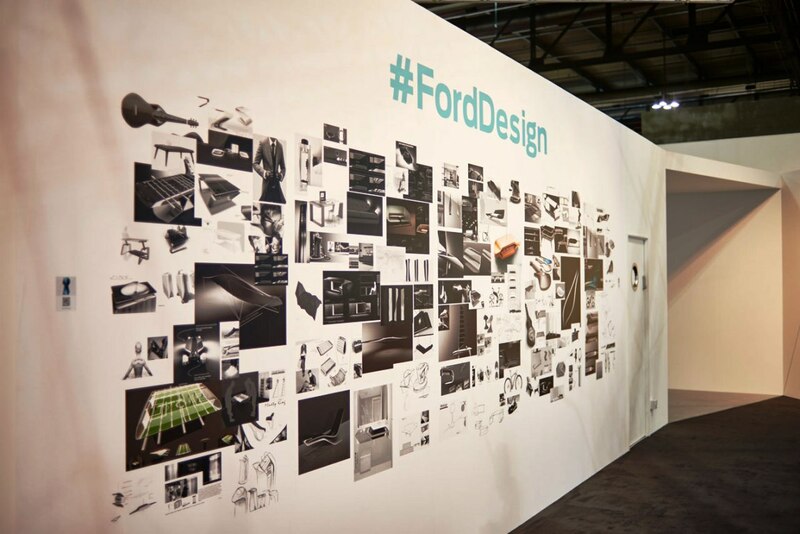 Ford has had a presence at the Salone del Mobile, Milan’s enormous annual furniture fair, since 2000. 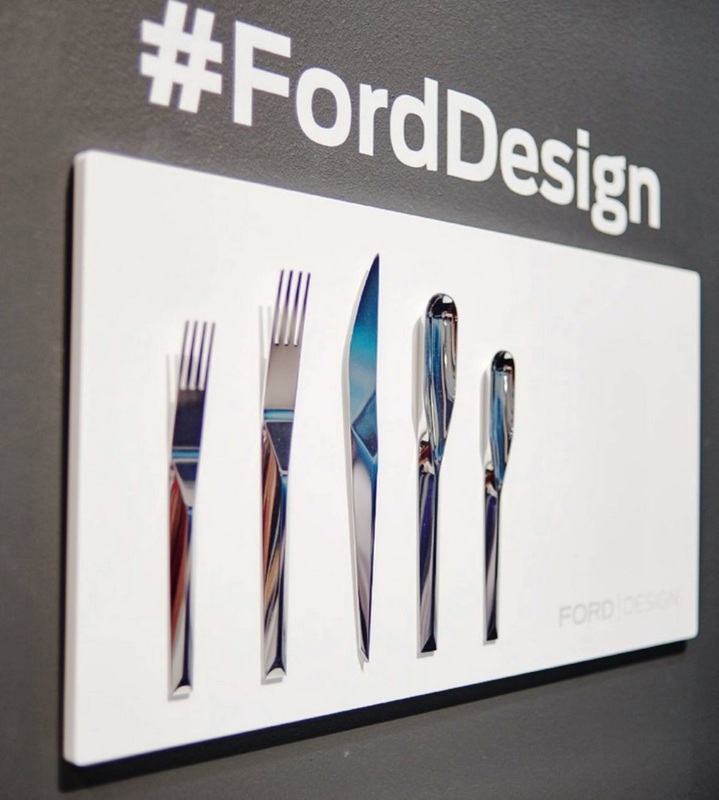 Ford is clearly trying to aggressively shape their image. 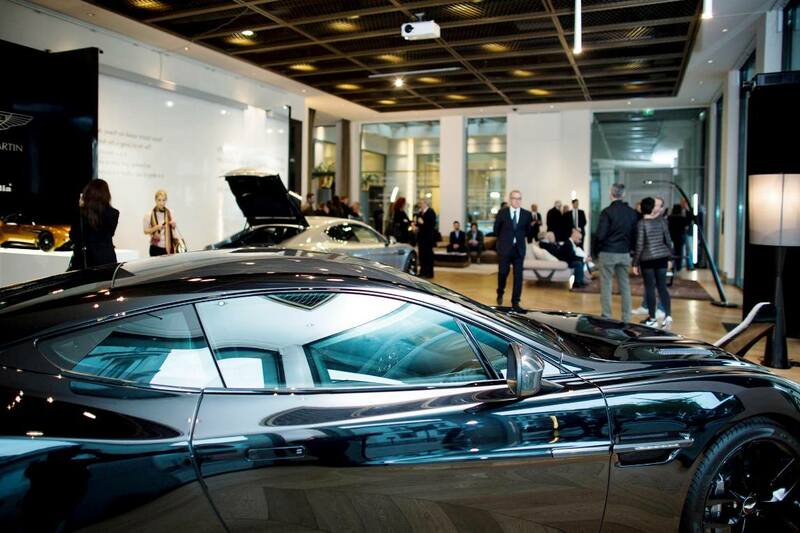 Muscling their way into a furniture expo to talk about cars may seem heavy handed, but you can tell it’s an effort being pushed on all front and through all possible avenues. 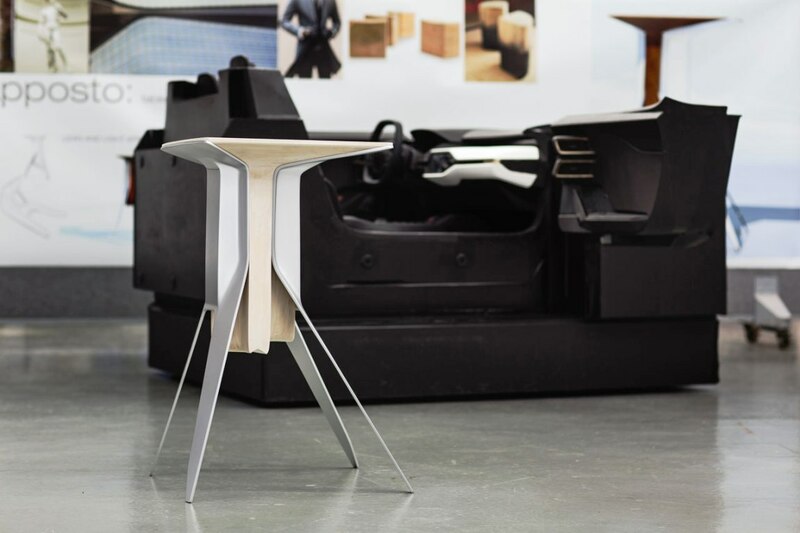 For what it’s worth, Ford does not intend to go into furniture design—this was sort of a point of confusion during the panel discussion. 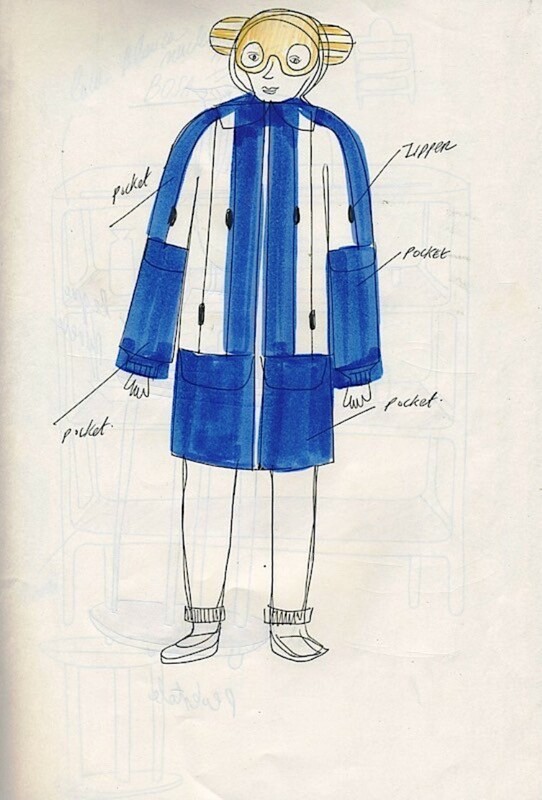 People were asking, “so will these pieces be put into production?” and the design team chuckled, no. 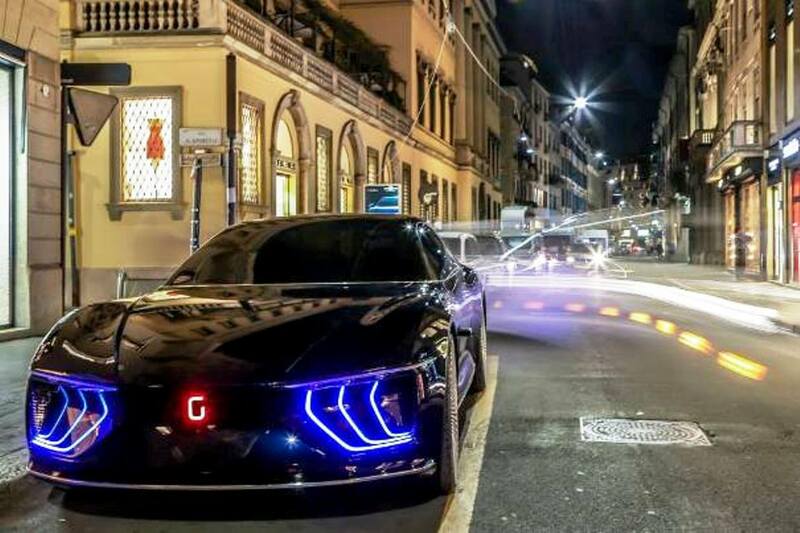 The new Ford GT, unveiled earlier this year, attempts to transcend the simple idea of a car and turn it into an experience. 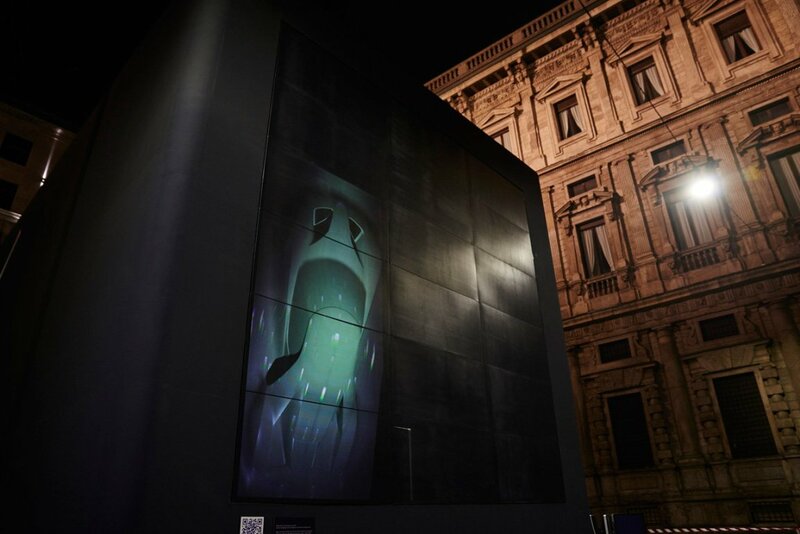 Favilla: To Every Light a Voice was shown by Ford at the Piazza San Fedele, is a special installation built in tandem by Ford and a local architect, Attilo Stocchi and under the guidance of the Federlegno Arredo Eventi as partof Expo Milan 2015. 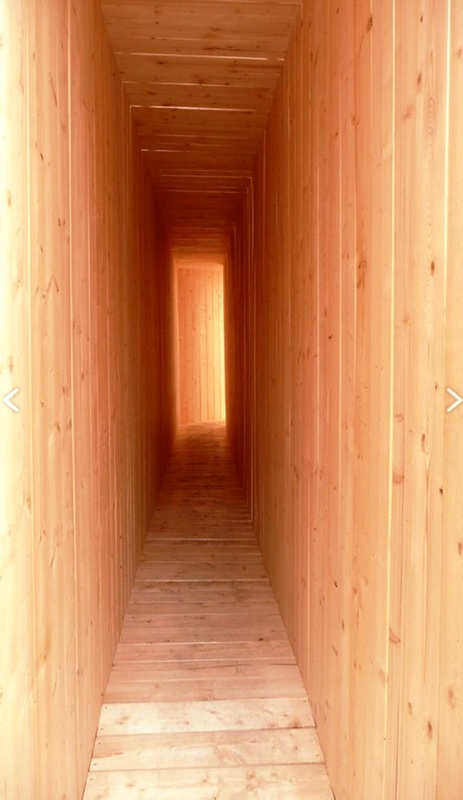 The immersive installation unfolds inside two large boxes. 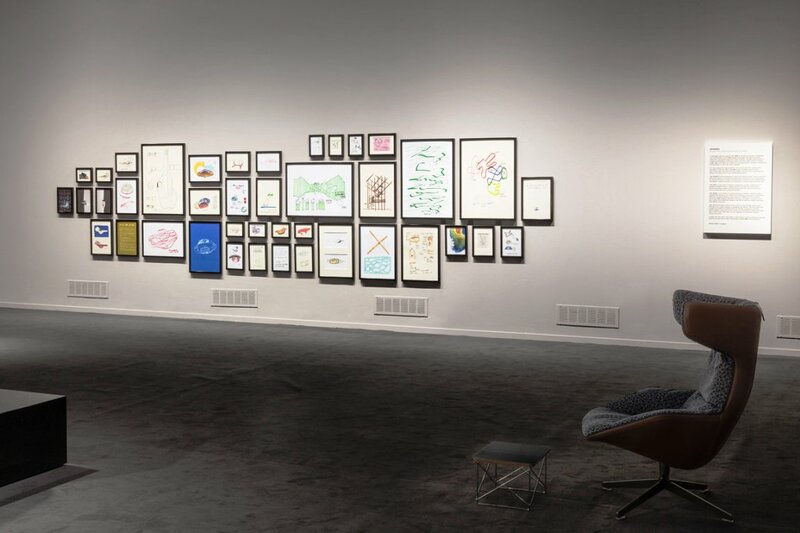 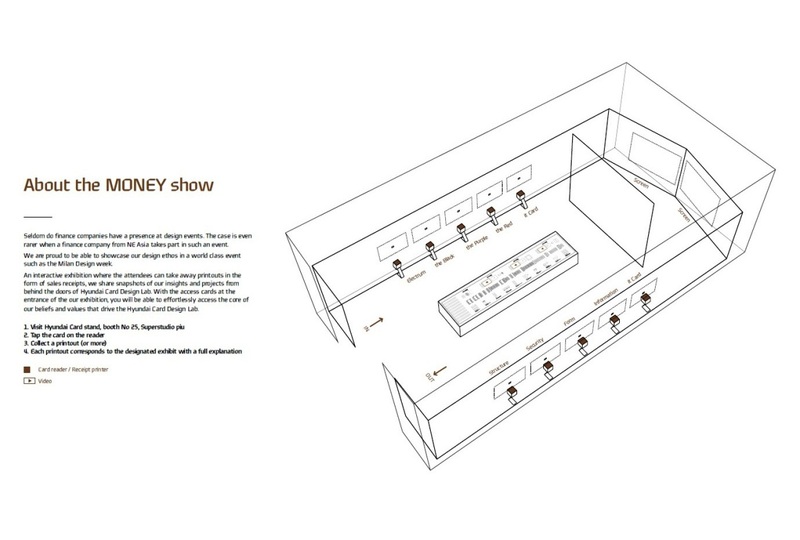 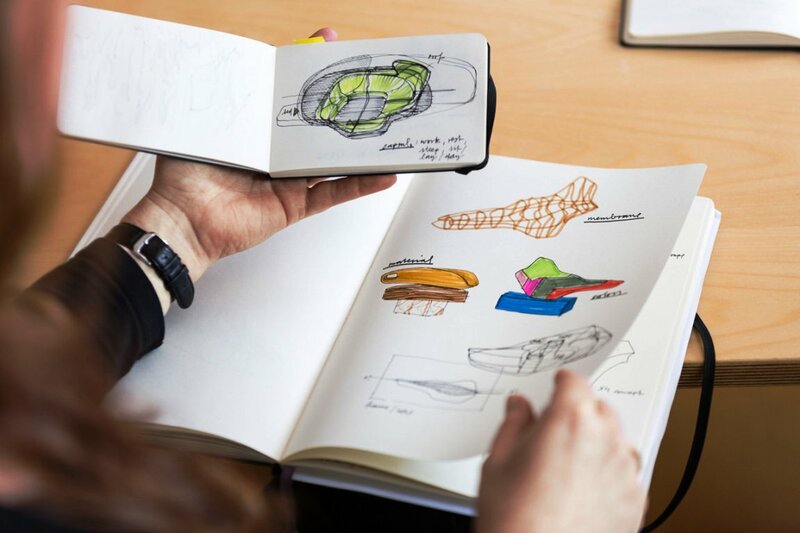 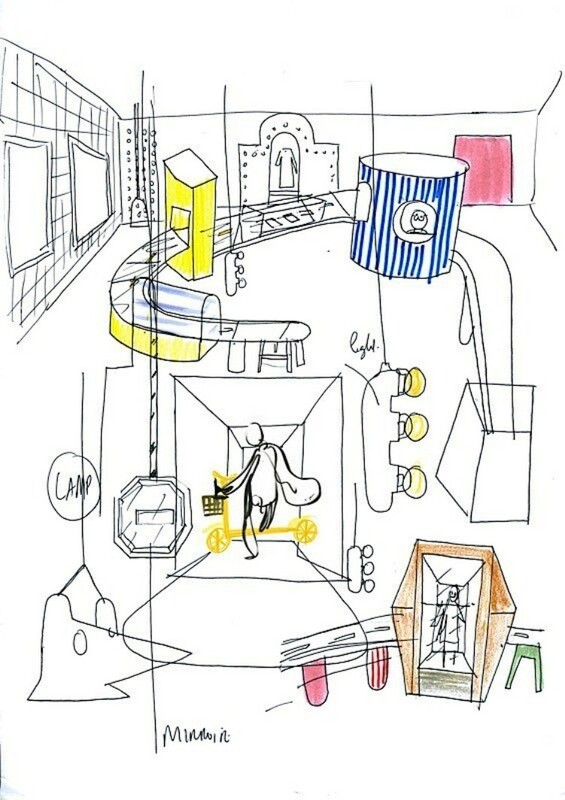 The second box is curated by Ford’s in-house animation studio to offer visitors a unique, engaging product experience that showcases how they design shapes both form and function. 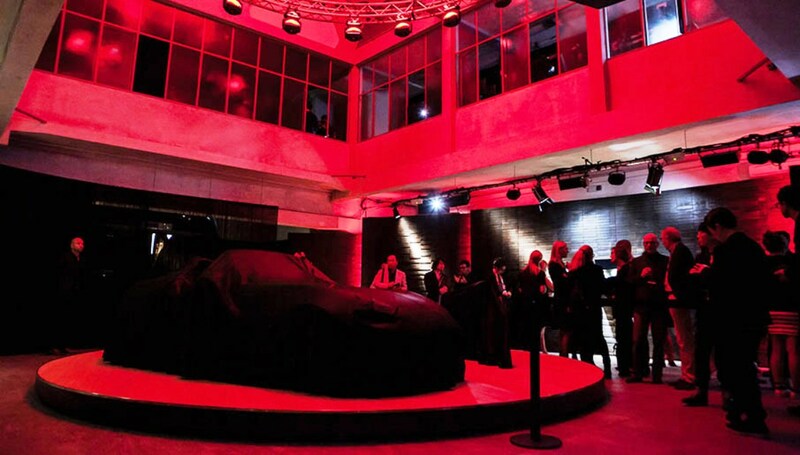 On the outside was an abstracted form of the Ford GT, lit up by brilliant projections, bending and twisting light around the structure. 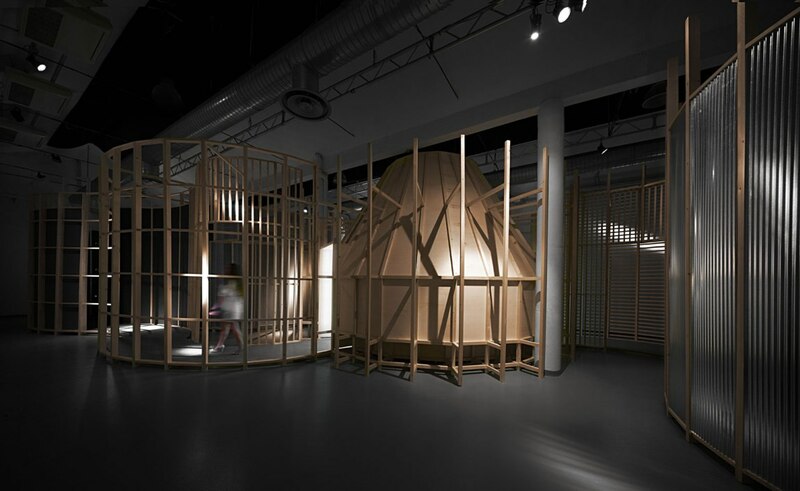 Standing inside the structure was like being underneath a glowing, dimly-lit geodesic dome. 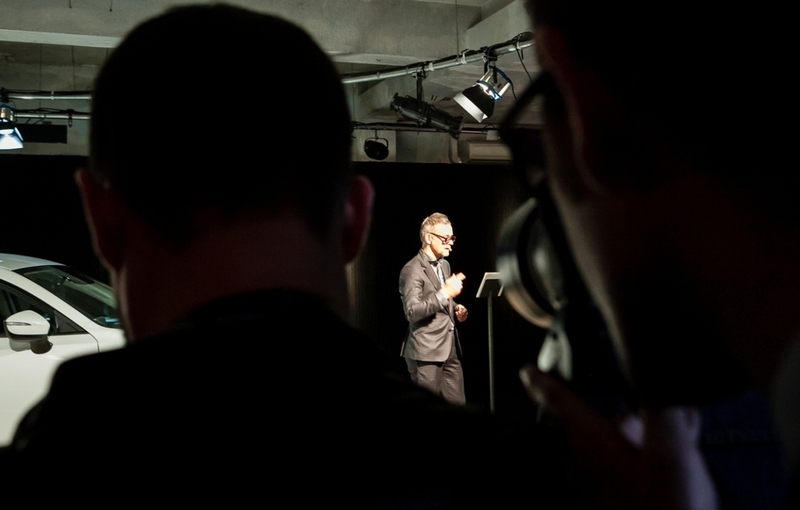 Once we were all in, the lights went dark, and a voice began to speak in Italian. 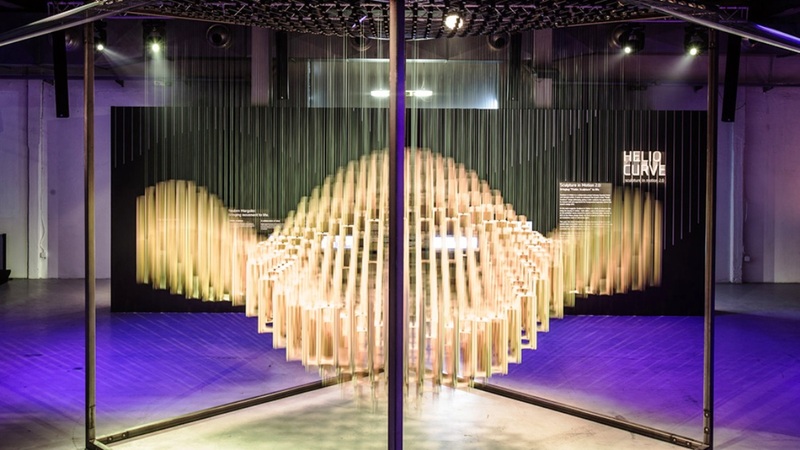 As it continued, the geodesic panels began to light up with images of forest, leaves, and abstracted light forms—it was a play of sorts, a light play in five parts. 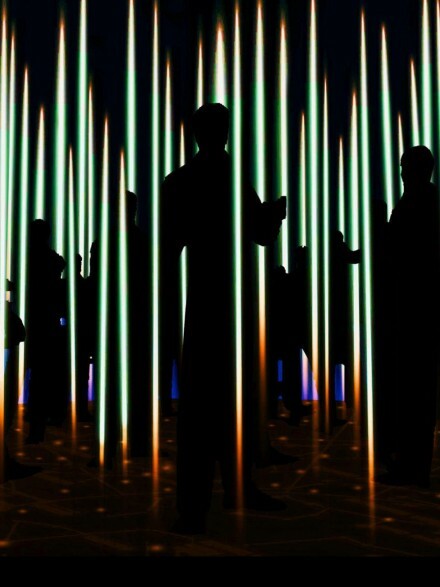 We left after the performance, dazzled. 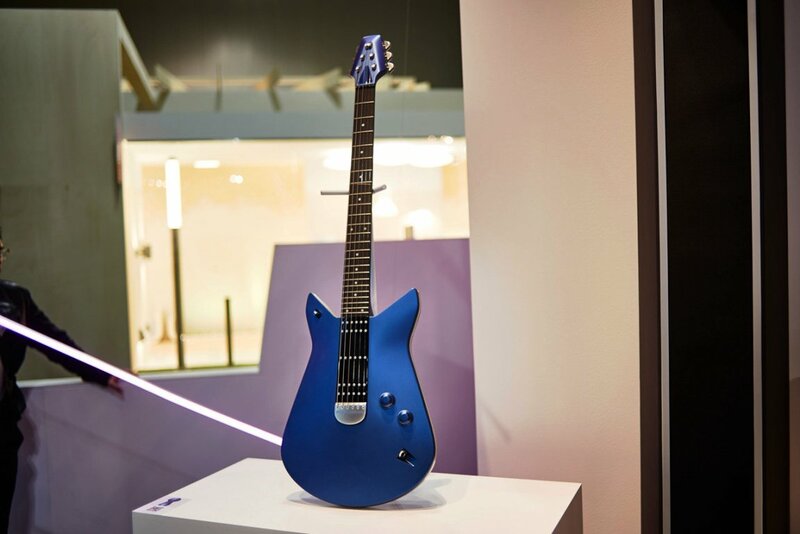 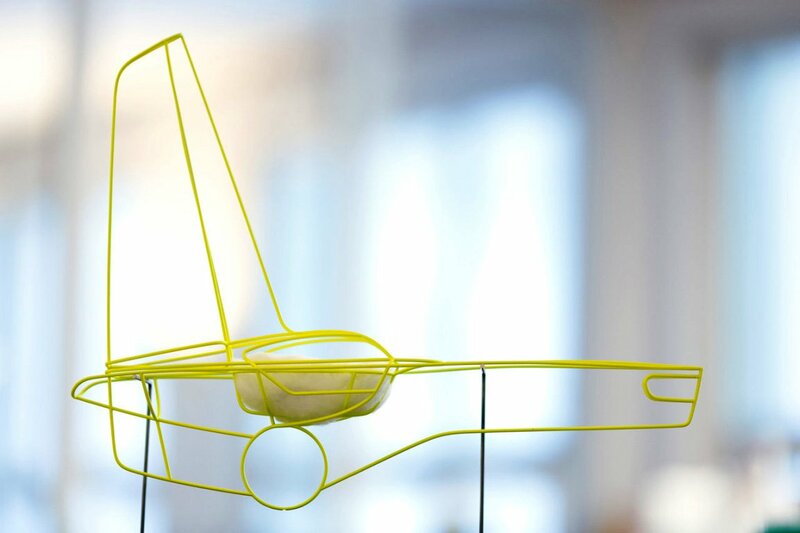 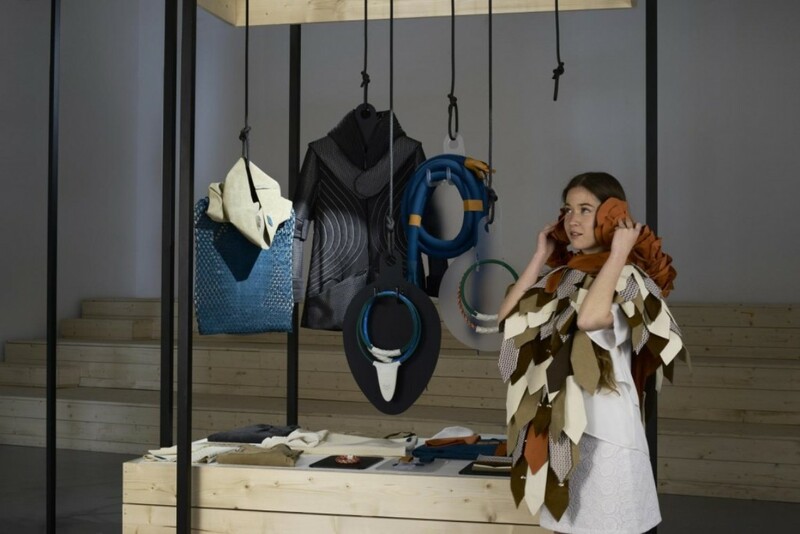 For 2015 Salone, Ford is keen to show off its design talent this time through more ambiguous means, by inviting its in-house Ford designers from around the world to propose designs for non-automotive products, which are shared on the stand. 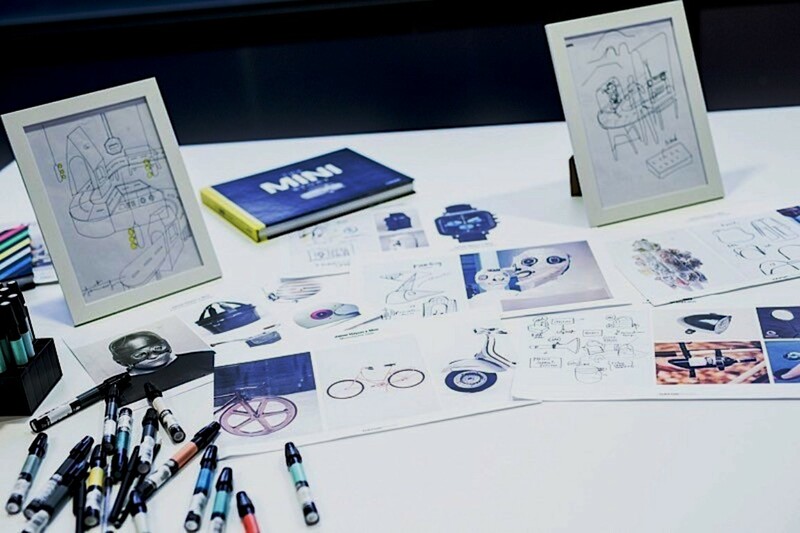 The automaker’s 350 creative types were challenged to create objects based on the design philosophy for the newly introduced Ford GT. 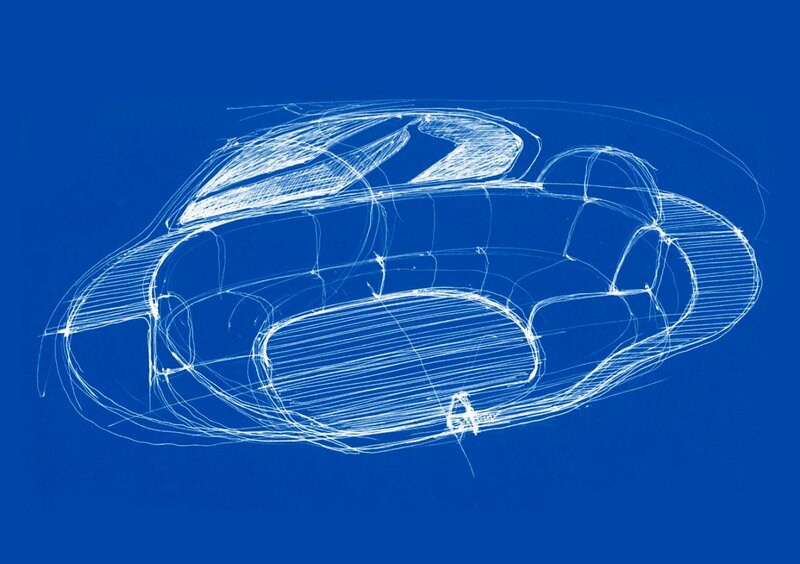 Where the process of building a new car can take years, Ford’s designers were only given a few months from concept to creation. 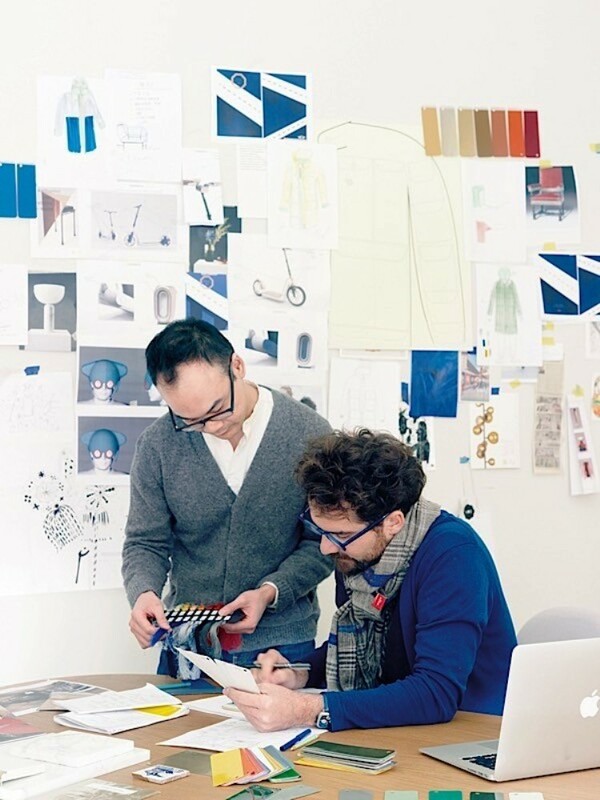 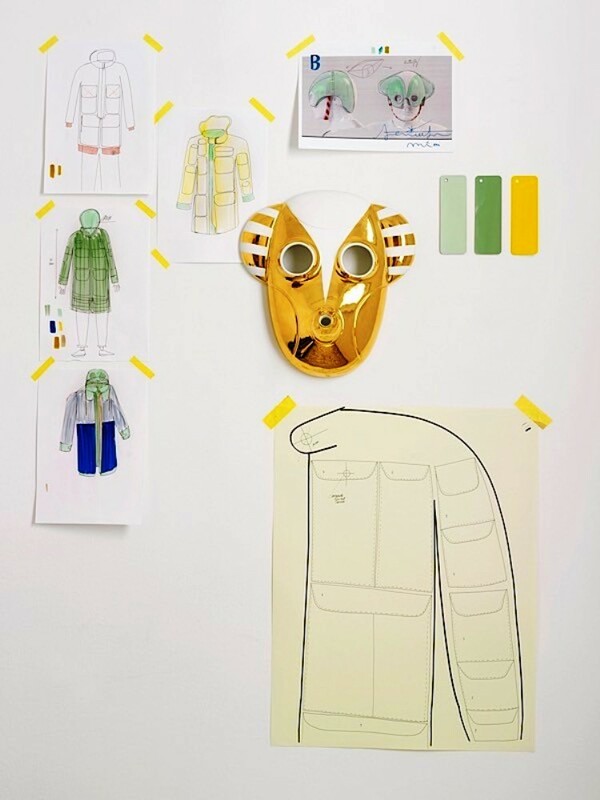 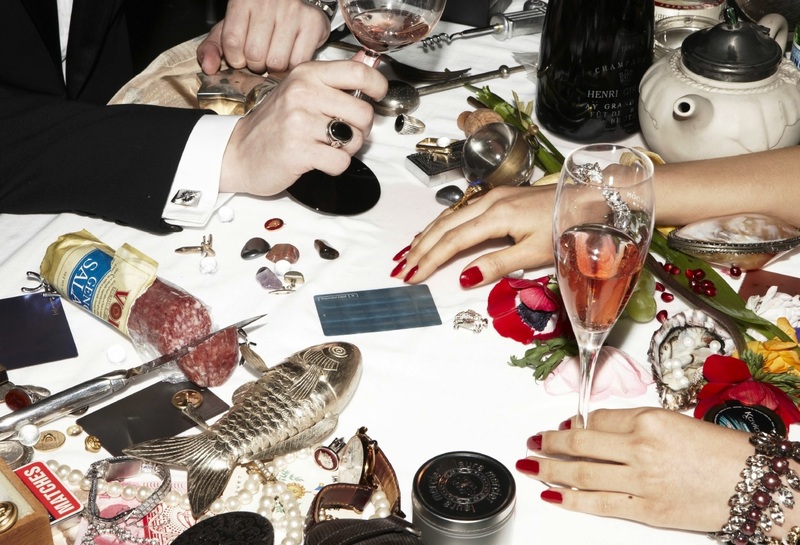 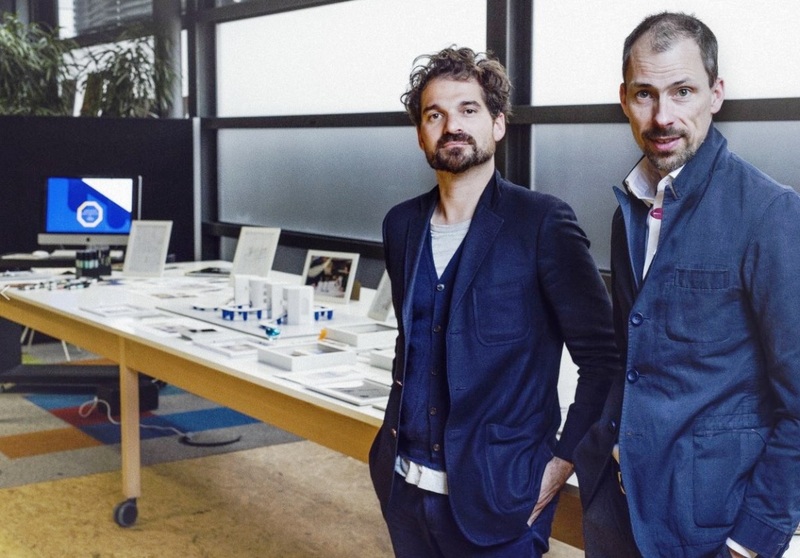 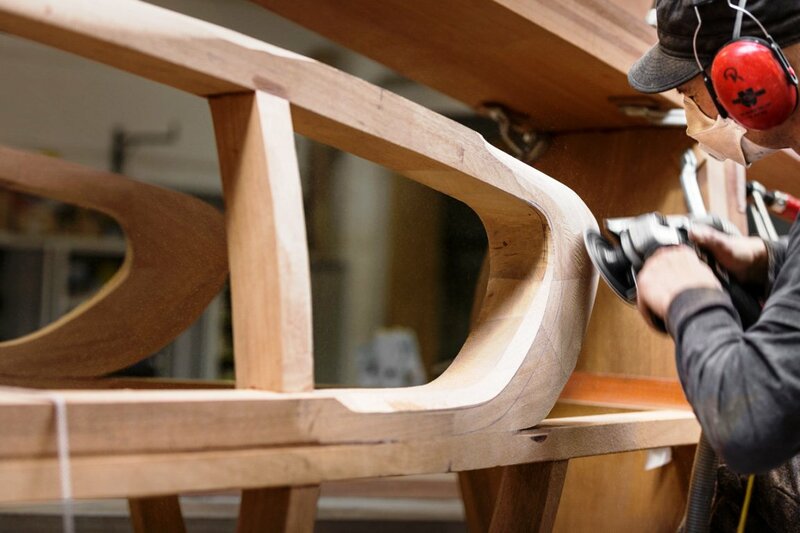 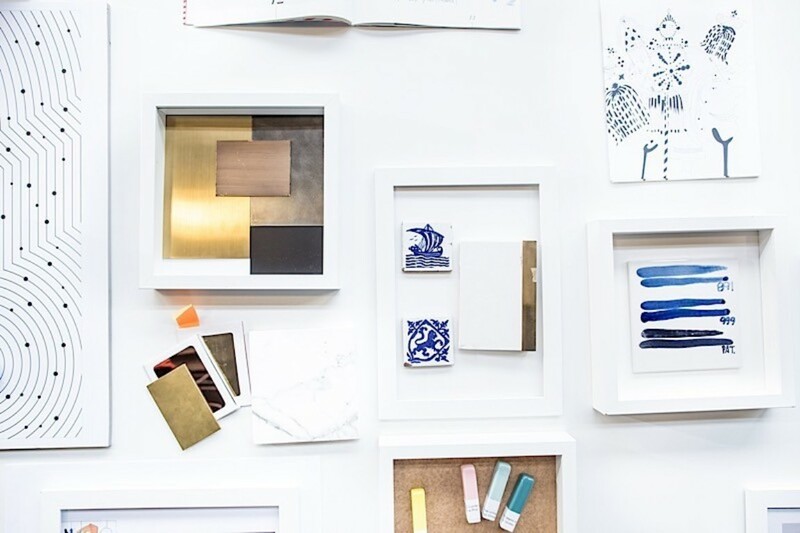 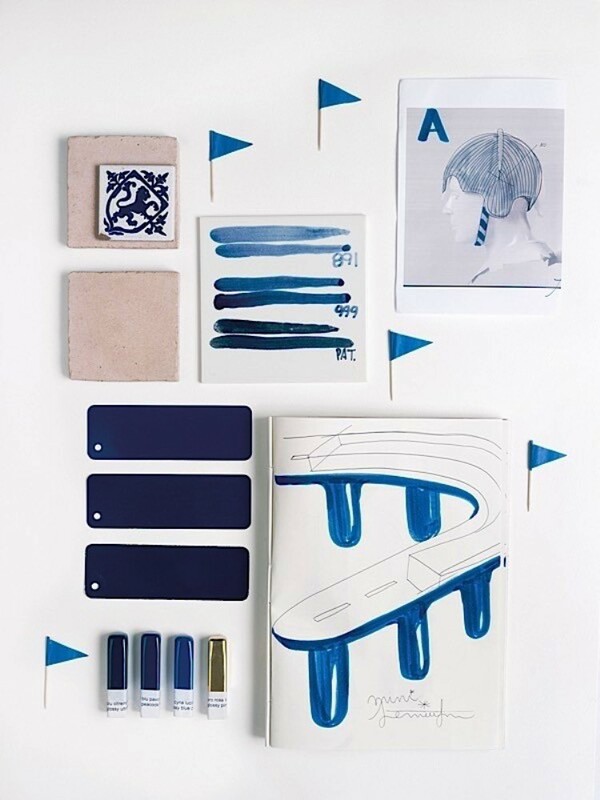 They were encouraged to follow secondary passions—for one designer, that passion was sailing. 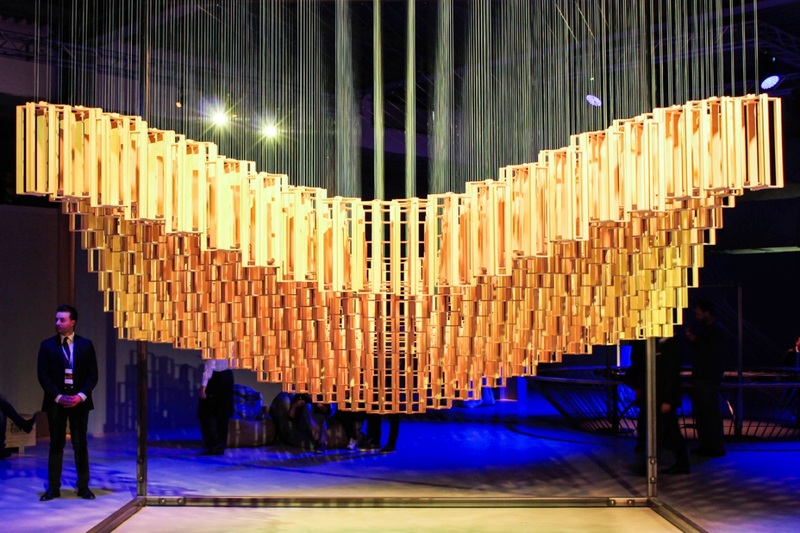 He created a minimal but grand structure to soar through the waters of his hometown. 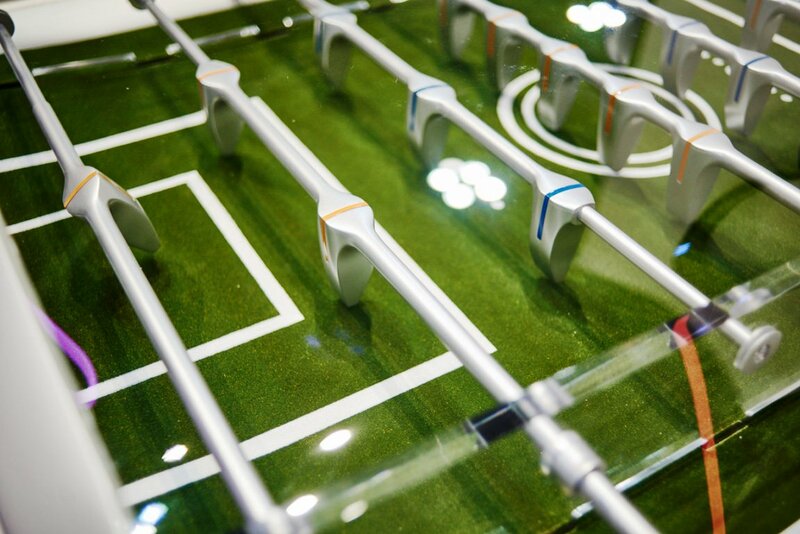 Another designer created a Foozball table that would multifunction as a house plant (the grass in the bottom is real, and can help aerate a home). 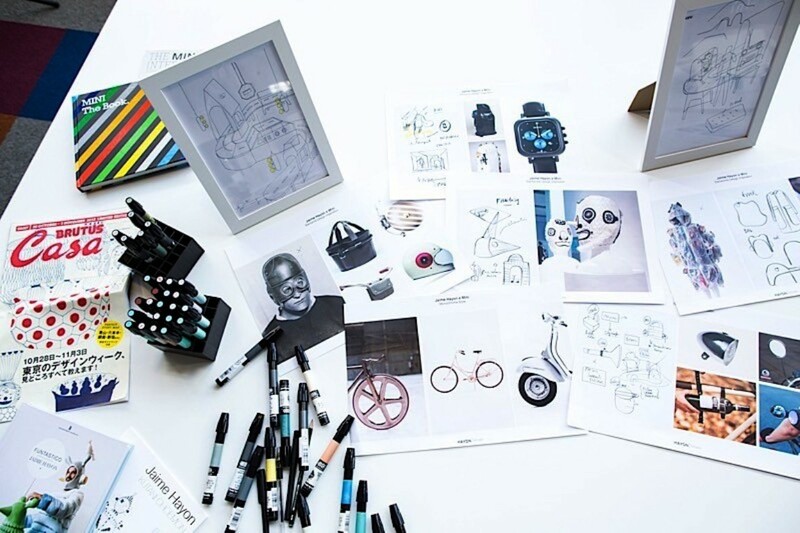 At the end of the stretch, Ford received over 130 proposals and brought a handful of the best ones to life. 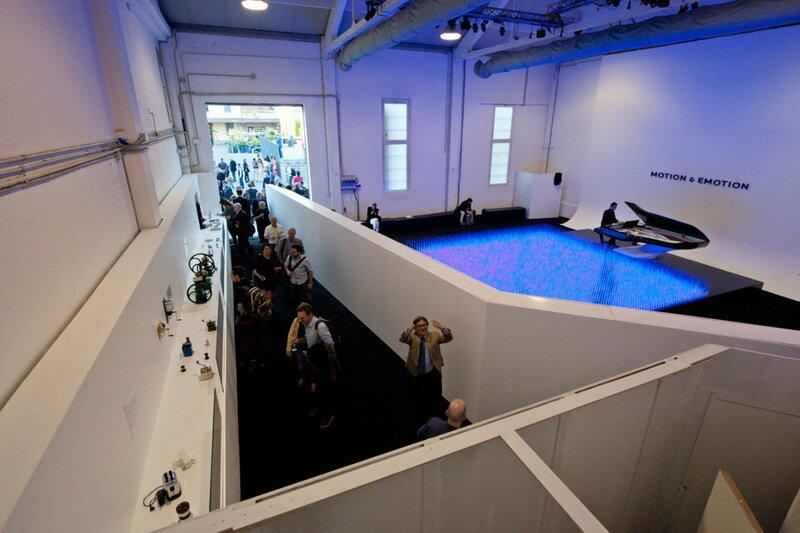 Talks and discussions at the exhibition lounge in the Rho Fairgrounds was Fords’ other raison d’etre. 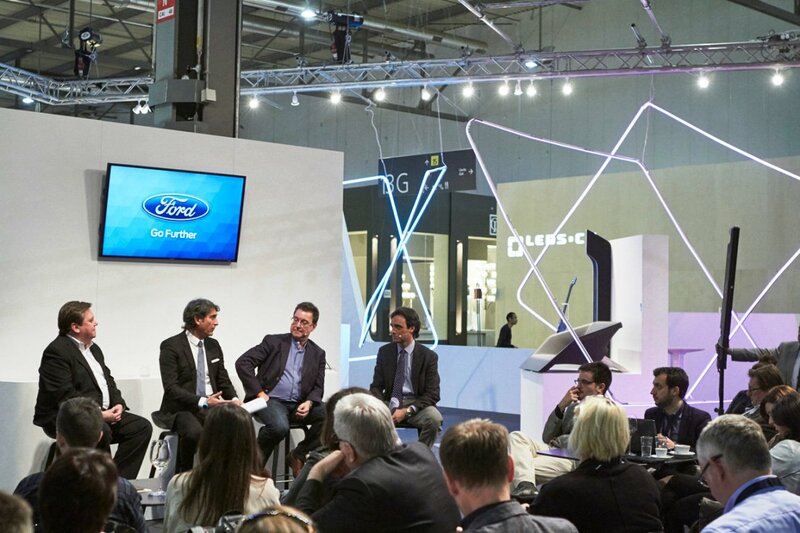 Speakers included Moray Callum, Vice President of Design for Ford Motor Company, Gus Desbarats, founder of design house The Alloy and Chairman of British Industrial Design Association, and Salvatore Ippolito, Twitter Italy Country Manager. 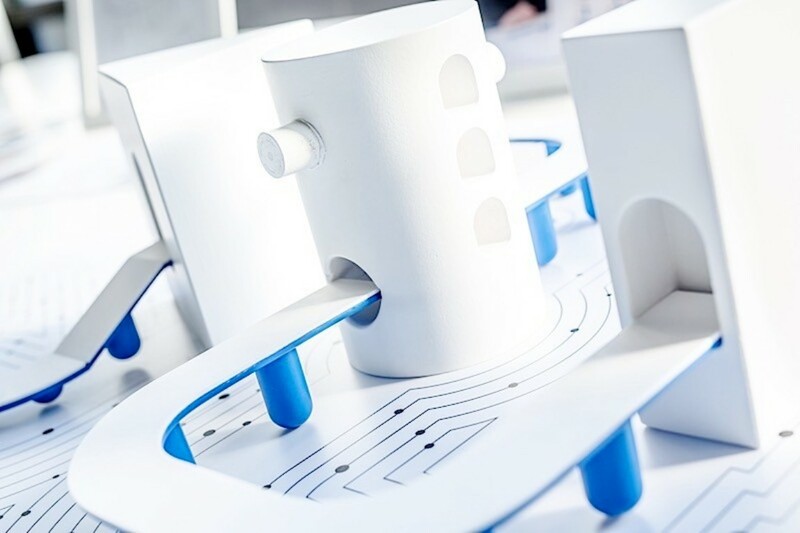 A recent study showed that people thought the most innovative feature on a car was actually a cup holder. 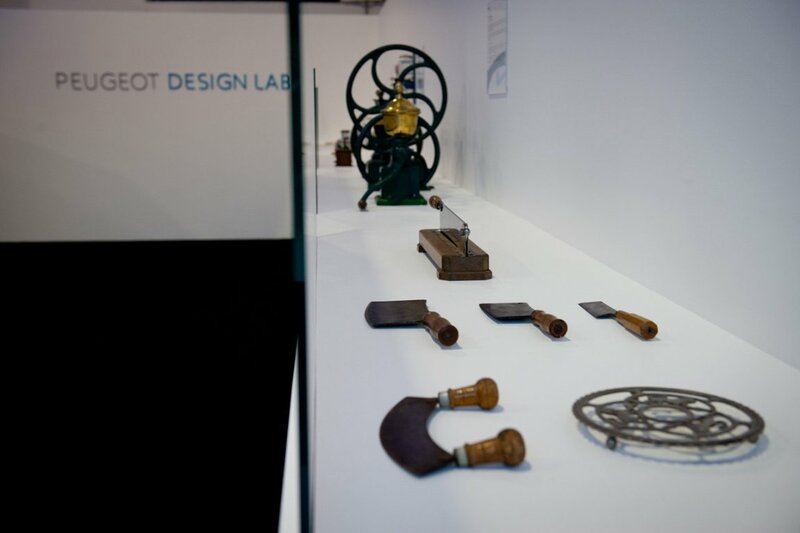 Innovation doesn’t need to be technical; it needs to use something useful. 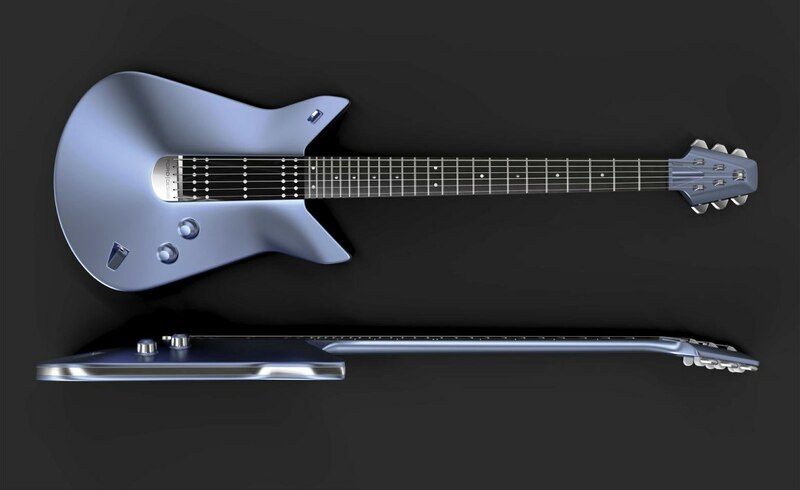 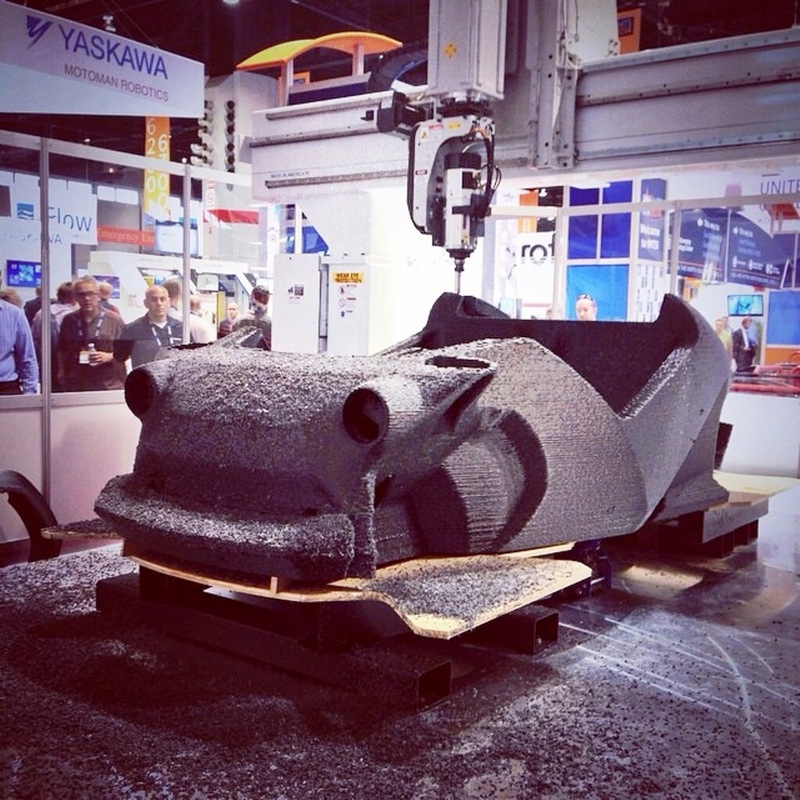 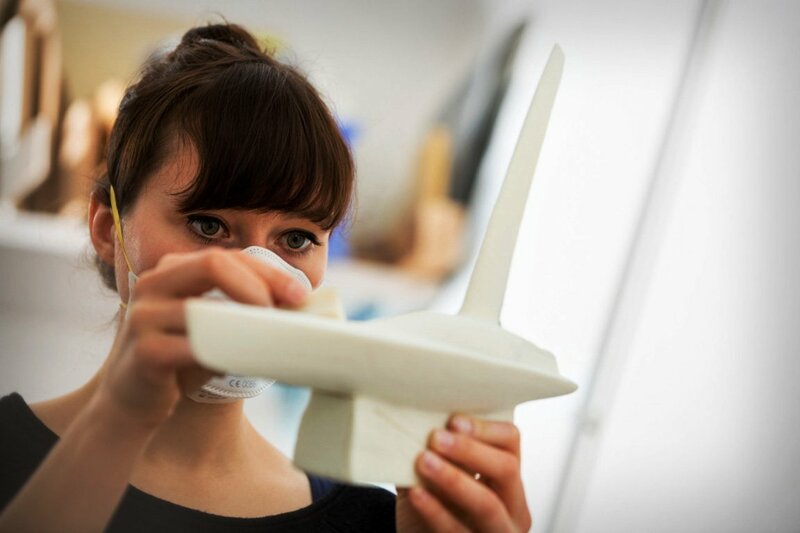 Piaskowski envisions 3D printing – which the company currently uses to create prototypes but is not yet featured in its finished vehicles – being used significantly in the creation of cars in the future. 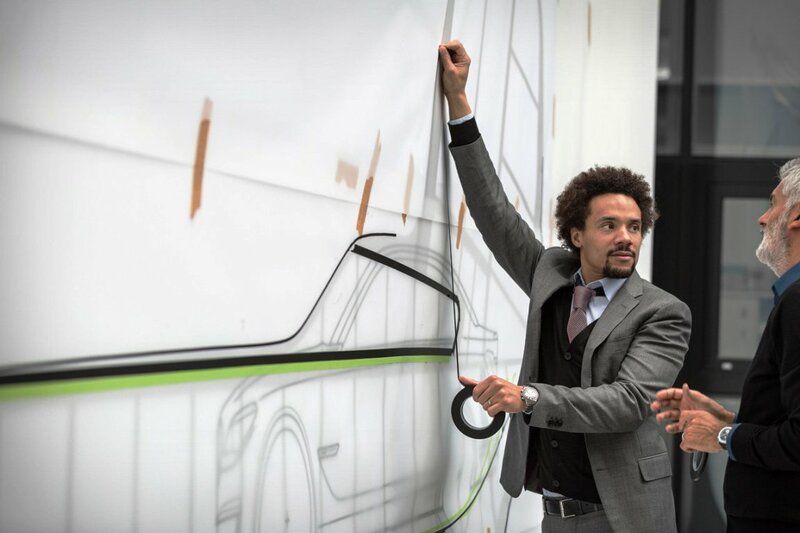 He also discussed Ford’s developments within the hottest topic in car design right now – the driver less car. 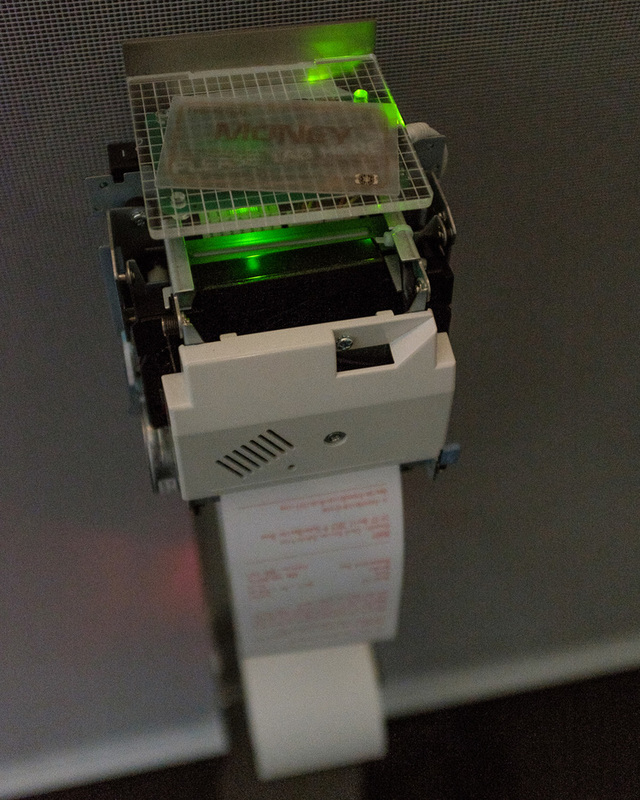 “[There are] four levels of automation,” he says. 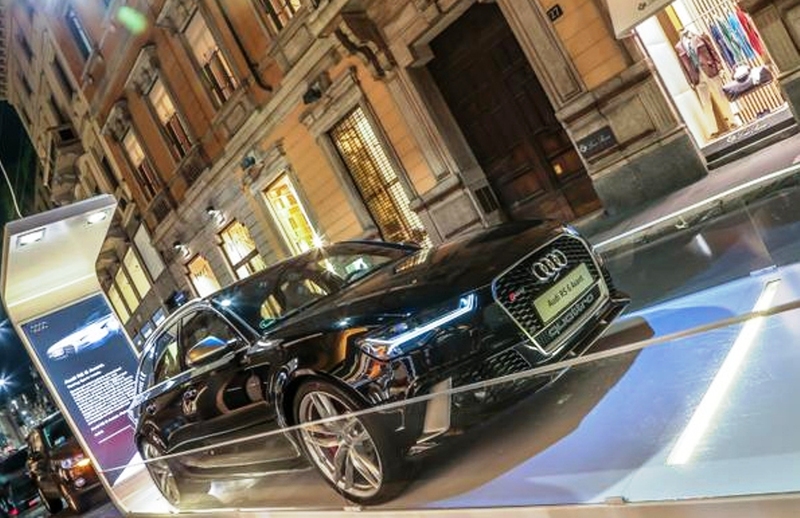 “We’re between levels one and two – with four being fully automated – where some cars today are partially autonomous, with adaptive cruise control that will allow the car to keep a certain distance from the car in front of you, and it will brake and come to a complete stop if necessary. 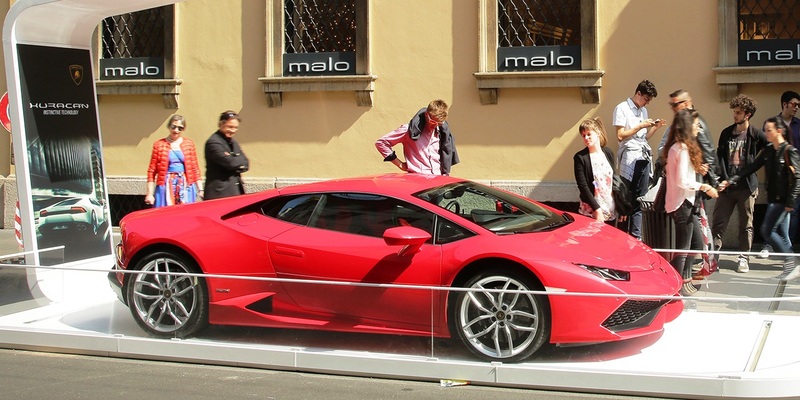 Also being able to self-park – you’re still in the car controlling it, but it’s a level of autonomy. 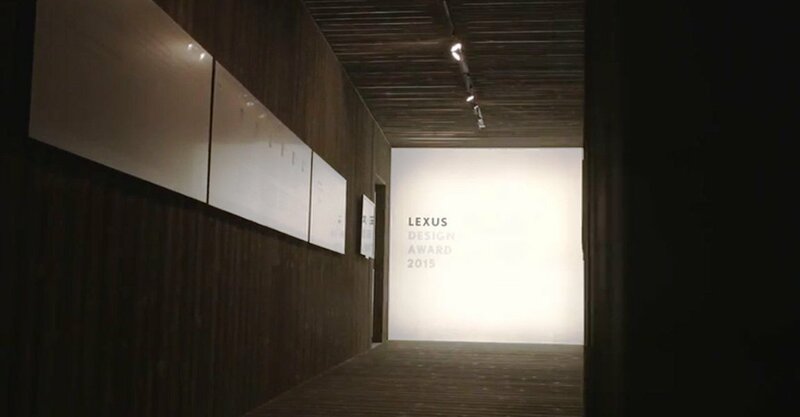 Toyota’s real commitment to th Salone has been through its’ Lexus brand. 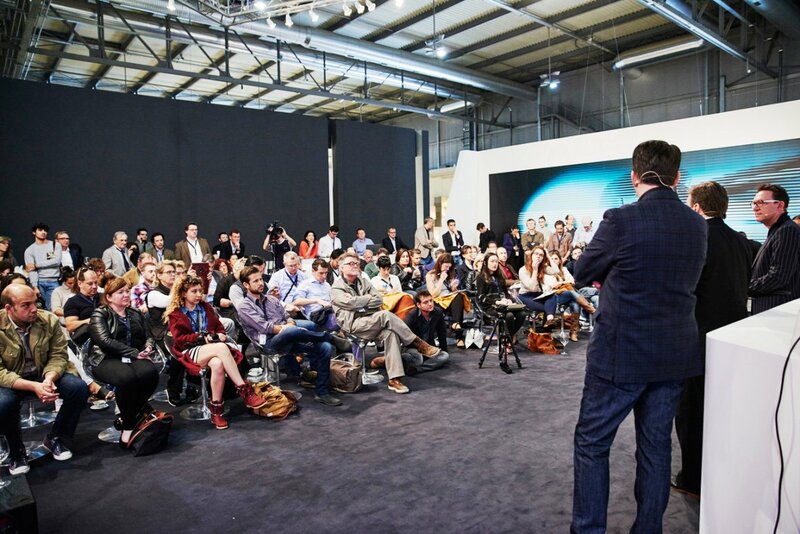 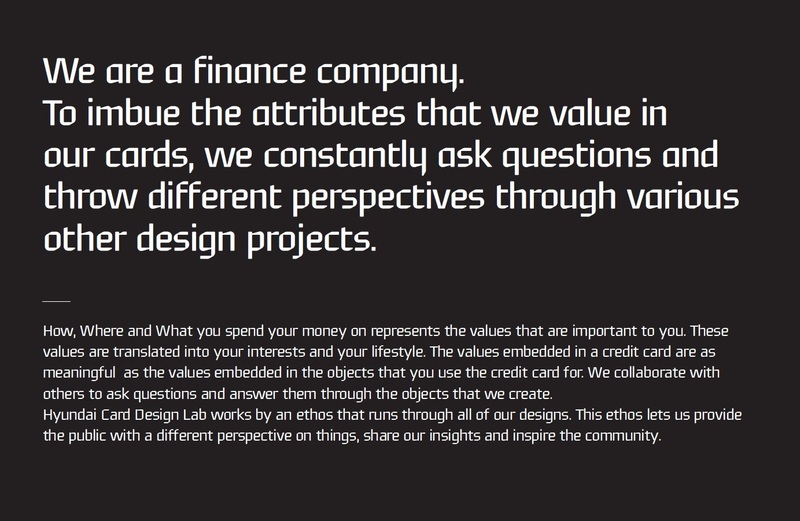 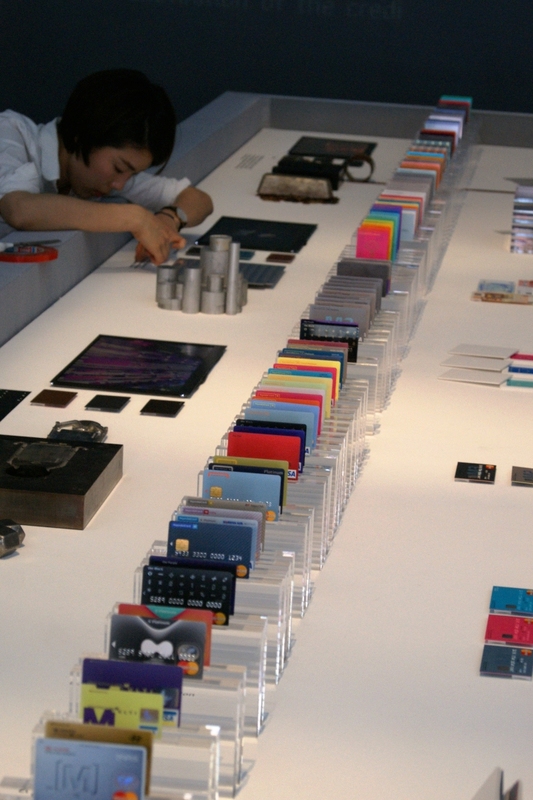 Lexus has been presenting at the Salone for 10 years now . 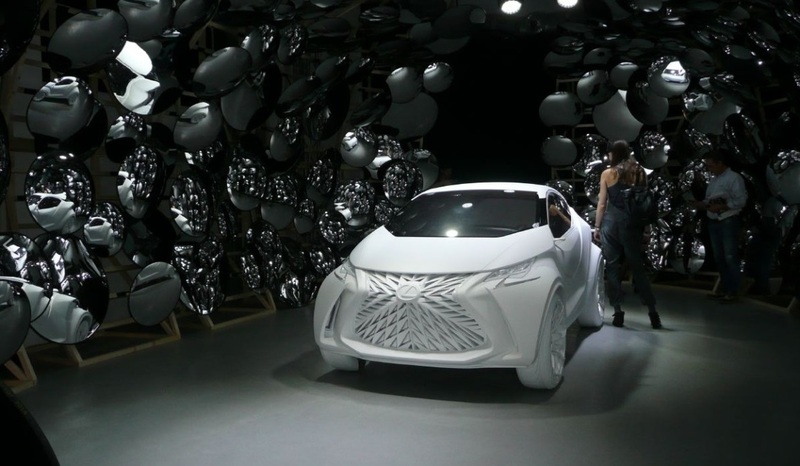 Lexus is one of the most constant, but still surprising, car makers showing in the Salone. 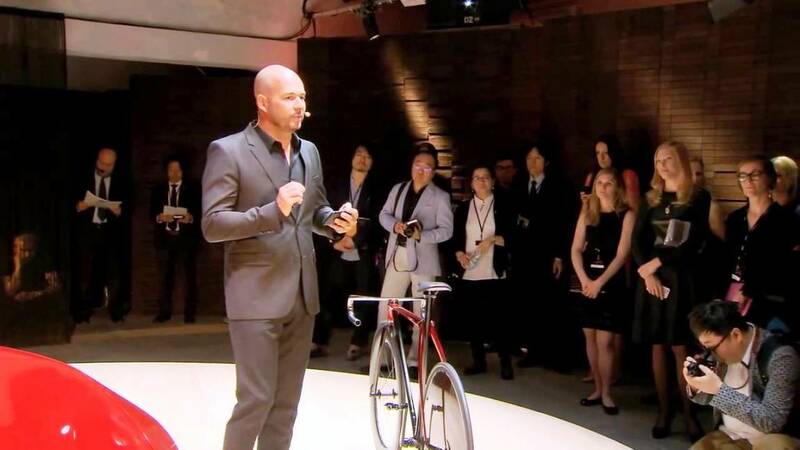 This year Lexus worked with three presentation themes. 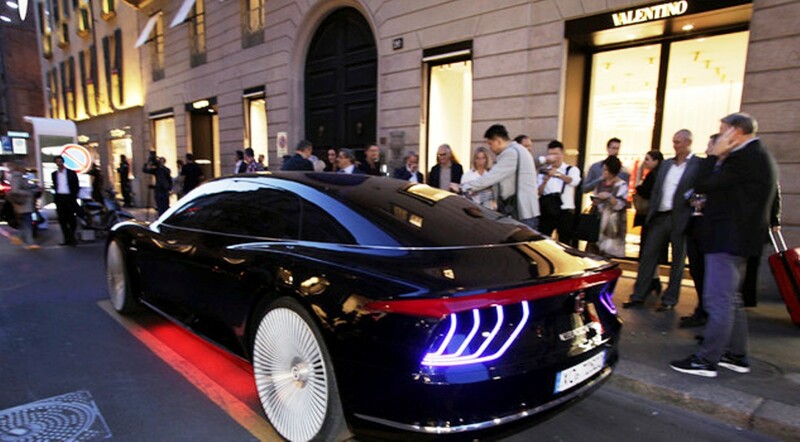 1) The Geneva city-car LF-SA concept, presented in surprising environment – car completely white, looked like it is made from marble surrounded by convex mirrors and changing light. 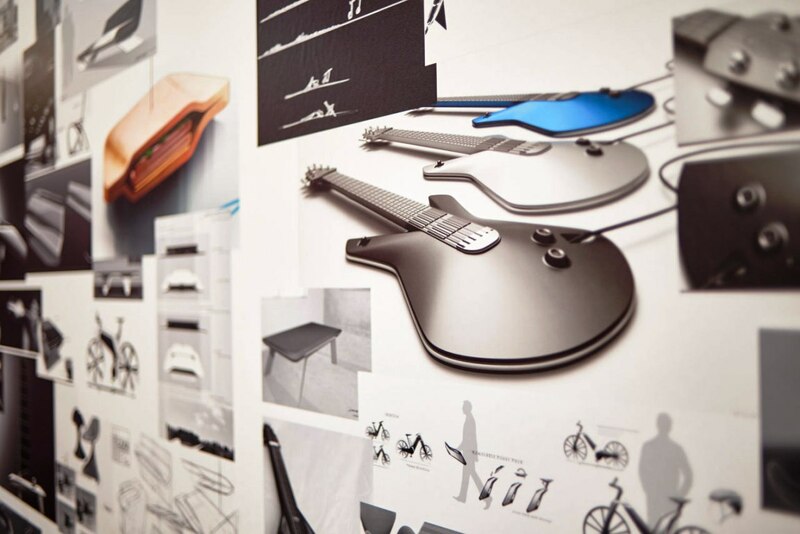 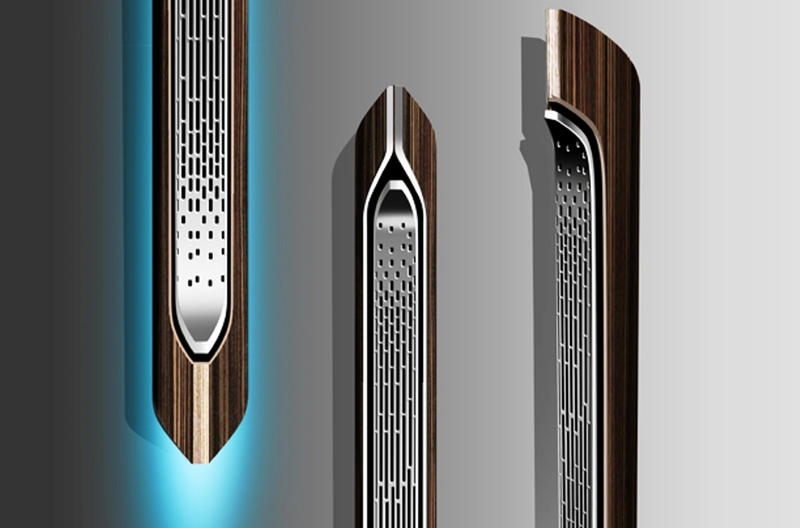 2) The annual Lexus Student Design Competition with some interesting, some exciting and some surprising proposals. 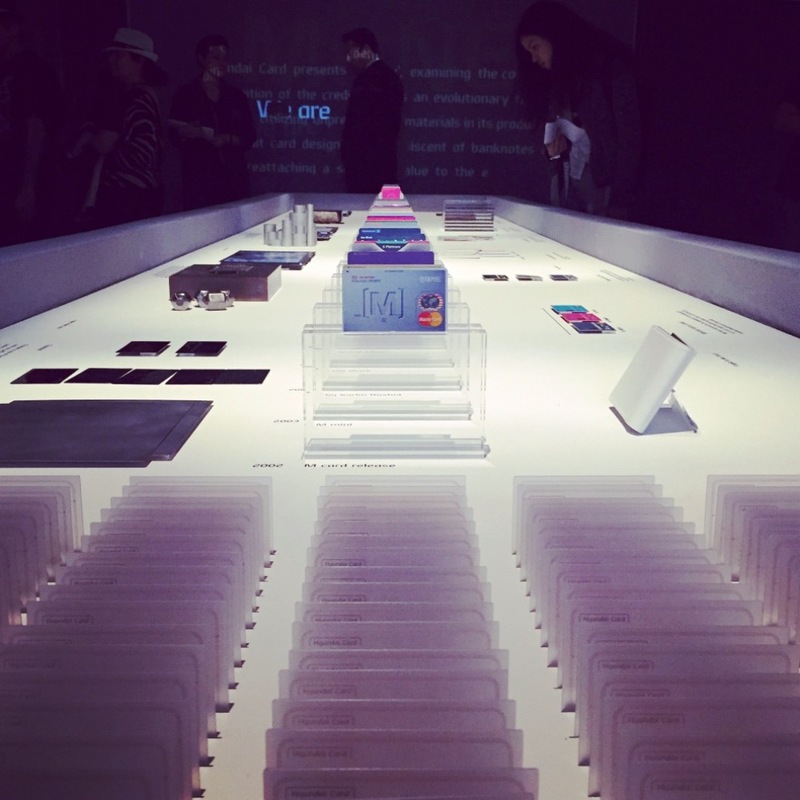 Milan Design Week once again saw the awards ceremony of the Lexus Design Awards 2015, whereby 1,171 projects were submitted from 72 countries. 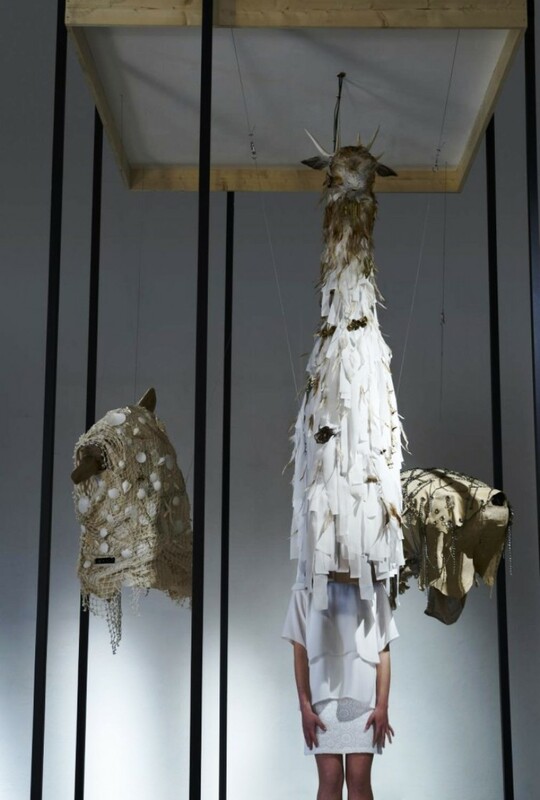 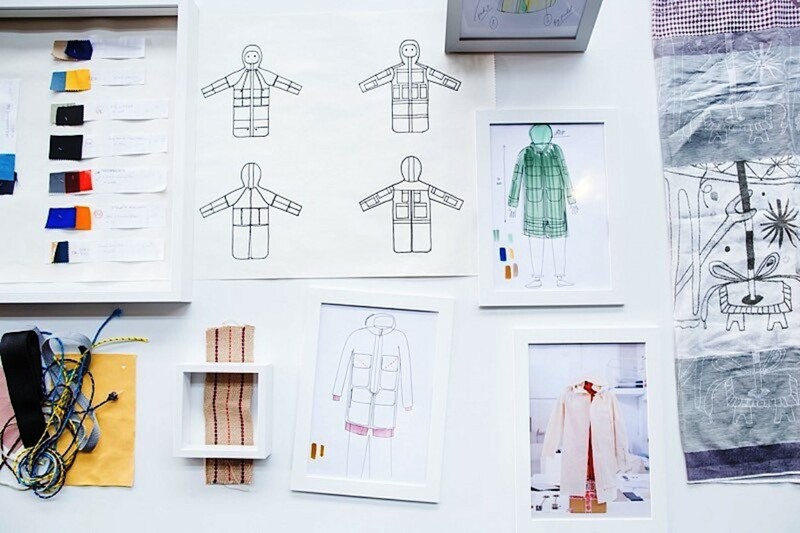 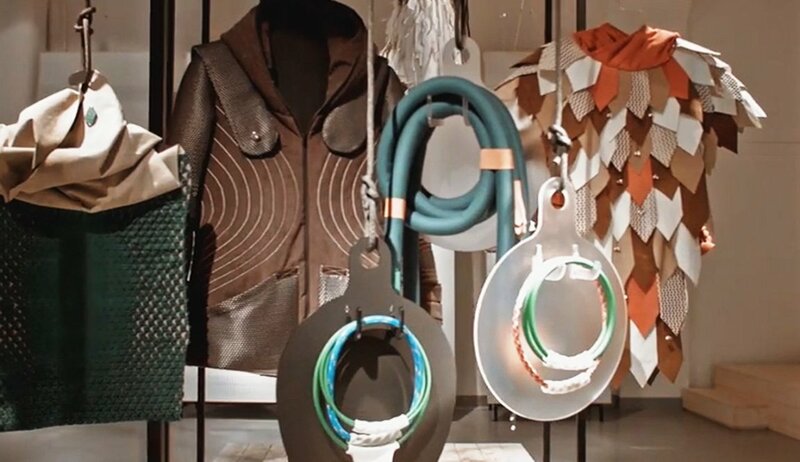 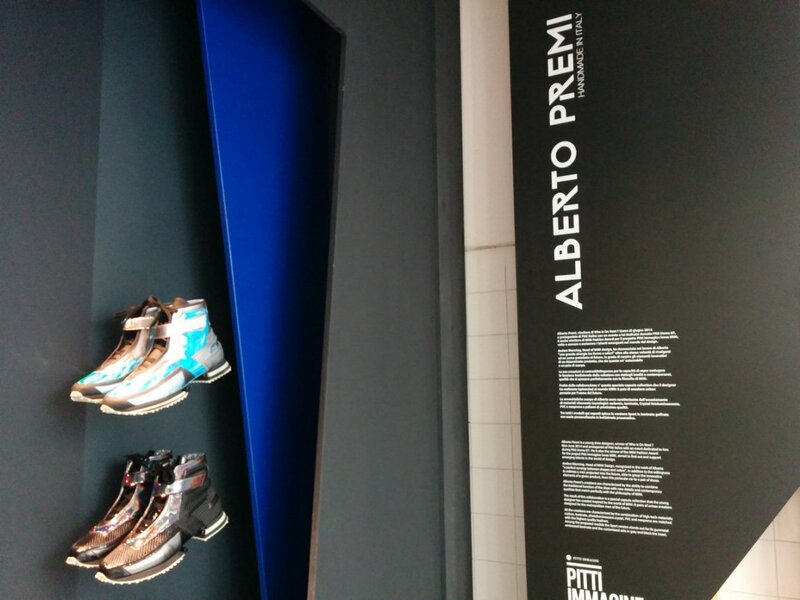 The winner was the work Sense-Wear by 2 x Italian designers Emanuela Corti and Ivan Wallpapers. 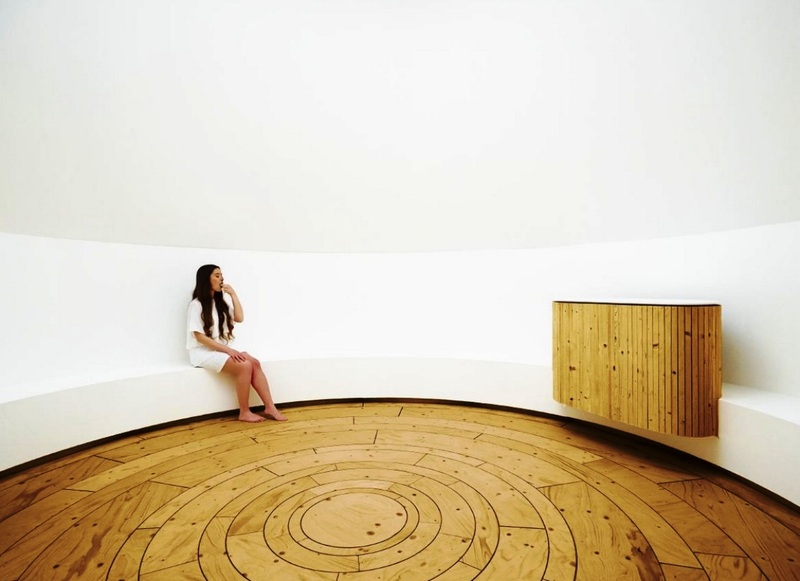 3) A labyrinth = A journey of the Senses where you could excite your five senses. 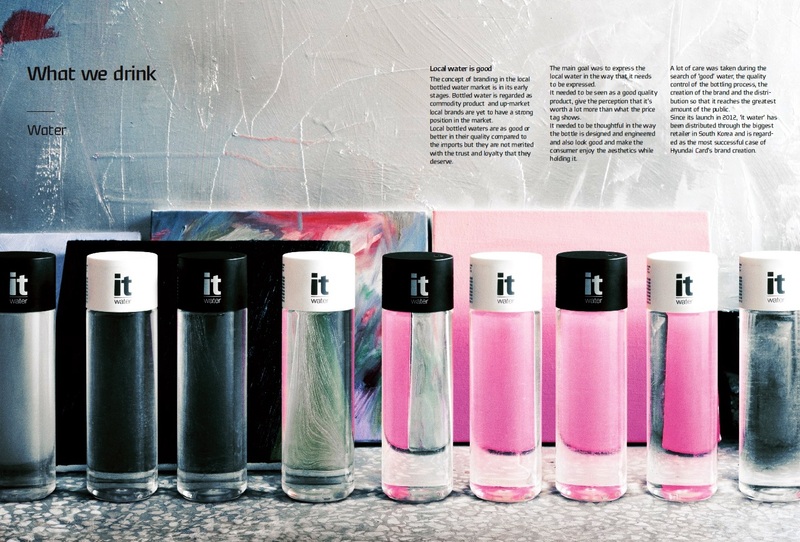 A master cook and a surprising use of vodka were among the ingredients. 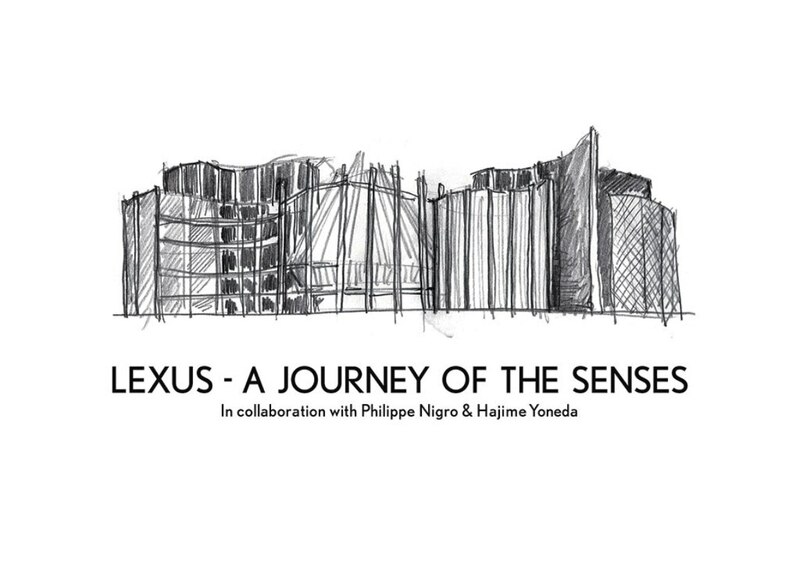 Lexus invites us on a sensory experience with ‘A Journey of the Senses’. 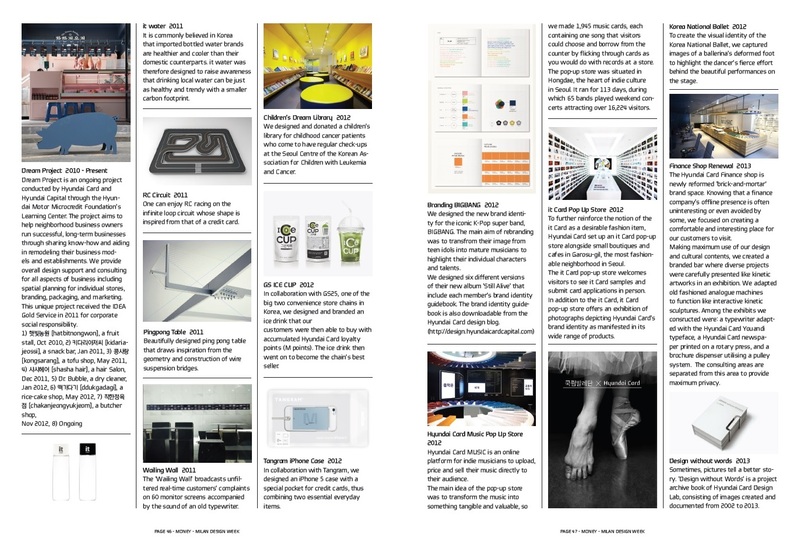 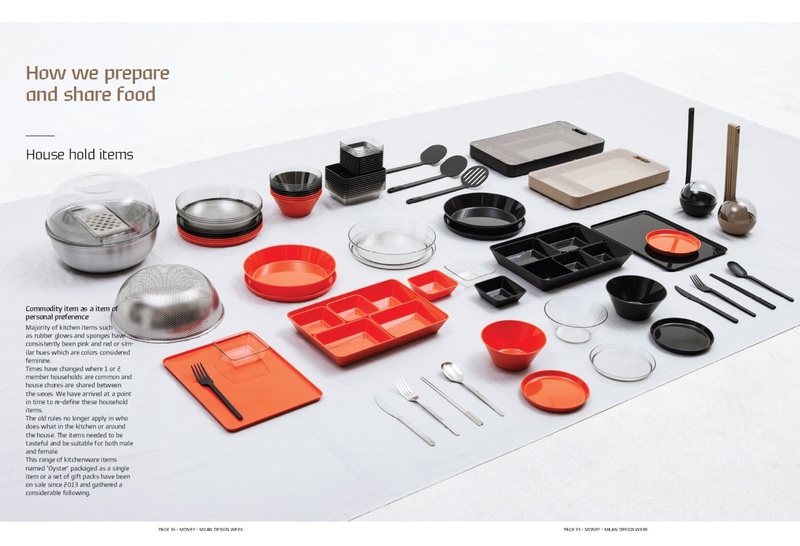 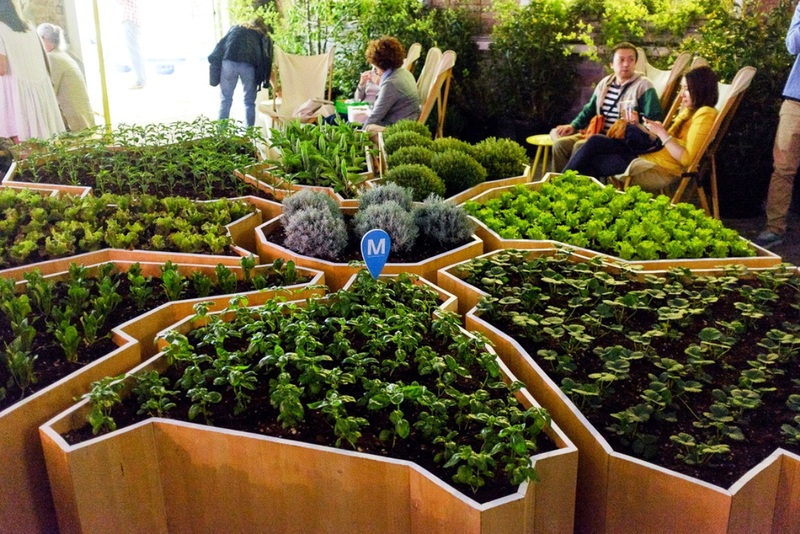 We taste elements of the ‘cycle of life’ – raindrops, nature, earth – through design and food. 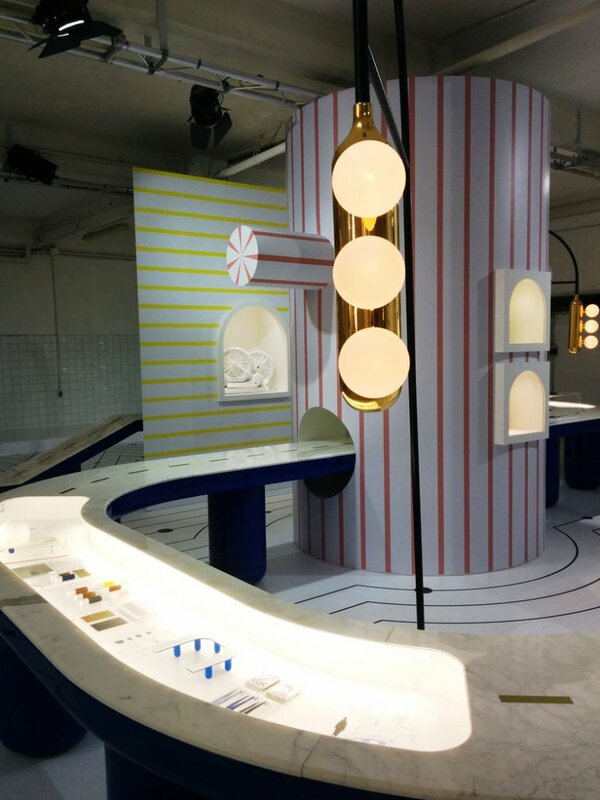 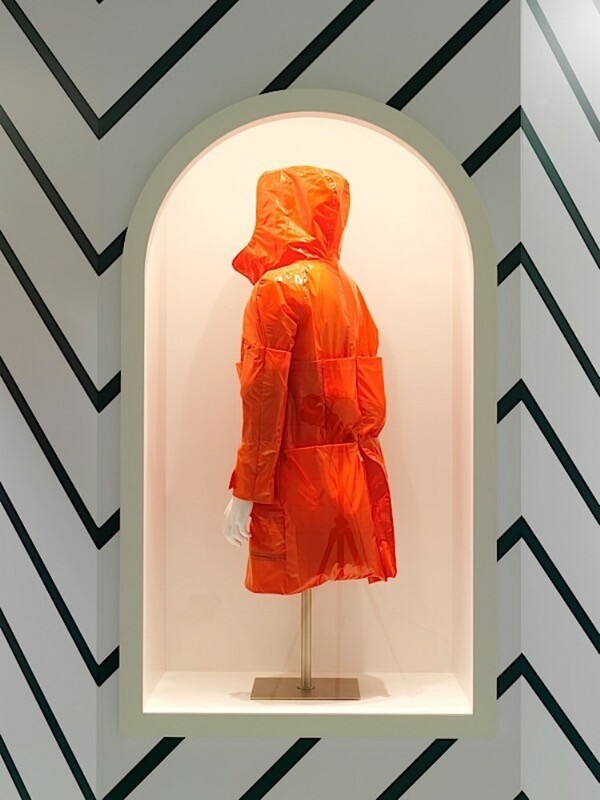 Here the journey is directed by designer Philippe Nigro’s installation and enhanced through chef Hajime Yoneda’s experimental tasters. 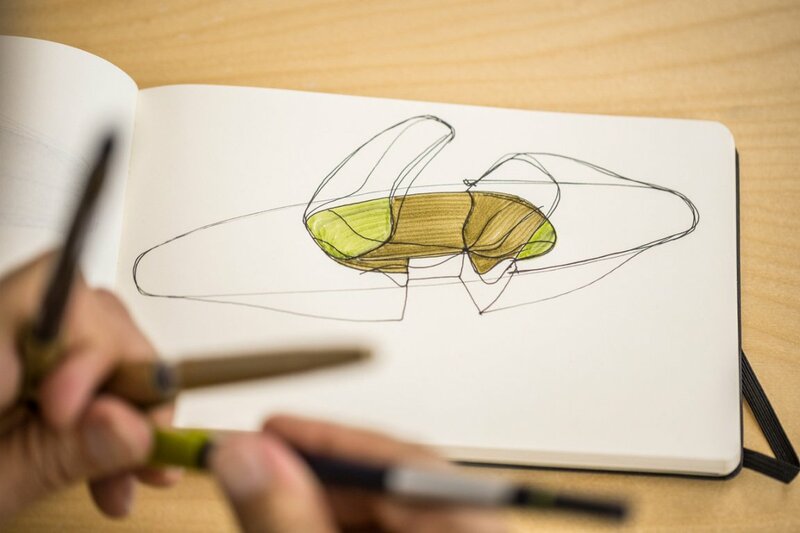 We move through a series of cocoons, each one of which is designed to heighten the senses and evoke the Inside-Out Lexus design philosophy encouraging our enjoyment of driving through design. 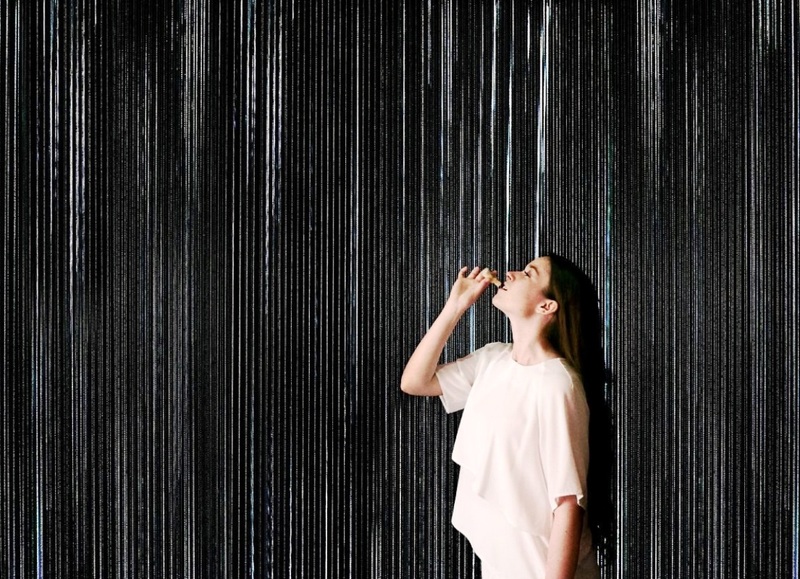 We are challenged to see the beauty of bad weather in a dark room where close-set ball chains illuminate to produce an illusion of falling rain. 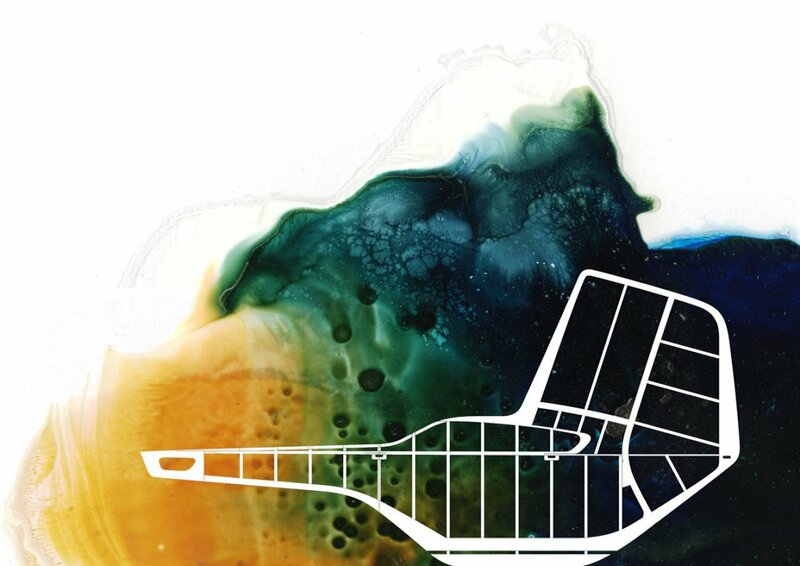 We consume ‘raindrops’ made out of sparkling candy that dissolves and sets off a sweet crackling sound somewhere in our mouth. 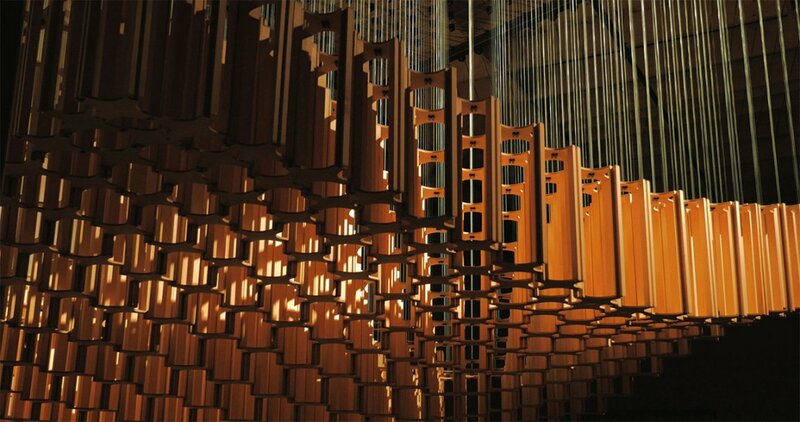 Nigro’s structure directs us to a space created to resemble the inside of a giant tree trunk. 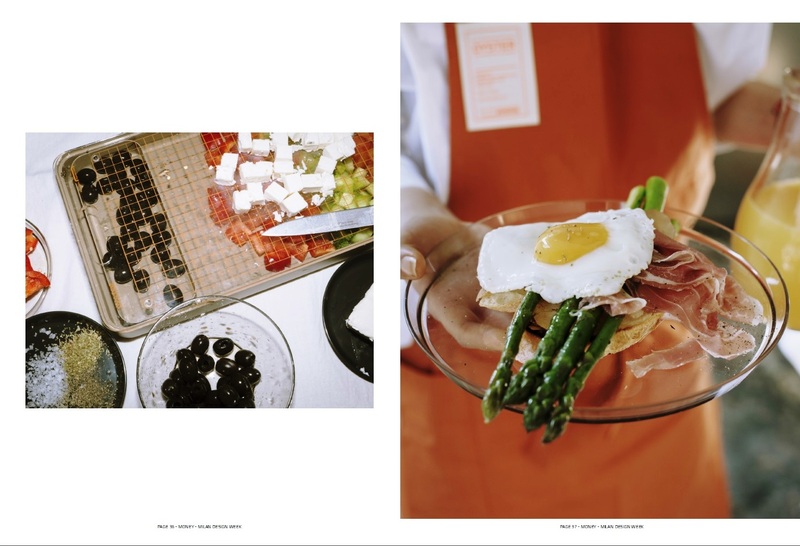 Here we pop a ball wrapped in cacao butter into our mouths and the aroma of fresh, verdant greenery washes over our senses as we absorb the quiet sounds of the forest. 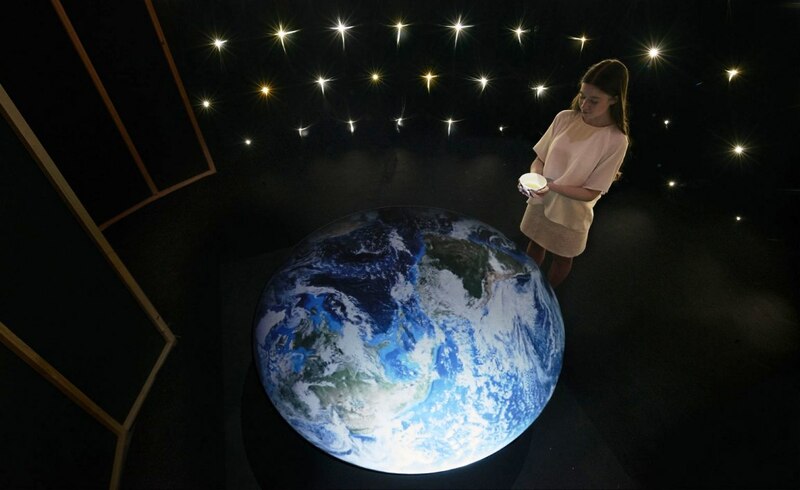 Our journey concludes in the beginning of life where we enjoy a bowl of warm ‘earth soup’ composed of the essence of vegetables, meat and fish whilst taking in the universe with its twinkling stars in pure darkness. 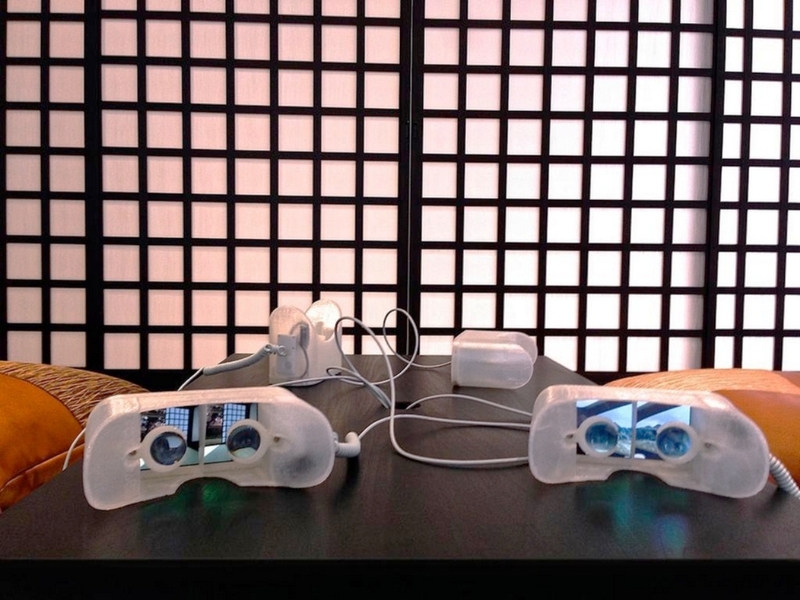 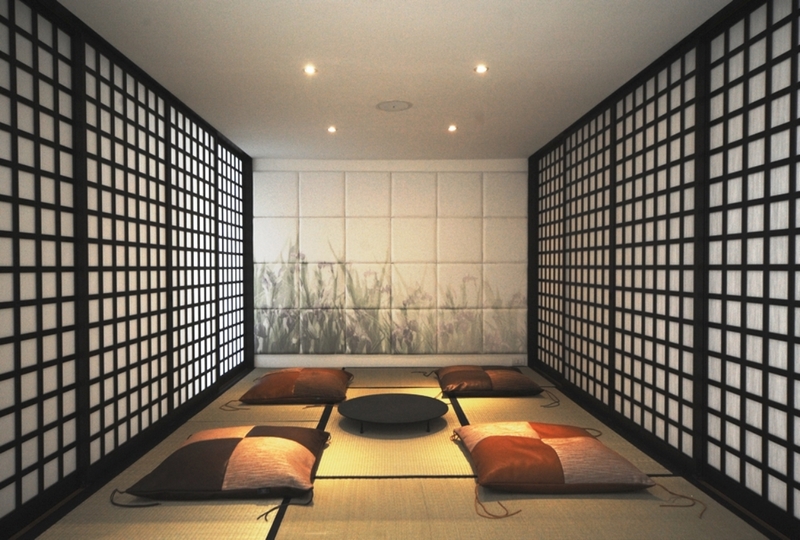 Yoneda says the idea is to calm the nerves through sight, sound, feel and taste. 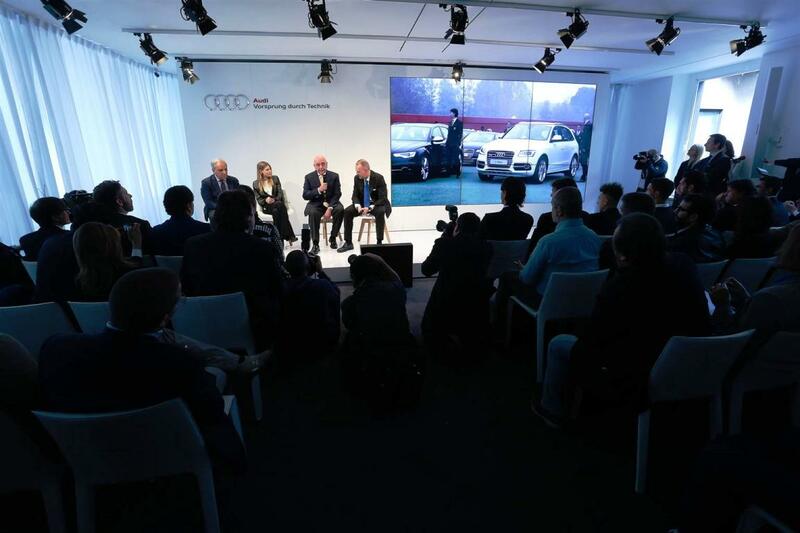 This, he believes, is the role of the car in the future to create such an environment when driving. 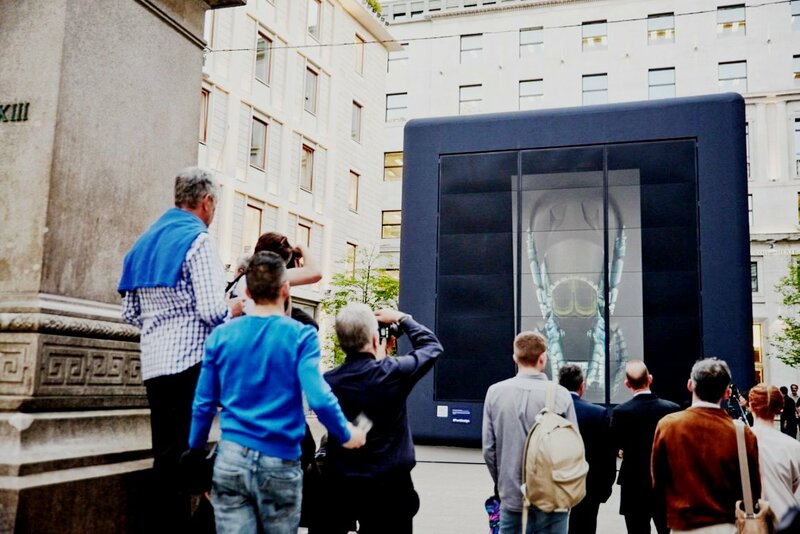 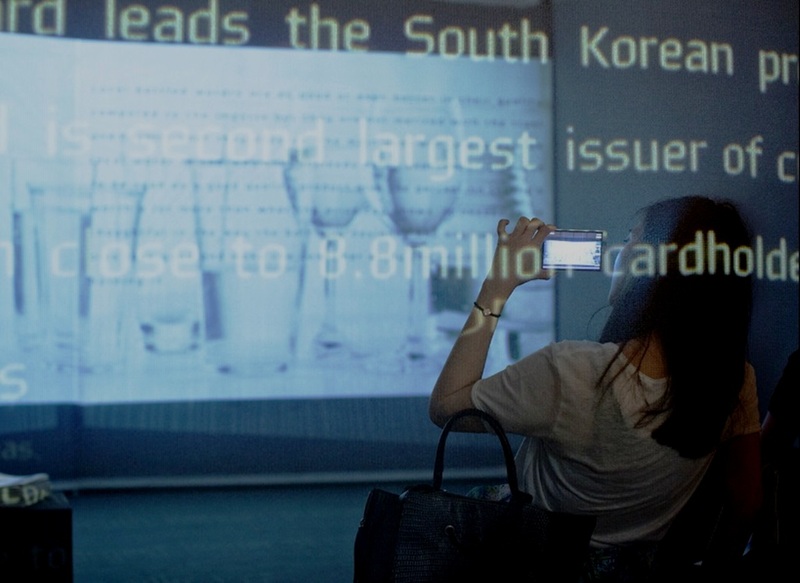 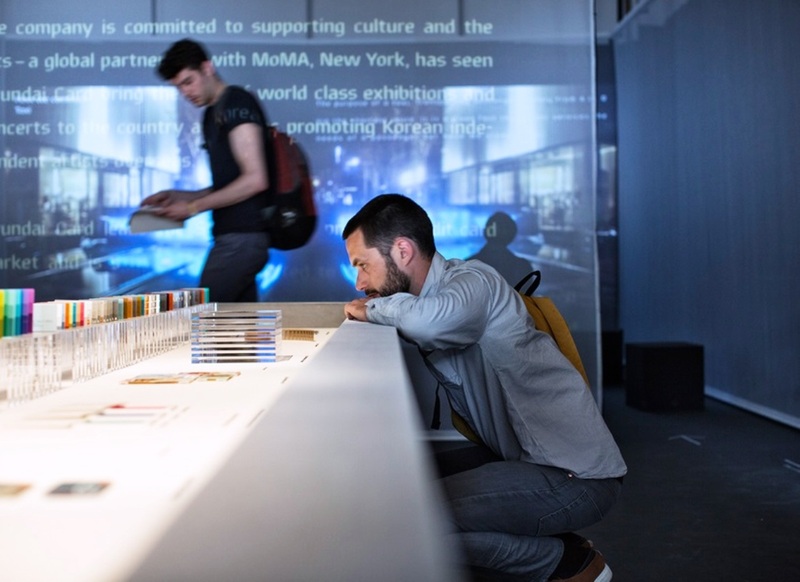 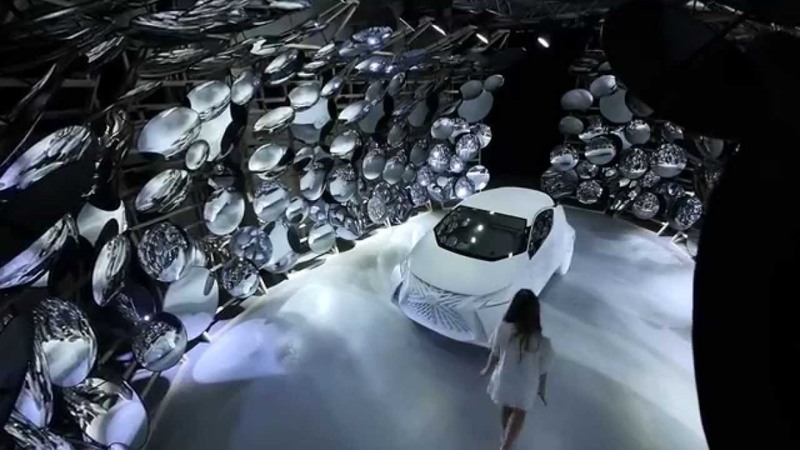 About 10,000 people every day have visited the “Lexus – Turning Space” in Milan during the days of the Fuorisalone. 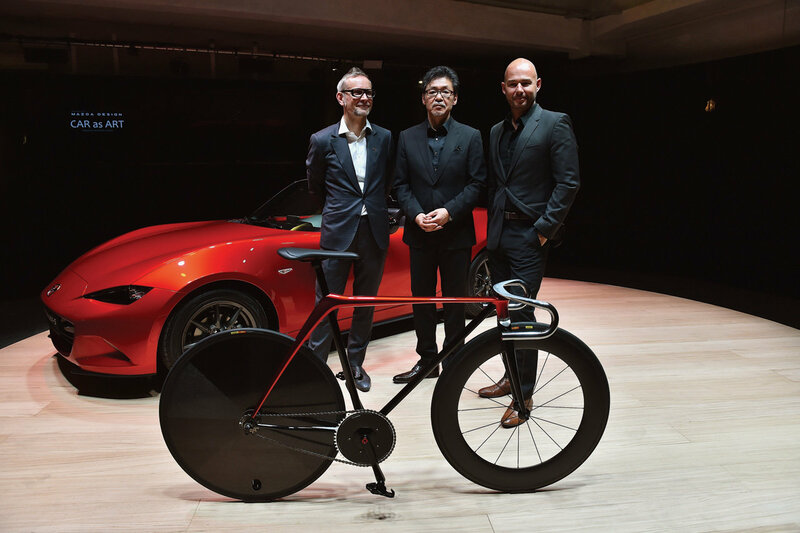 As a result Toyota Lexus won the “Best Entertainment Exhibition ” Milan Design Award for the Salone – a prize which was awarded for the first time to a car maker. 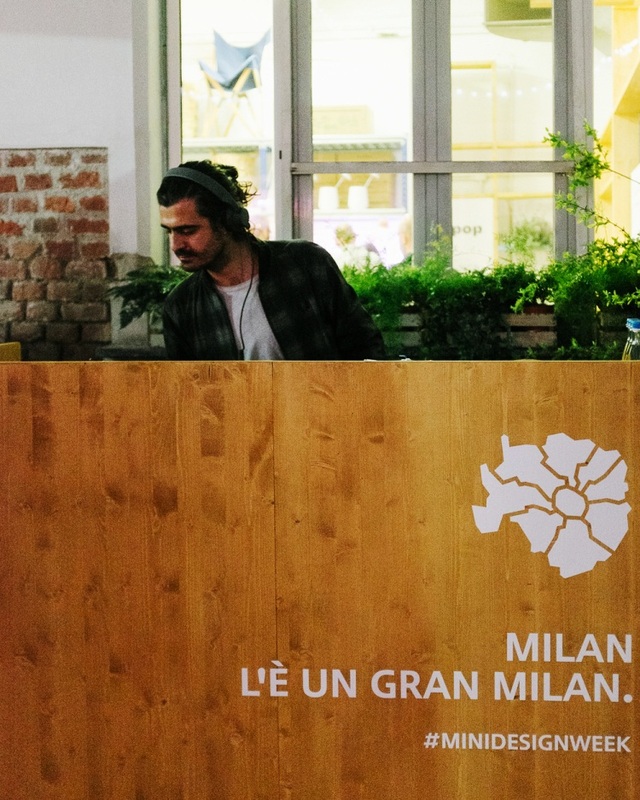 Location : Turning, via Tortona 32. 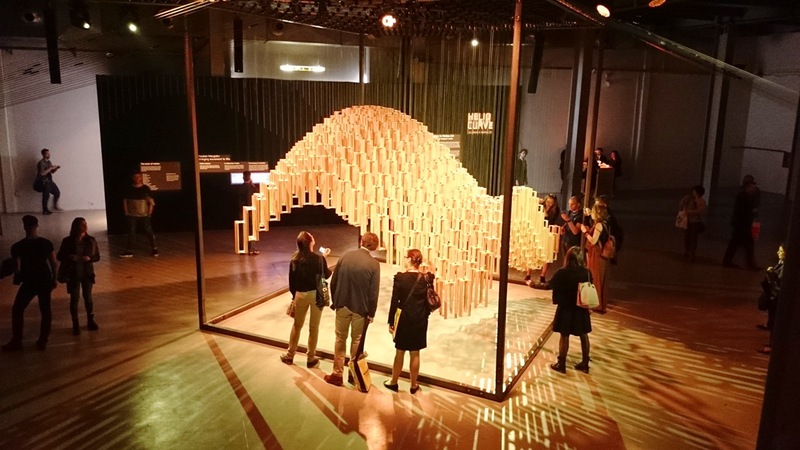 2015 marked Toyota Boshoku’s fourth showing at Milan Design Week, an exhibition which borrowed from last year’s theme of Carsa, a play on words blending “Car and Casa”. 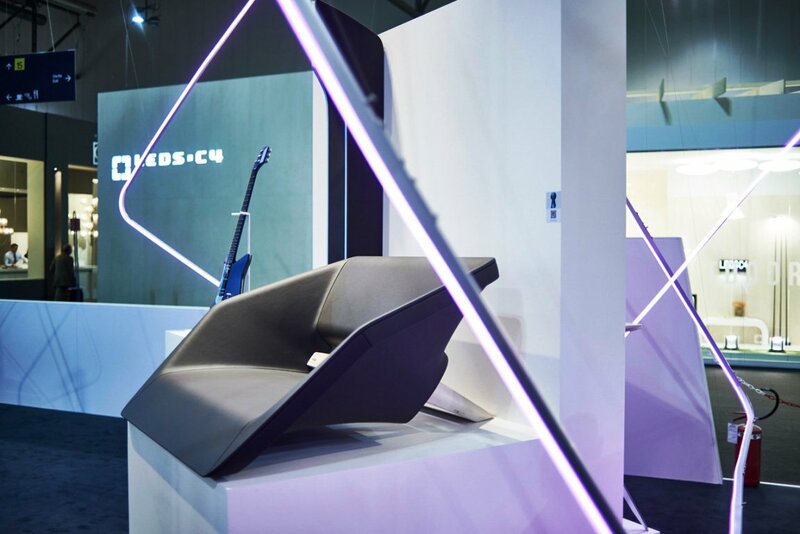 At the exhibition, Toyota Boshoku ( Toyota’s lifestyle and design branch ) presented a fusion of automotive interiors with traditional Japanese culture. 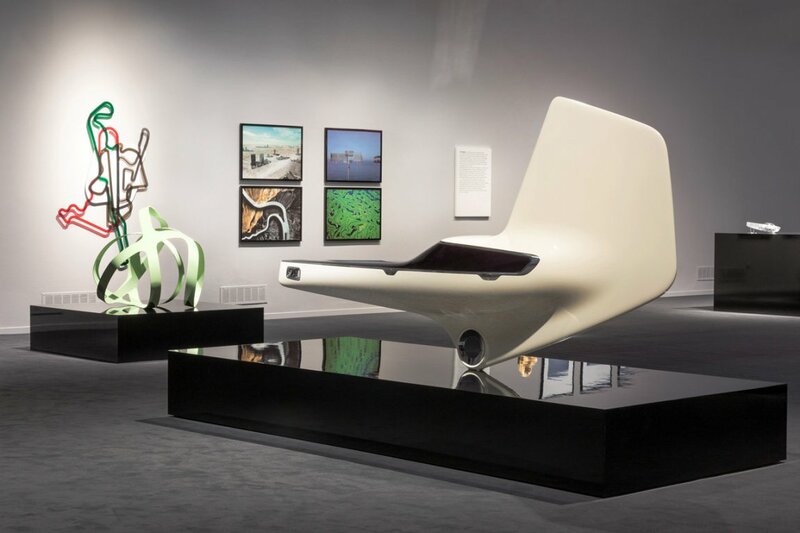 One of the items on exhibit was an “OTEDAMA Seat,” which is a beanbag-style seat that utilizes automotive fabric. 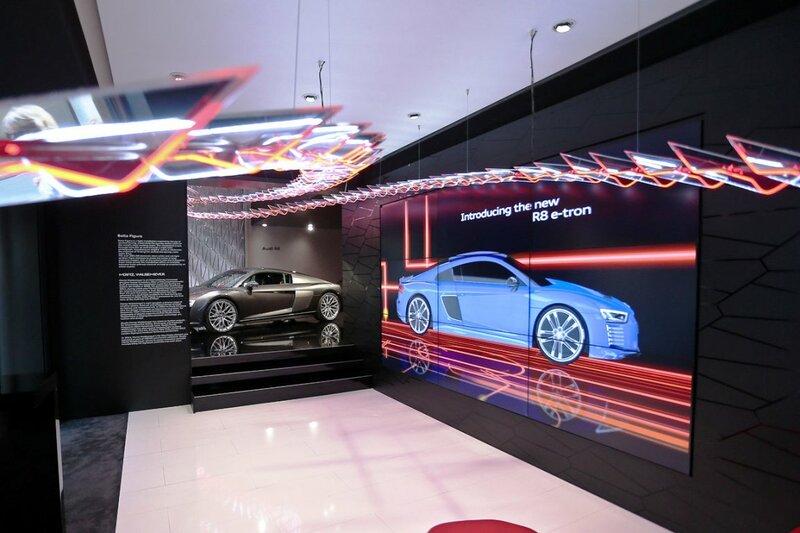 When guests wear 3D glasses in the exhibit’s Japanese-style room – complete with tatami mats and shoji sliding paper screen doors – they can become a part of the virtual experience as the room transforms into a car interior before their eyes. 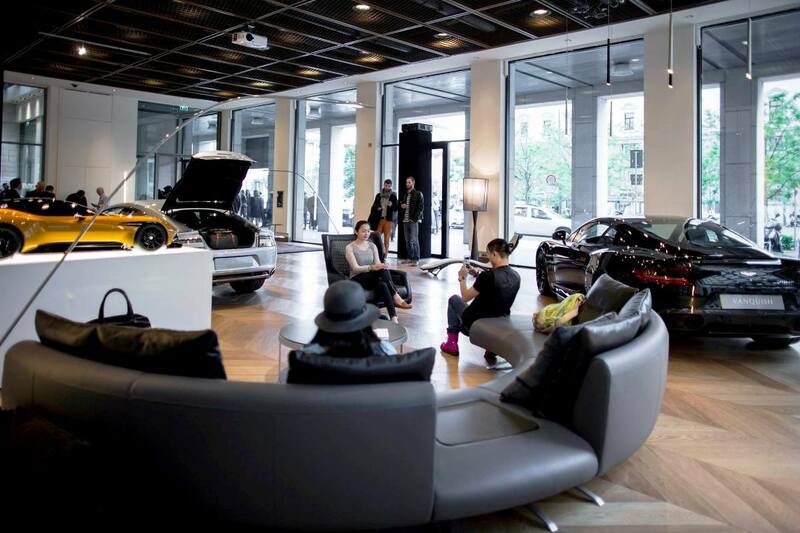 It’s the world’s premier interior system suppliers and filter manufacturers. 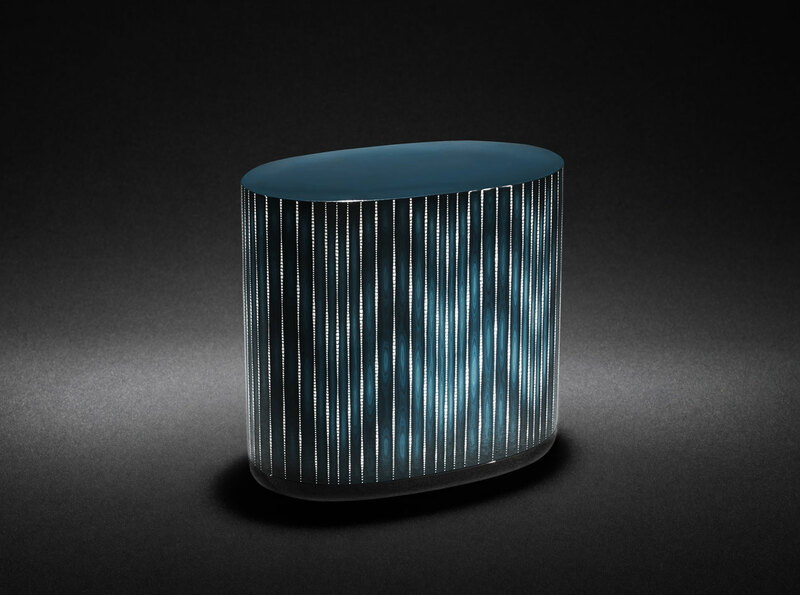 They develop and produce interior components, filtration and powertrain components at over 100 sites in 27 countries around the world. 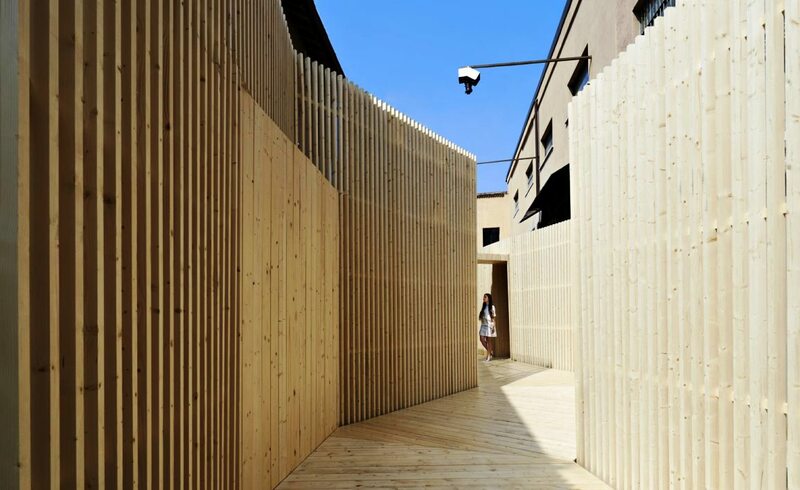 Even though they are located in the Tortona area, they are so hidden that only the most dedicated fans found their way there. 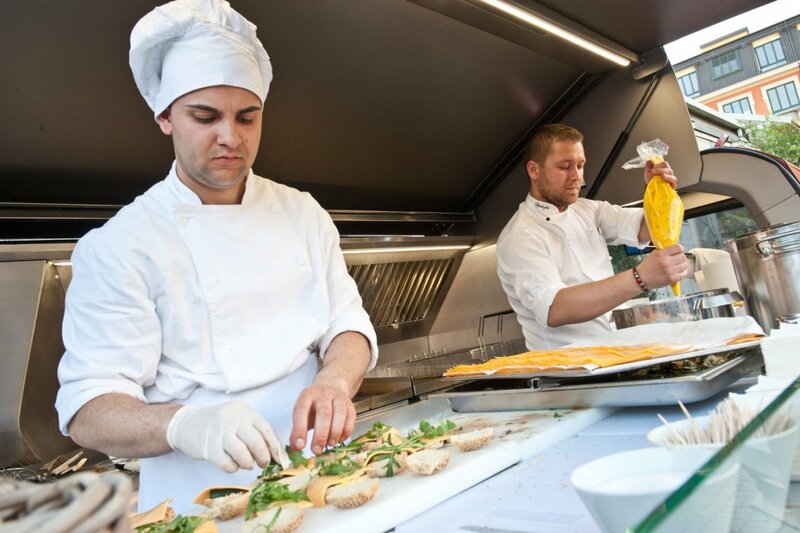 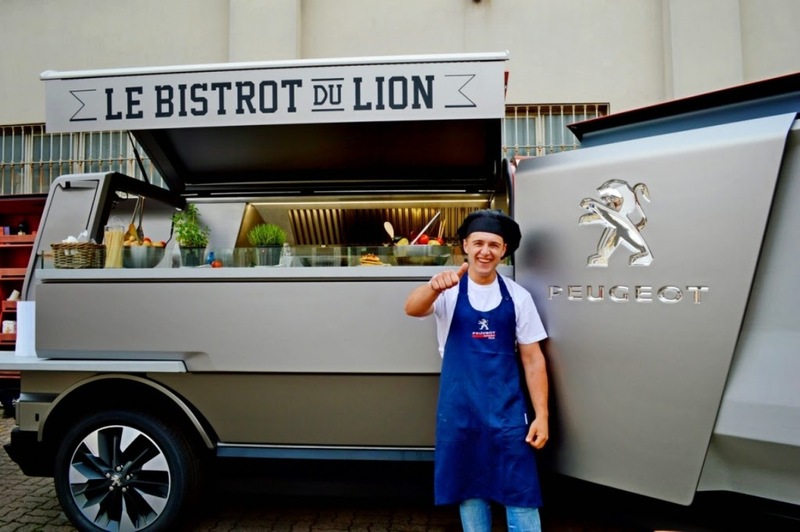 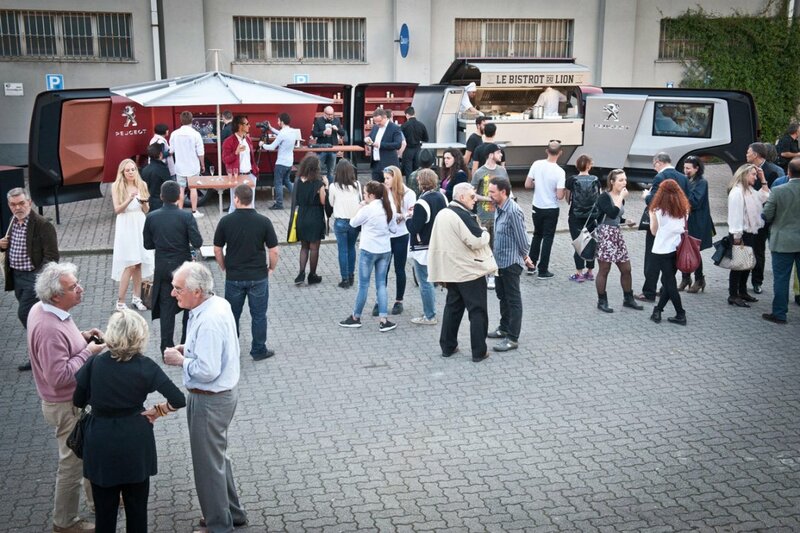 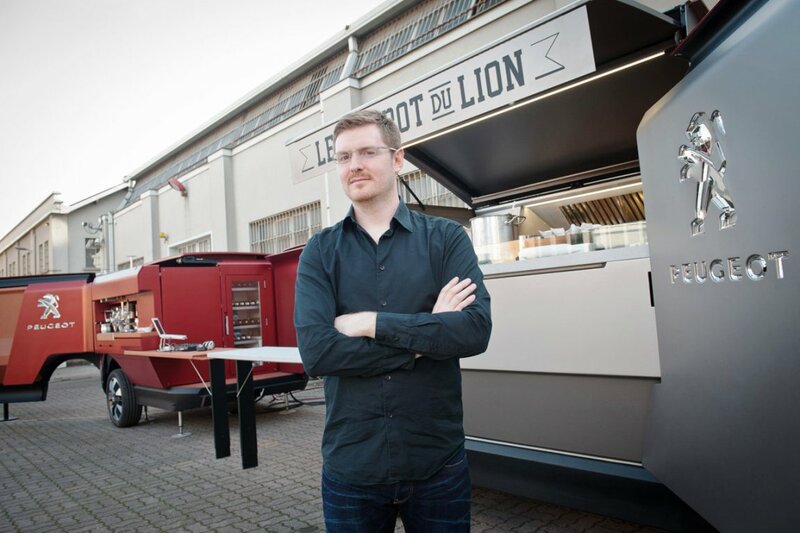 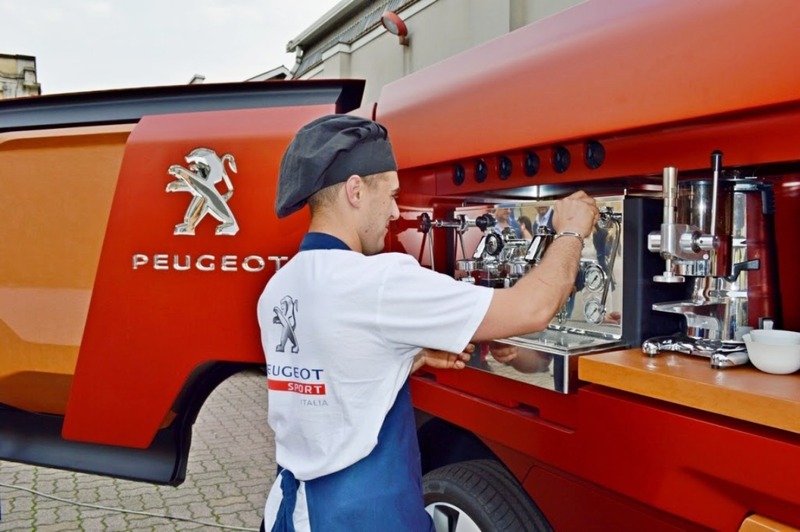 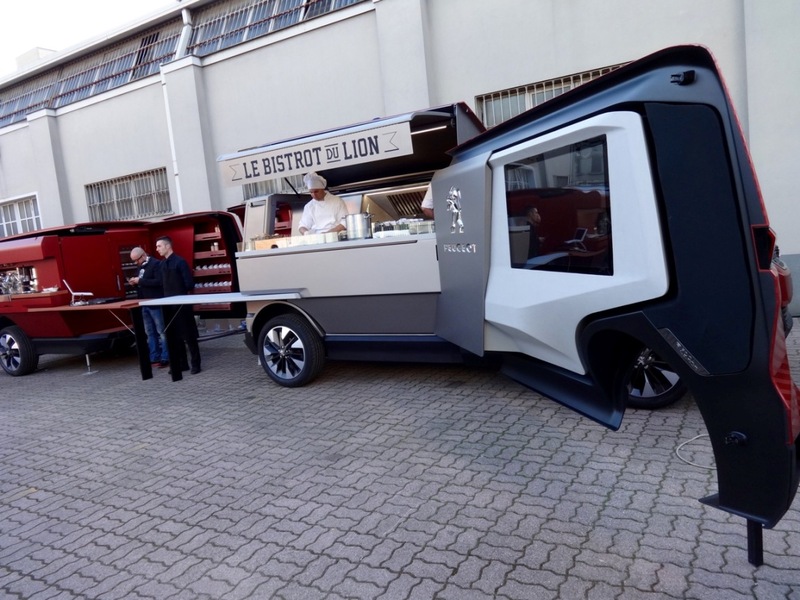 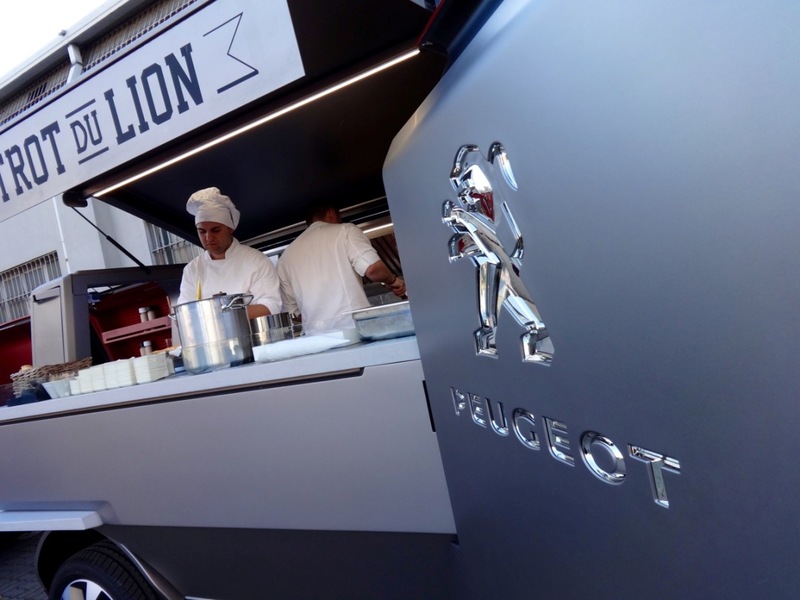 This years Specialty Food van was presented by Peugeot, who have identified the US trend towards street-food and created a fantastic food-truck, complete with kitchen, coffee bar and disco-unit. 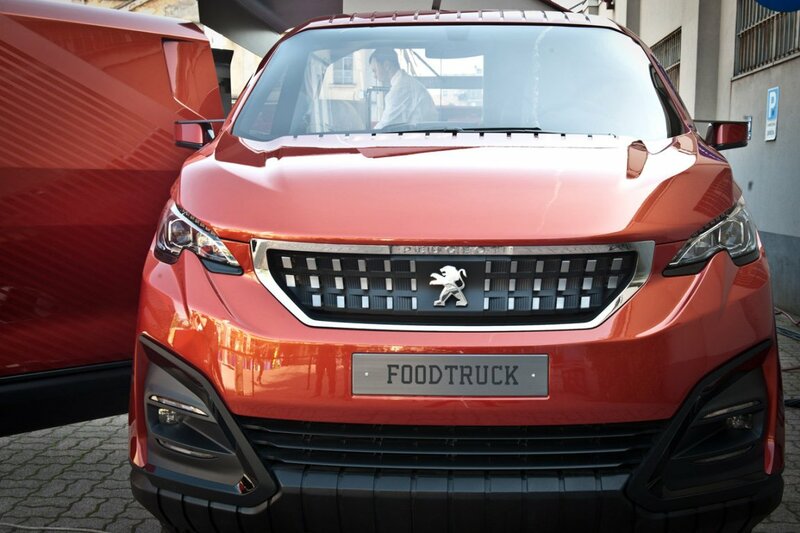 MPV has got a completely new meaning with great function and excellent execution. 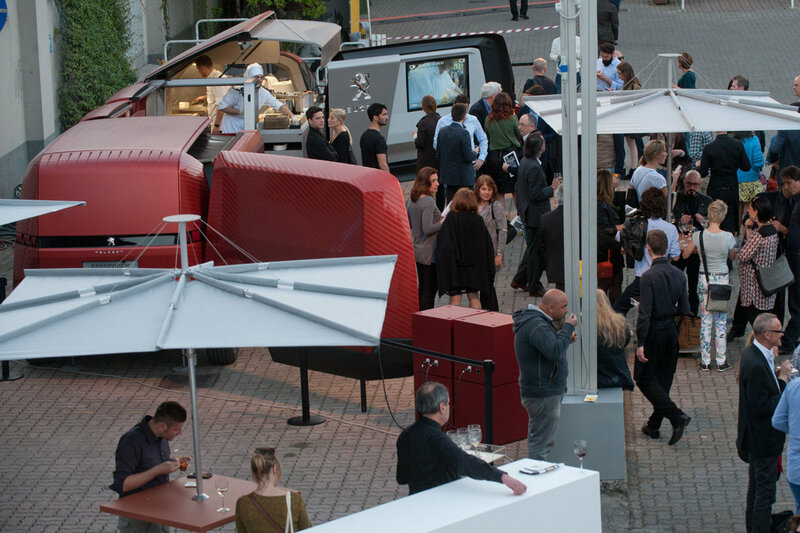 It is a real restaurant which can serve up to 30 people, who can follow their food being prepared through a large 46″ inch TV screen. 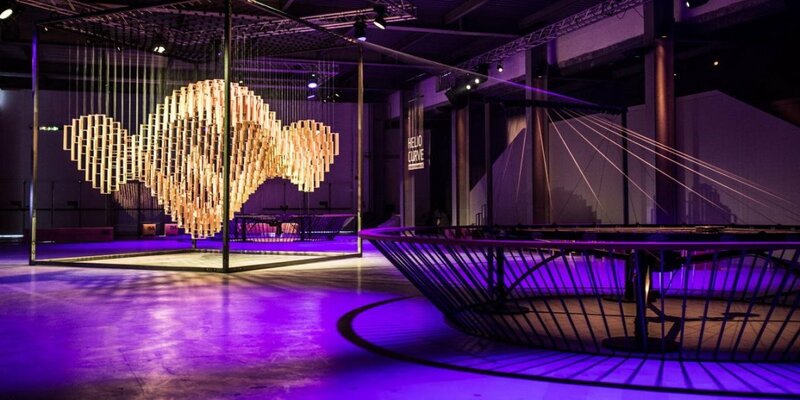 The led light installations were designed by prize-winning designer Moritz Waldemeyer. 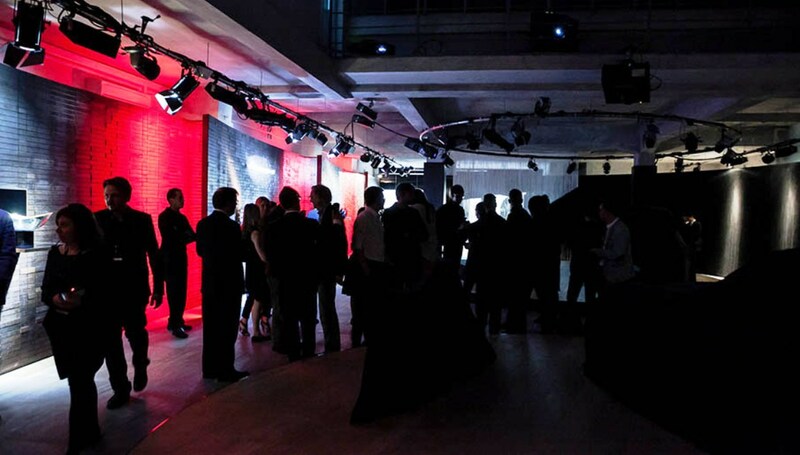 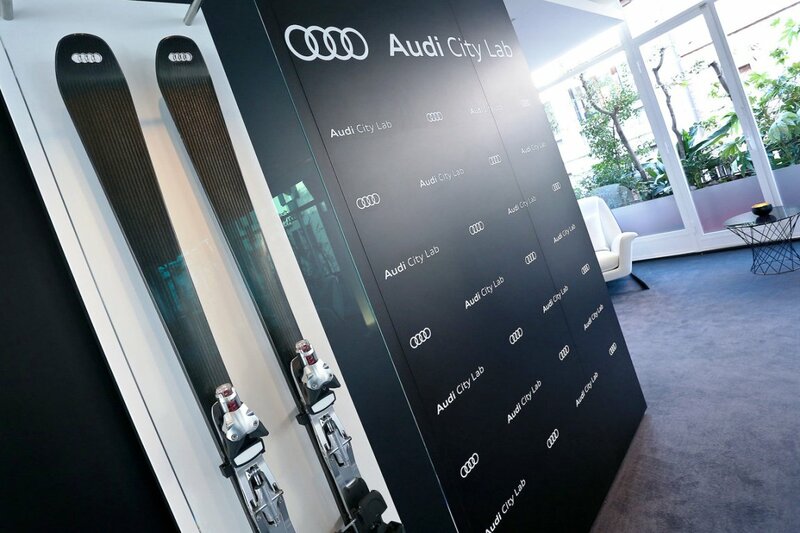 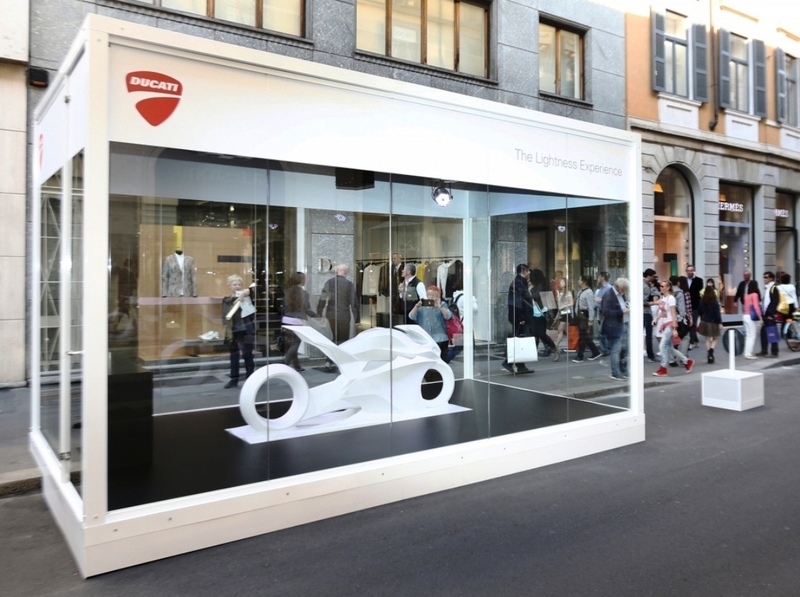 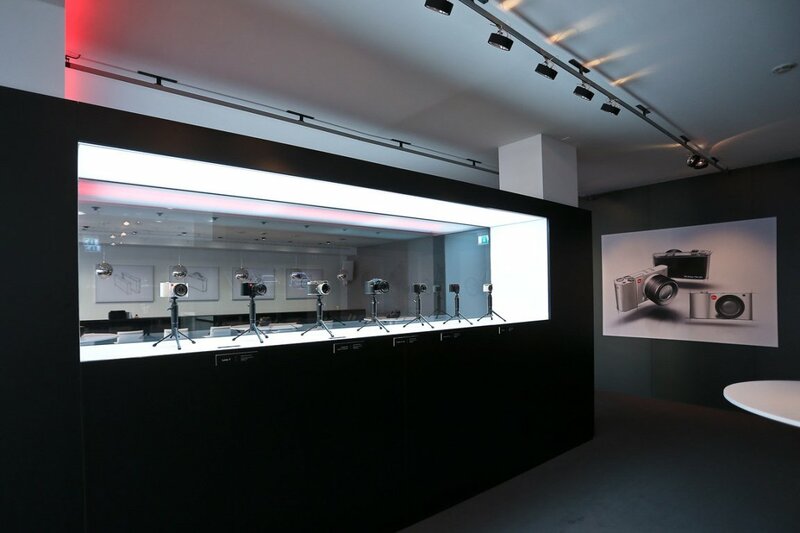 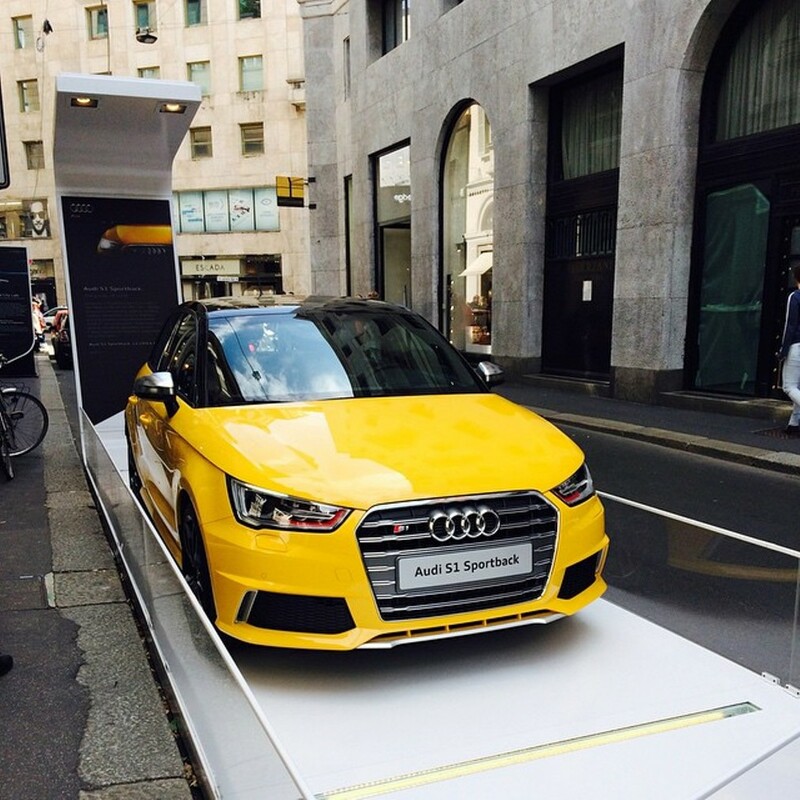 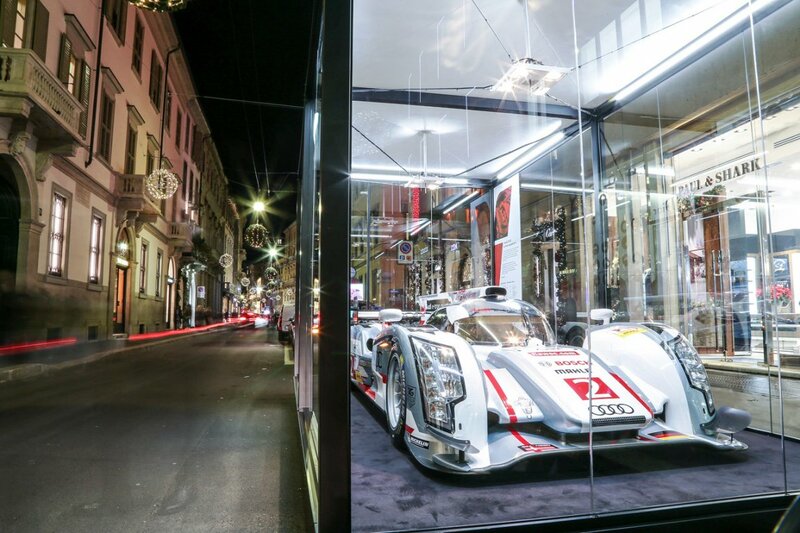 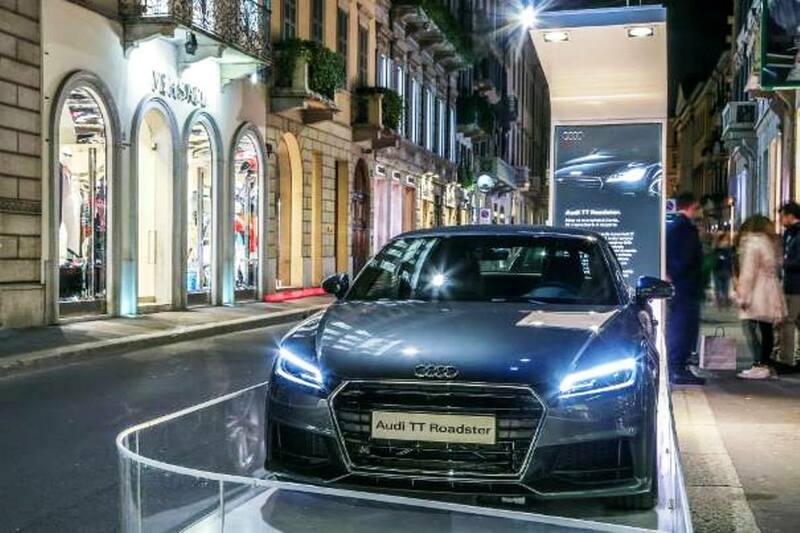 Ducati contributed to the Audi City Lab, by presenting its’ Lightness Experience expressed with two different installations. 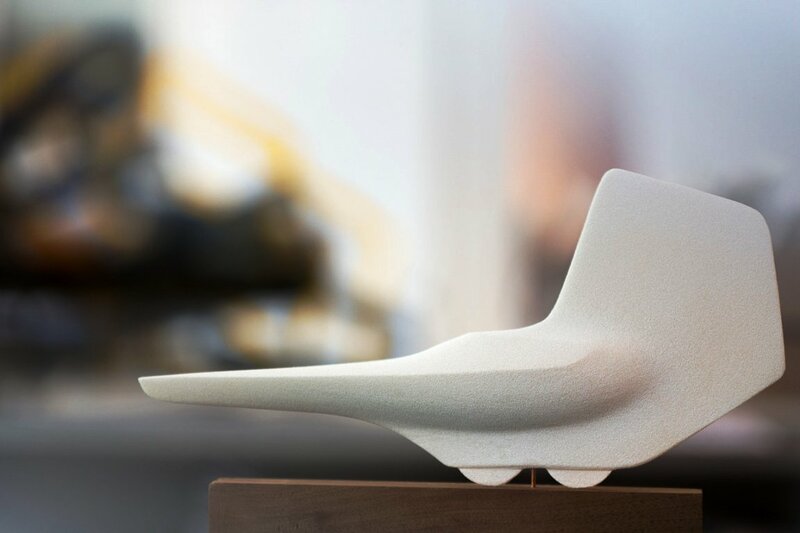 Fortitudo mea in levitate ( = my strength is in lightness ) is the name of the sculpture that was created from three pure blocks of Carrara marble, artfully crafted to convey the lightness that is deliberately in sharp contrast with the marble’s weight has always been recognized as the noble material of art. 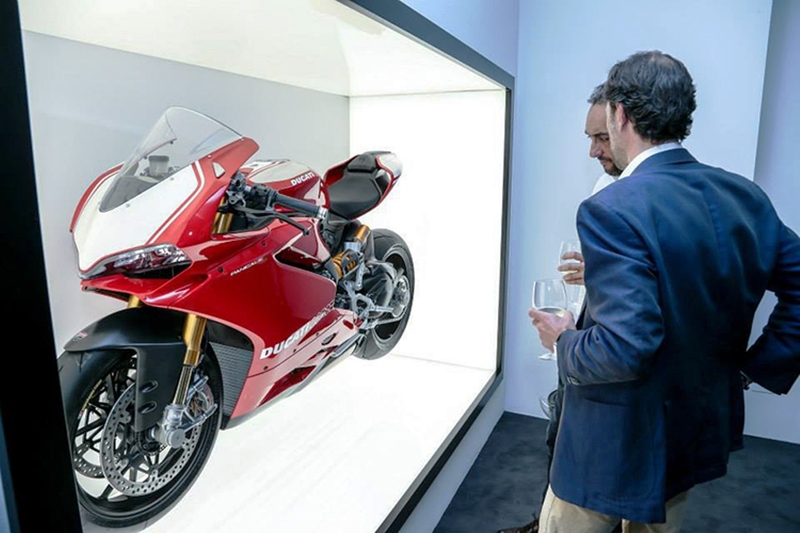 Ducati’s second installation featured a Ducati Panigale R, the most powerful production motorcycle and performance available in range, a true reference in the field in terms of power-to-weight ratio. 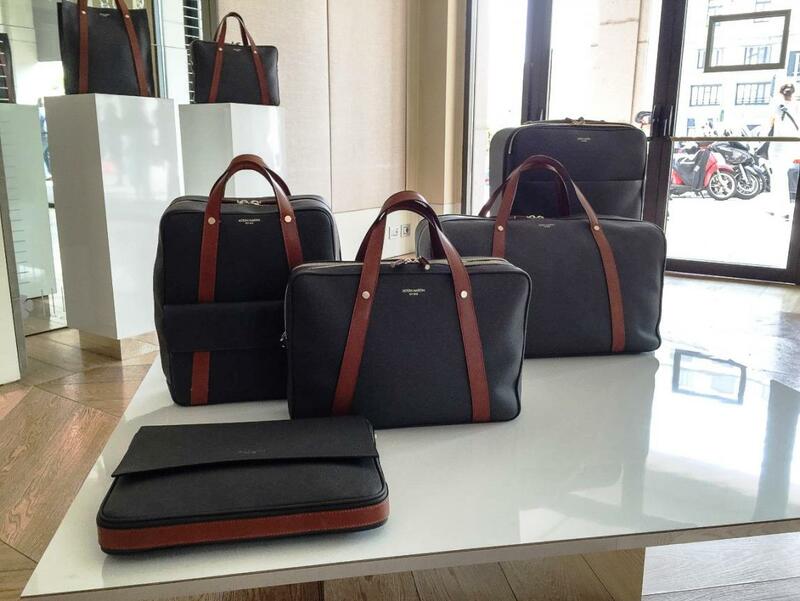 Entirely fabricated in Italy, the collection of high-end rolling bags were created using the same materials employed in Lamborghini’s super sports cars: carbon fiber cured in the autoclave, fully-machined aluminium, and high-grade hides tanned exclusively in Italy. 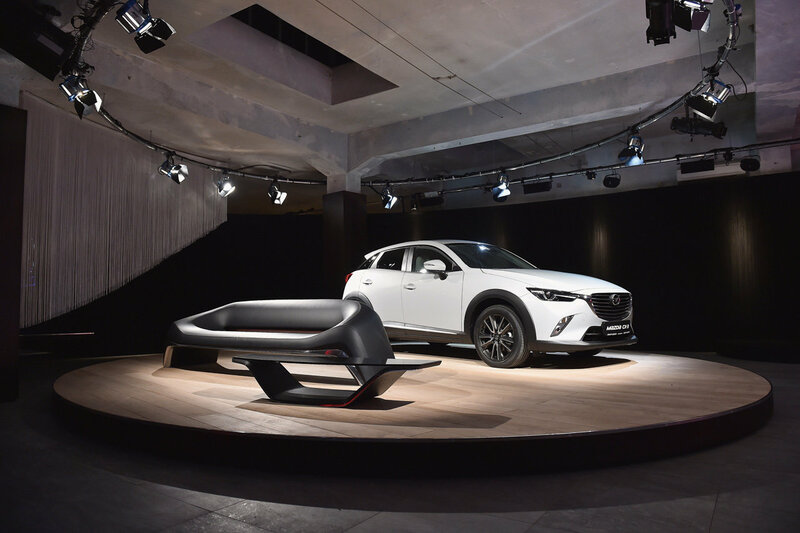 The exhibition “Design: The Mazda Car as Art”, the CX-3 and MX-5 are displayed next to some objects made by Japanese designer inspired by the theme of design “KODO, Soul of Motion” that characterizes all Mazda. 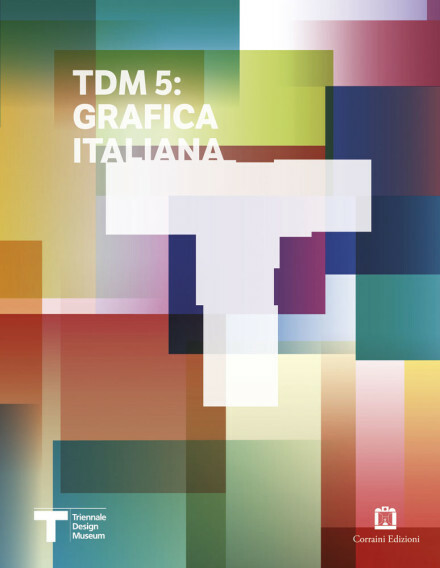 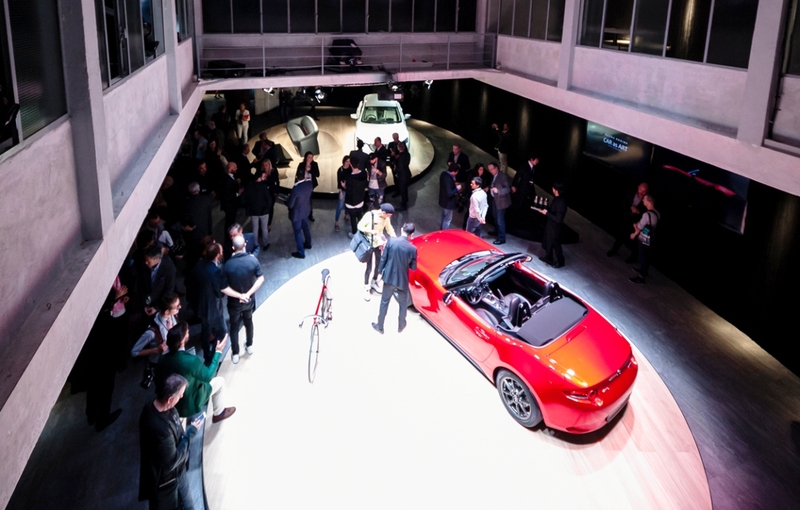 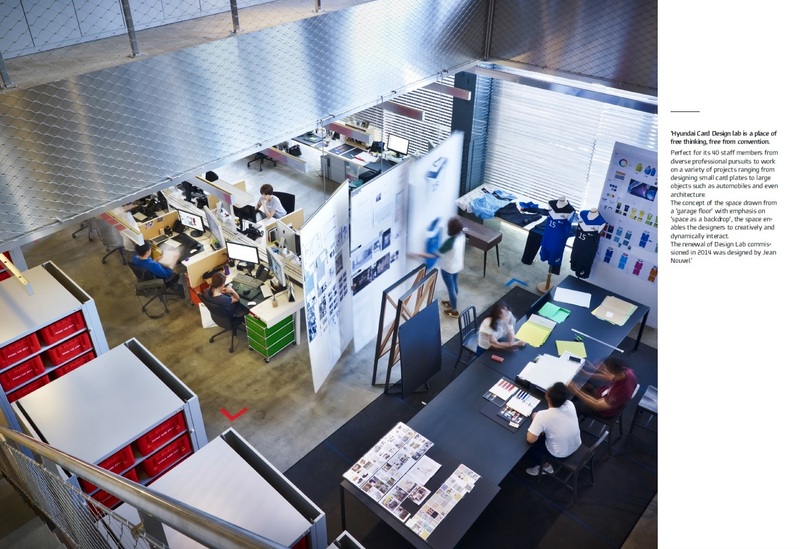 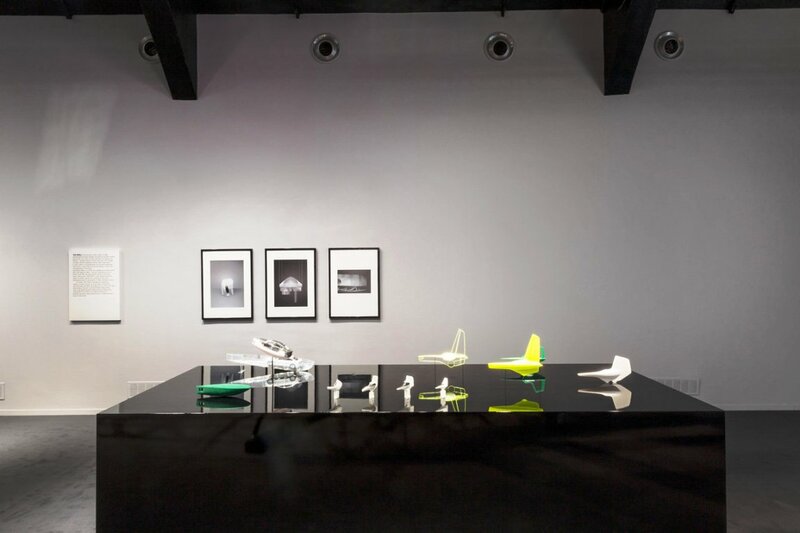 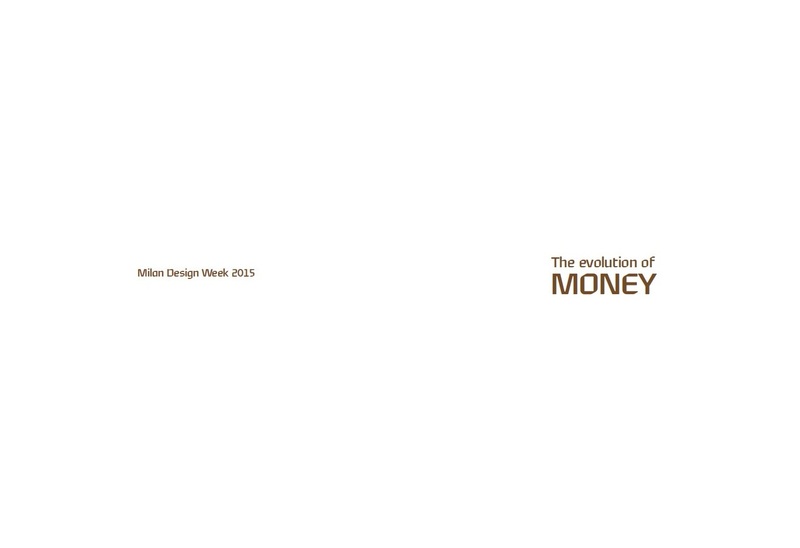 The Mazda Motor Corporation has developed a strong relationship with Design Week and with Milan. 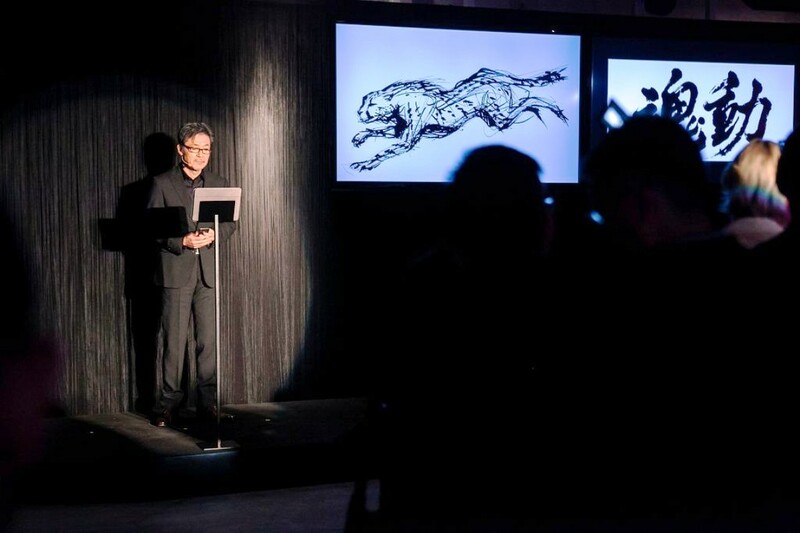 Indeed, the city was the backdrop chosen for the official global presentation of the Mazda Kodo design theme in 2010 and 2013 but this year the Japanese corporation’s presence is very special. 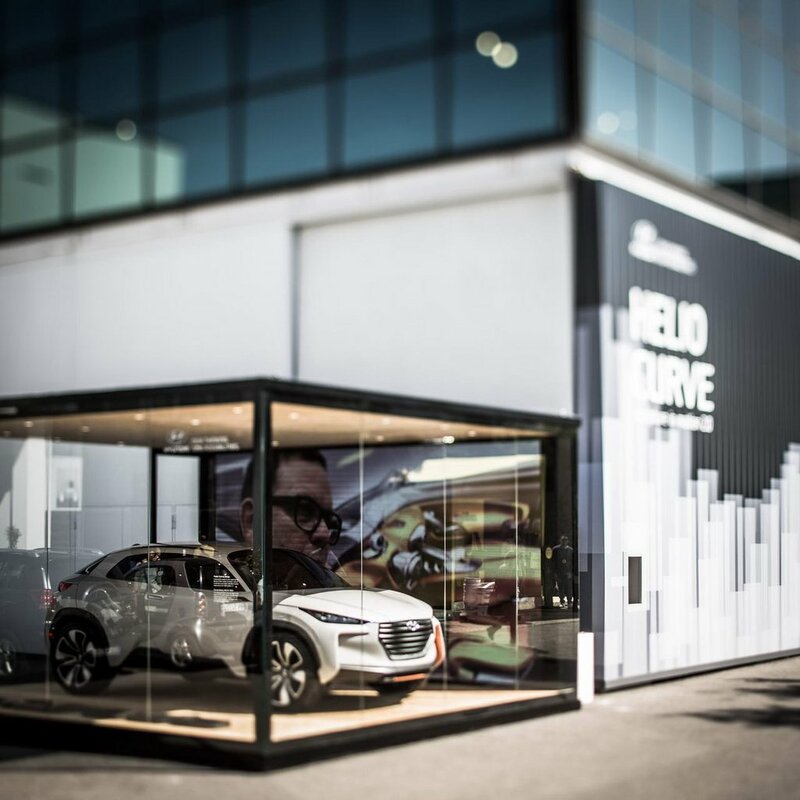 Mazda in 2015, was so exclusive, that for the first two days they were closed for the general public – “By invitation only”. 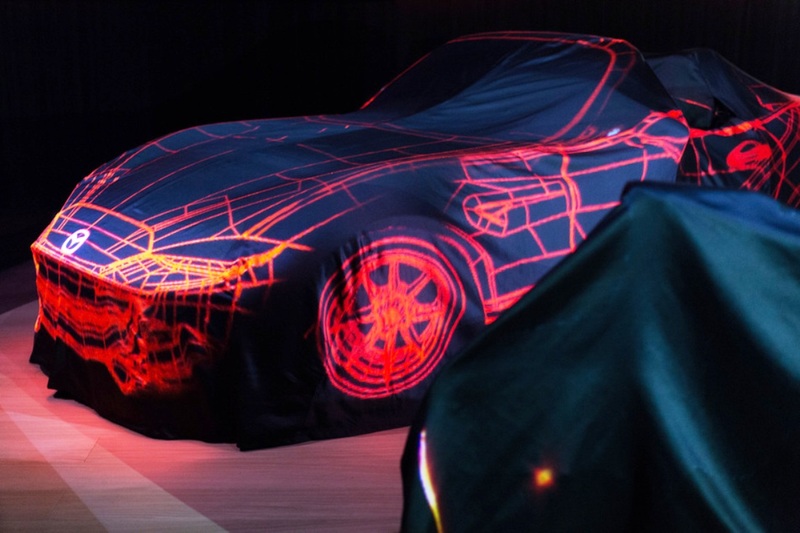 “Over the past few years, design has become an essential part of who we are, adding an artistic value to the entire Mazda brand experience,” said Masahiro Moro, Mazda’s managing executive officer, in charge of global marketing, customer service and sales innovation. 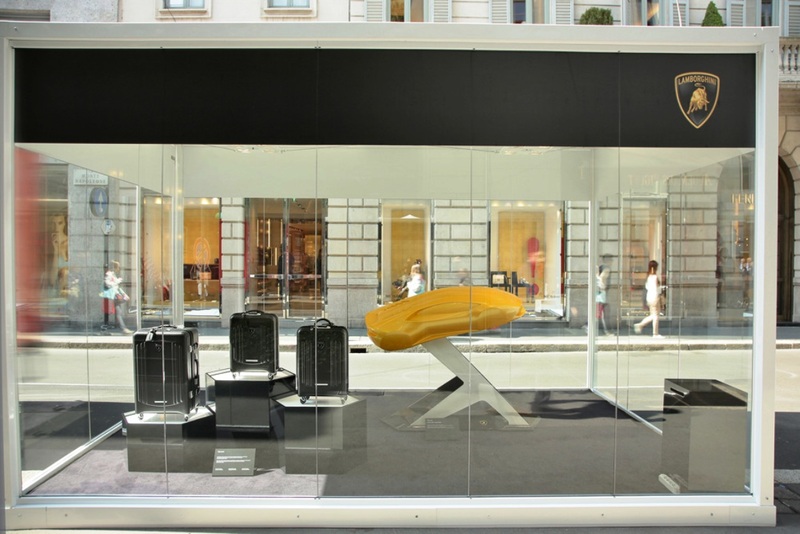 Mazda was also fairly modest, but they had at least their own, fancy, pop-up showroom in the Brera district. 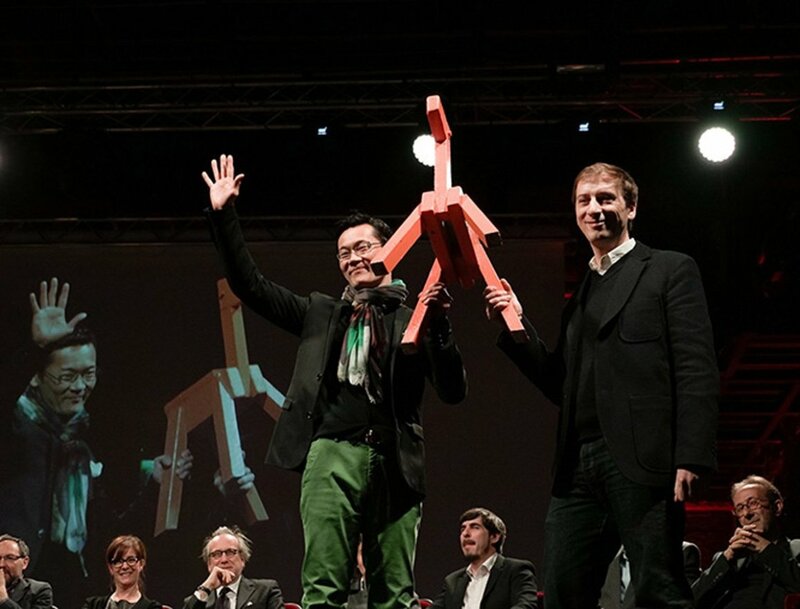 They were here two years ago, launching the Kodo design-language chair. 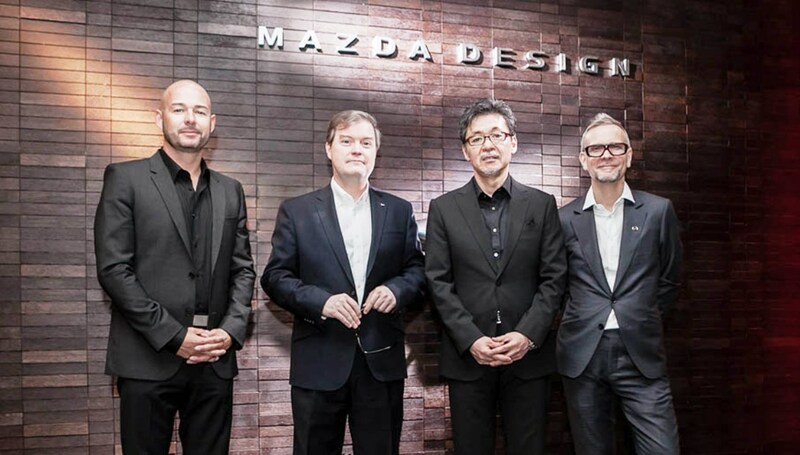 Kevin Rice, Mazda’s European Design Director, describes the car manufacturer’s design philosophy as a “spirit” that finds its raison d’être in motion and which the Hiroshima Group has called “Kodo”. 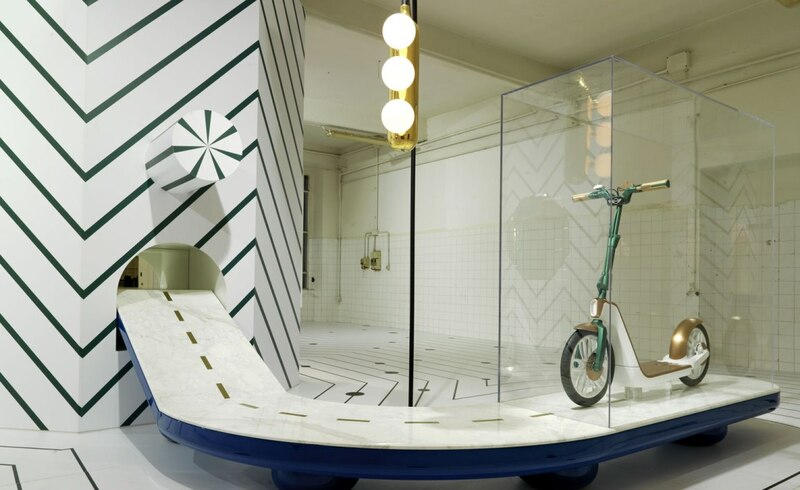 Kodo Design has proved extremely flexible and given special character to all the pieces created, which include a sofa, a table and even a bicycle. 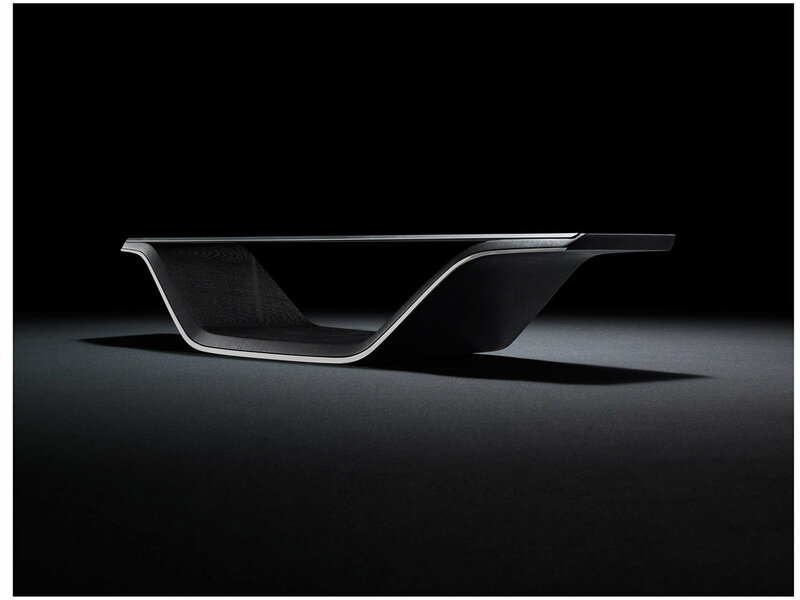 Kodo Sofa, which combines the intrinsic beauty that lies in the balance between form and function. 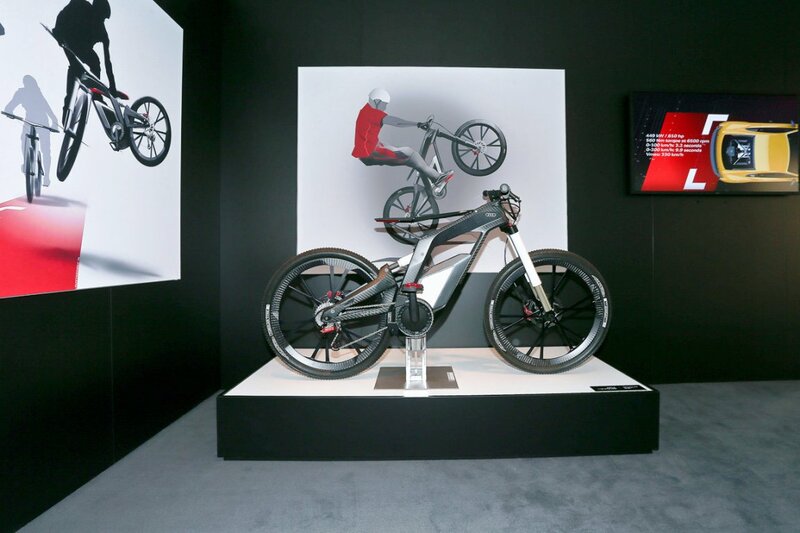 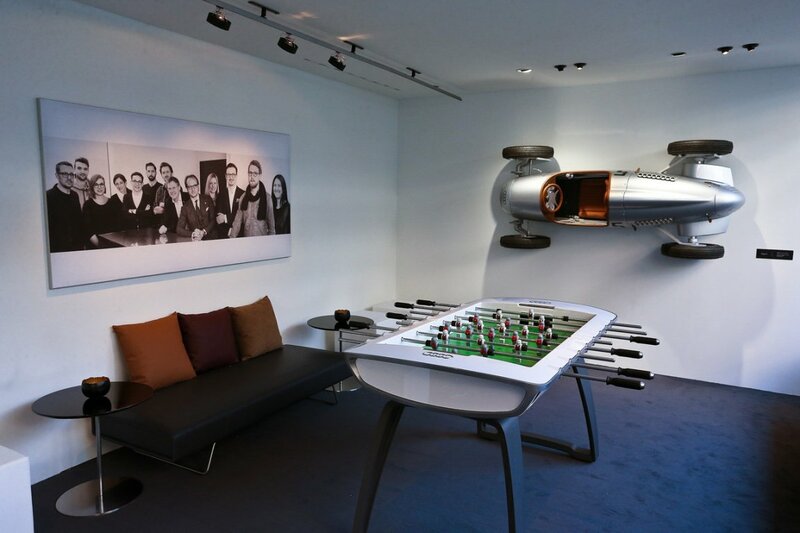 The sofa and racing bike on display are one-off pieces that convey creative engineering, a more European approach to problem solving. 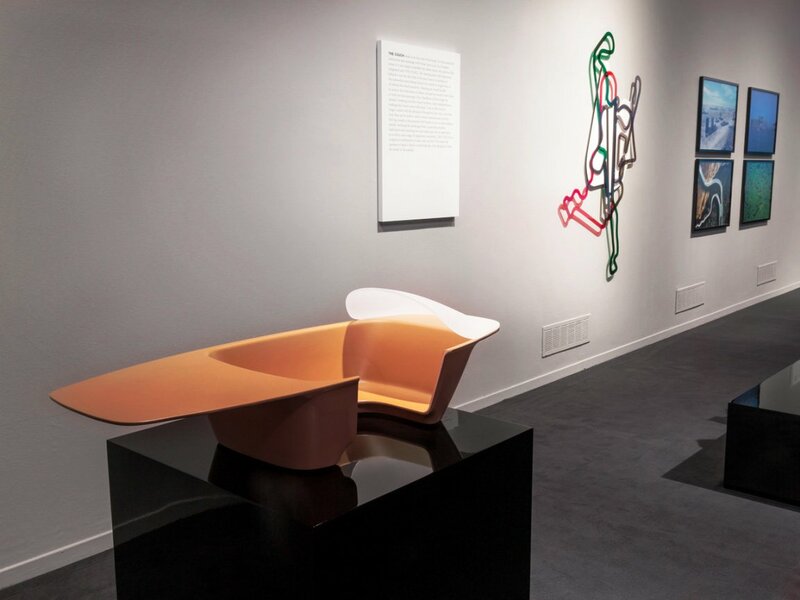 The foam within the long, elegant sofa designed in collaboration with Milan’s Setsu and Shinobu Ito, for instance, needed to be milled in a way that even the Italian producer responsible found challenging. 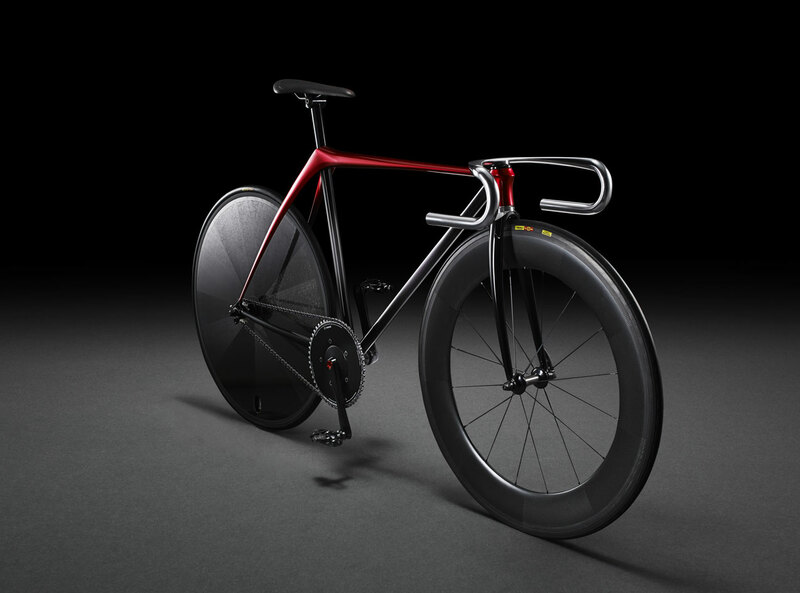 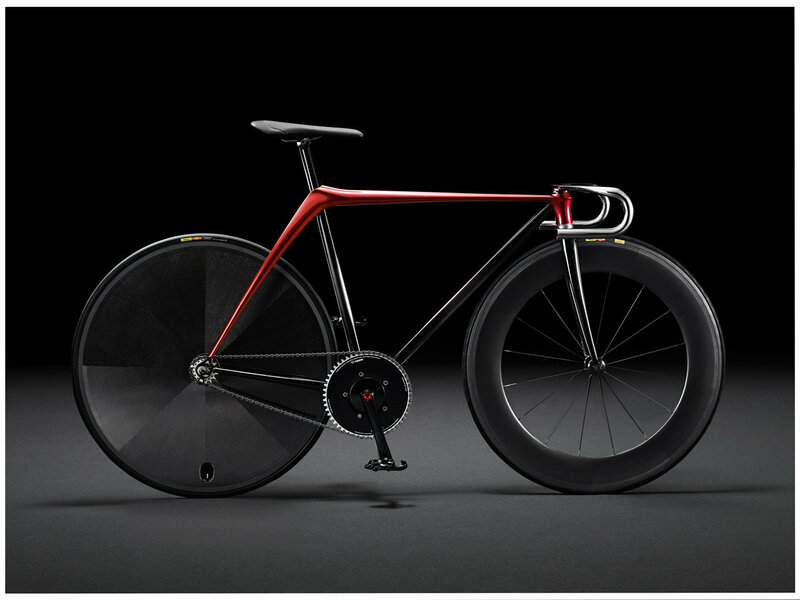 The bike is a racing bicycle designed to show the “innate beauty” of the bike. 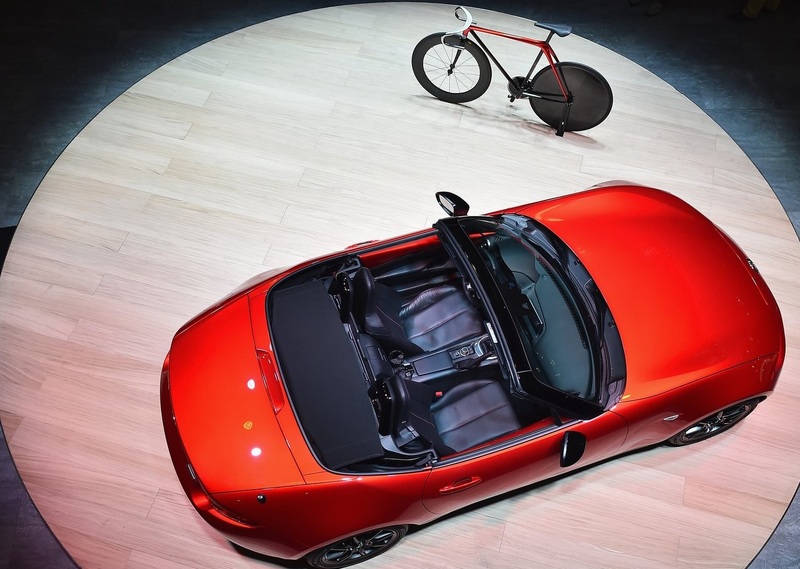 The bike frame is beaten from a single sheet of steel, with the hand-sewn leather saddle featuring the same stitching as the upcoming MX-5’s upholstery, and the red in the colour scheme is symbolic of Kodo. 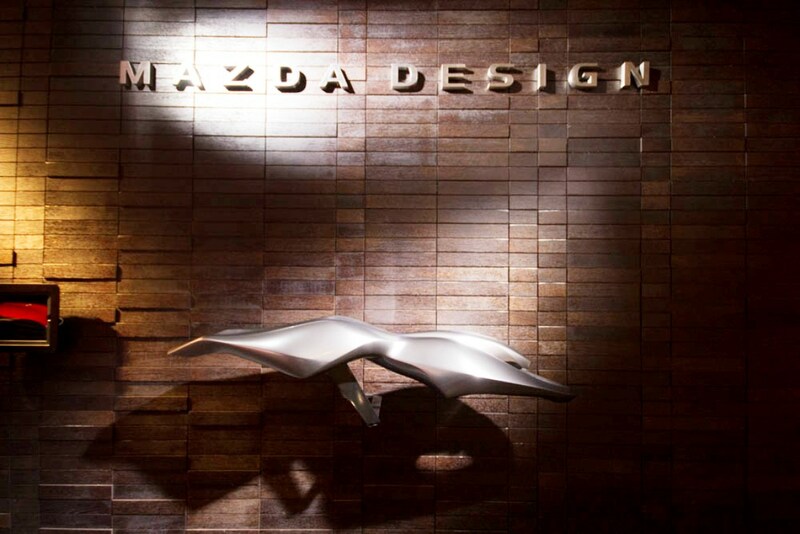 To explore the drive of the unlimited motion expressed in these design products, Mazda went back to their roots and cemented the bond with the Japanese aesthetic of elegance. 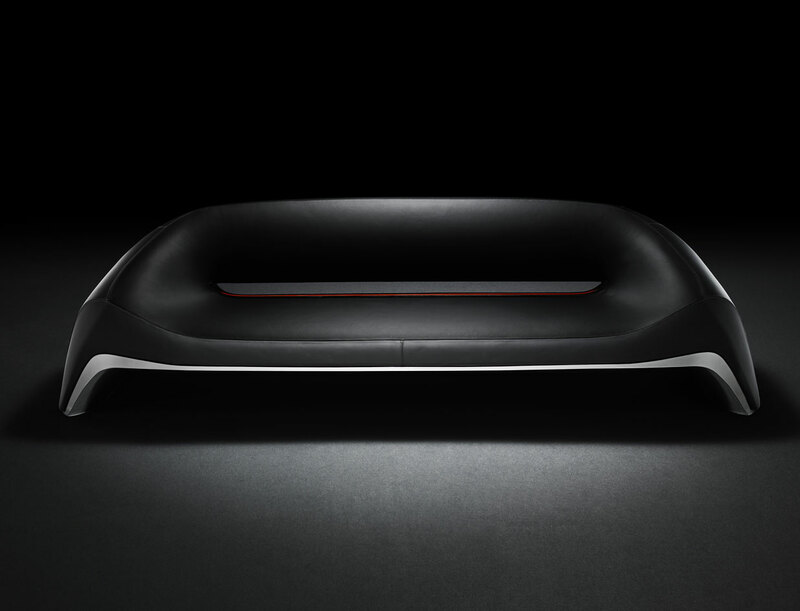 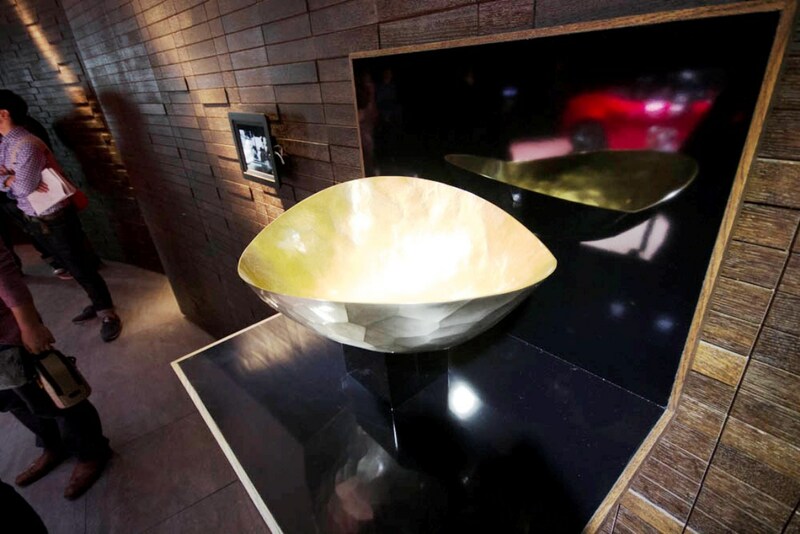 Mazda used the occasion of the Salone to explore Kodo, its design philosophy rooted in old Japan, through a range of objects made by skilled Japanese artisans and internally by the Mazda design team. 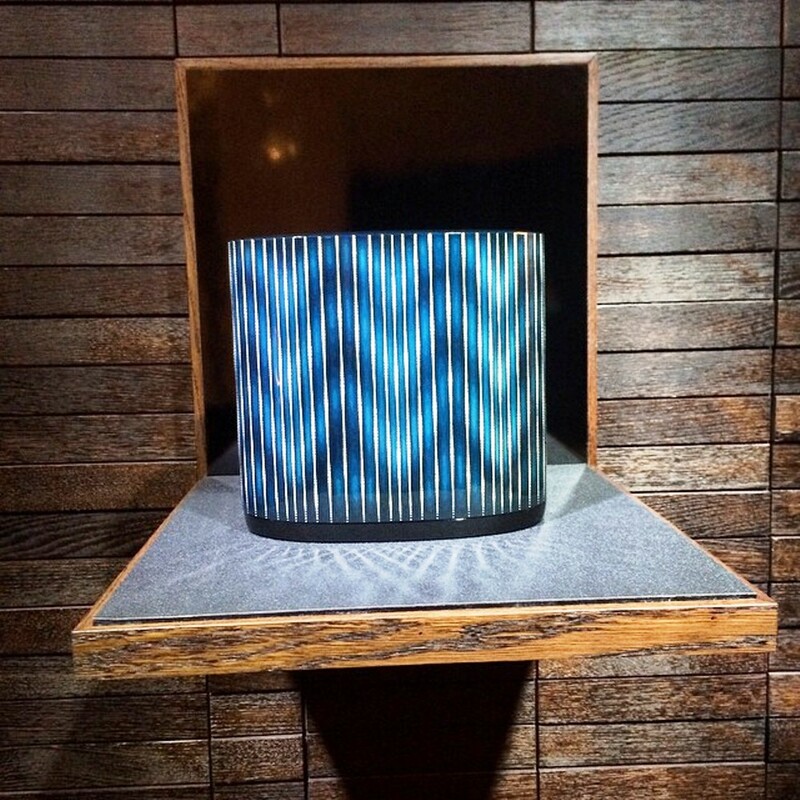 Similarly the Shiraito lacquered box by Hiroshima artisan Kinjo-Ikkokusai uses the Cho-Shitsu technique. 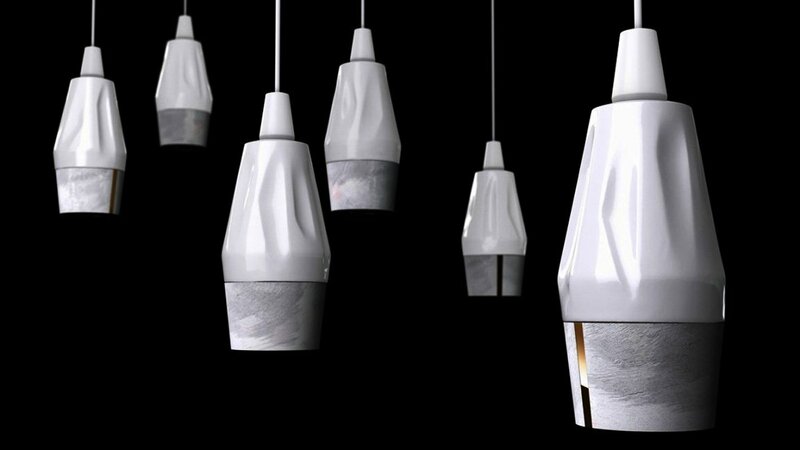 Inspired by waterfalls, here the streams of water are painstakingly built up by individually applying tiny flakes of eggshell to the lacquer base. 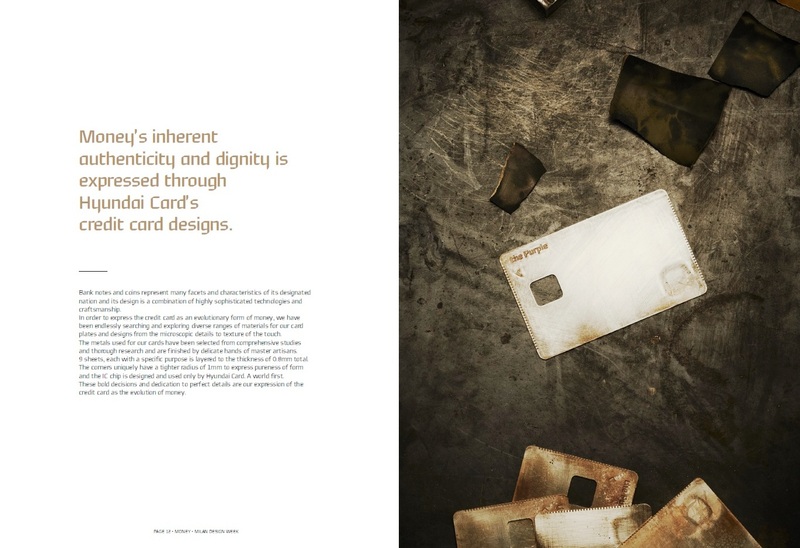 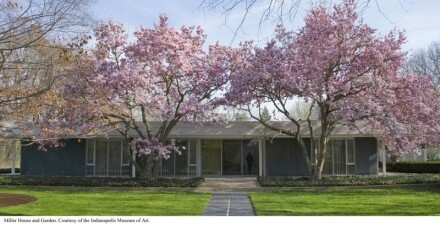 This simplicity, essence and sense of proportion speak directly to the senses and are what builds a timeless aesthetic. 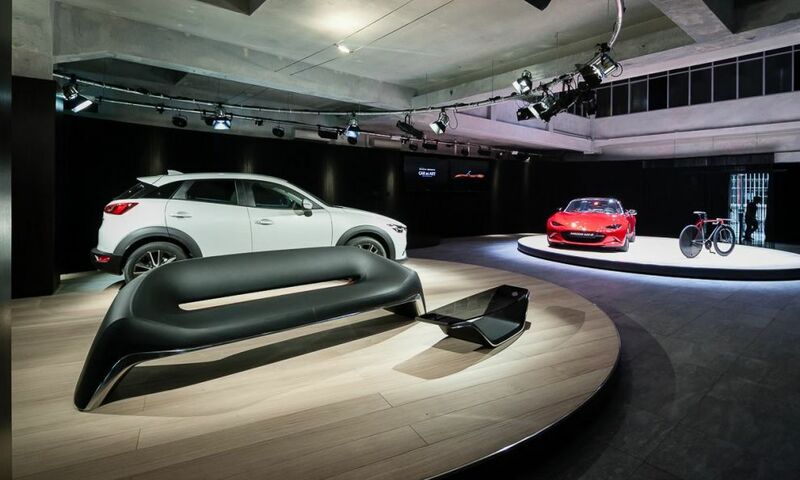 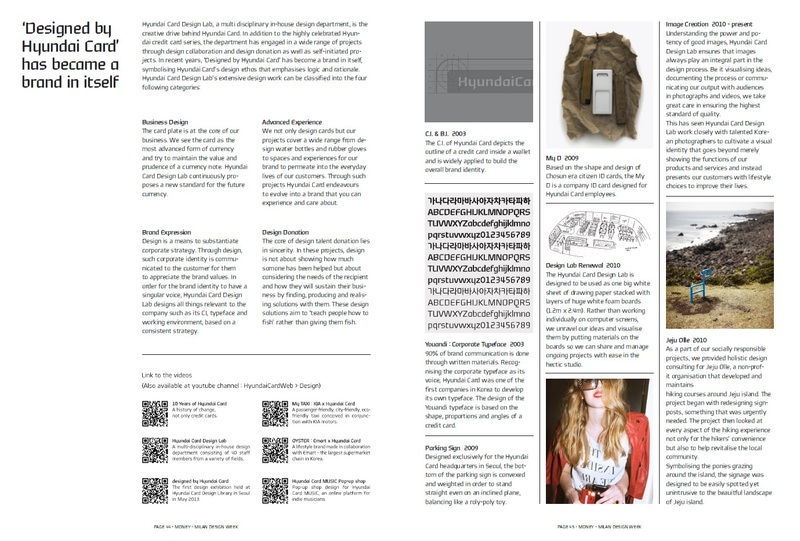 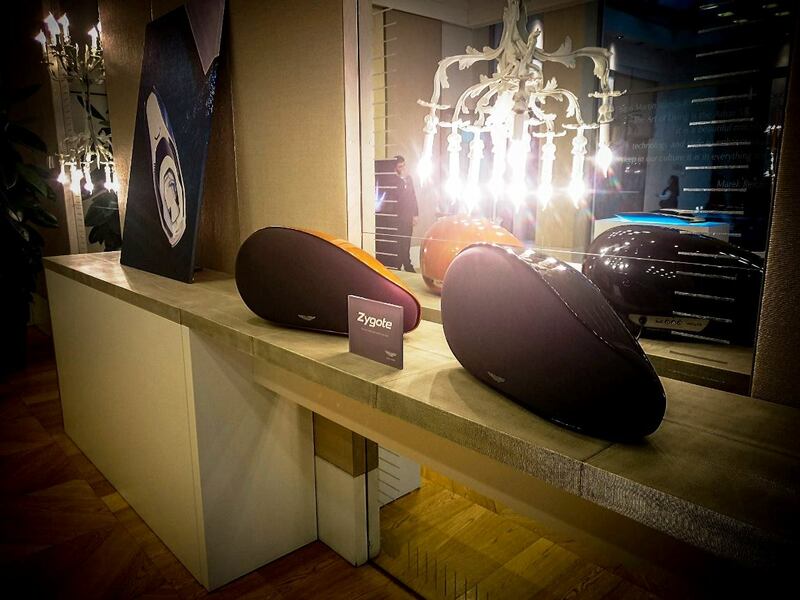 Jaguar was part of Designjunction Edit at the old Opera Nazionale Balilla. 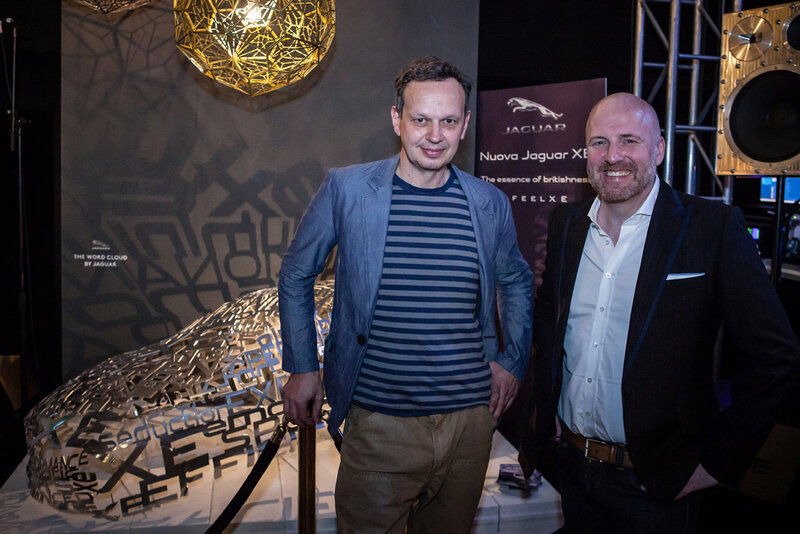 This year Jaguar was very low key, and in fact only exhibited because Tom Dixon borrowed the beautiful Jaguar XE Word Cloud sculpture. 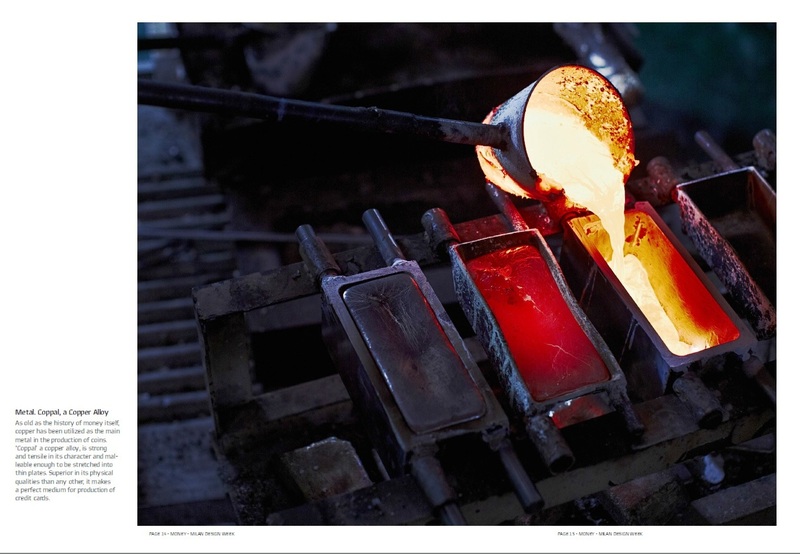 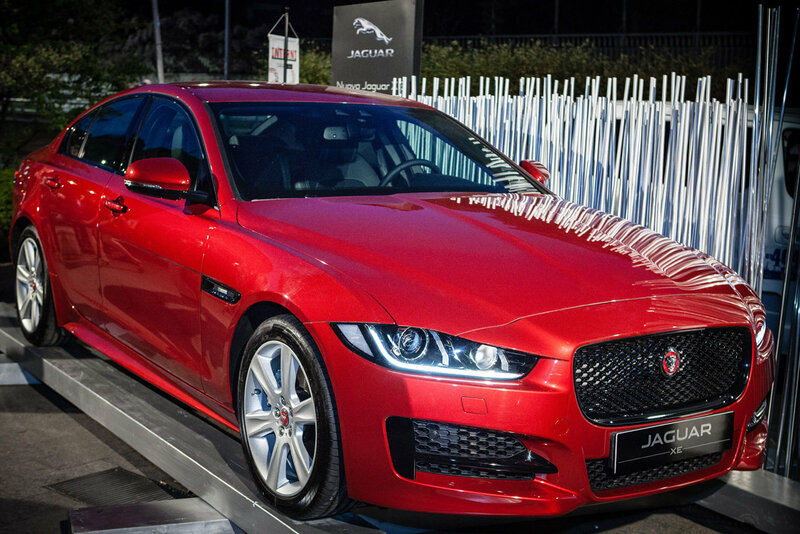 Word Cloud, an aluminium casting, reproduces the shape of the new model consists of 95 words in 7 different languages describing the new Jaguar XE – and a real one was parked outside. 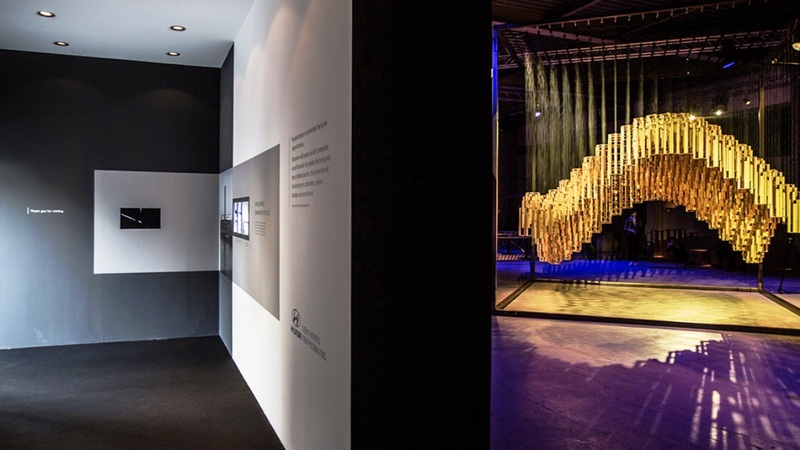 Cast metals (notably aluminum) and XE sedan (Jaguar more efficient in history), interpreted by the Word Cloud sculpture through 95 words in seven different languages. 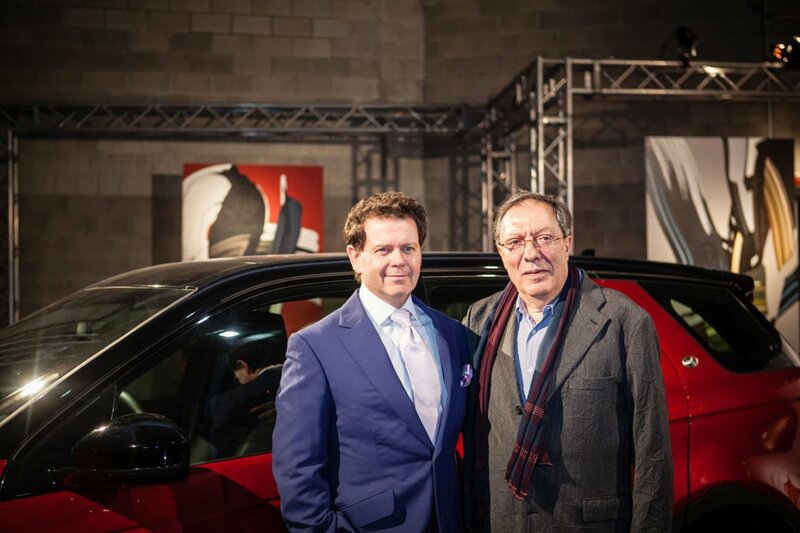 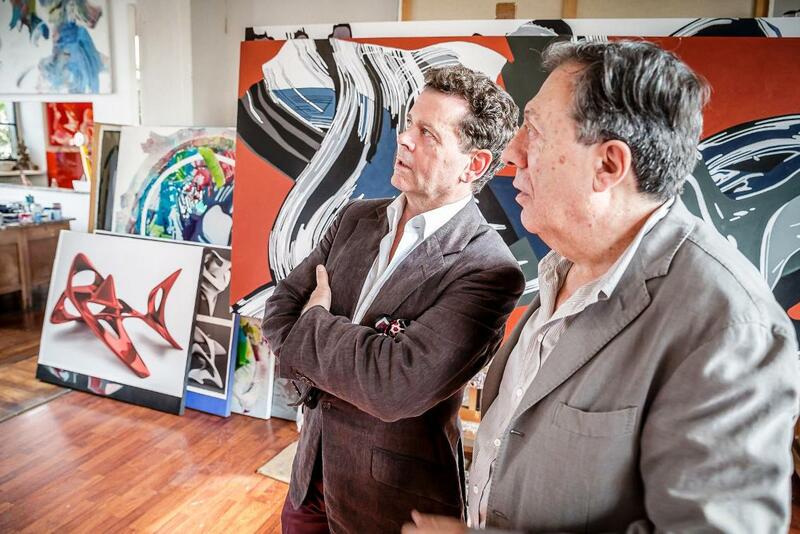 Land Rover introduced ” Unstoppable Spirit ” an installation inspired by the new Discovery Sport and result of the collaboration between Gerry McGovern, Land Rover Design Director and the Italian artist Nino Mustica. 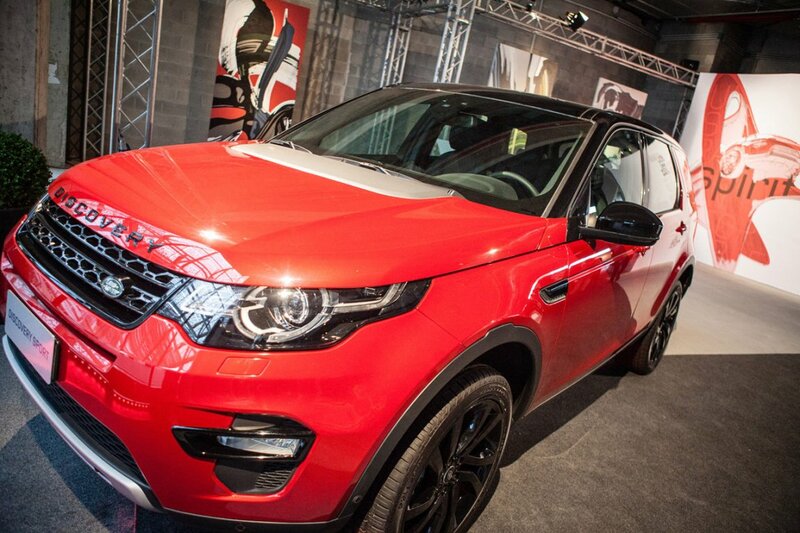 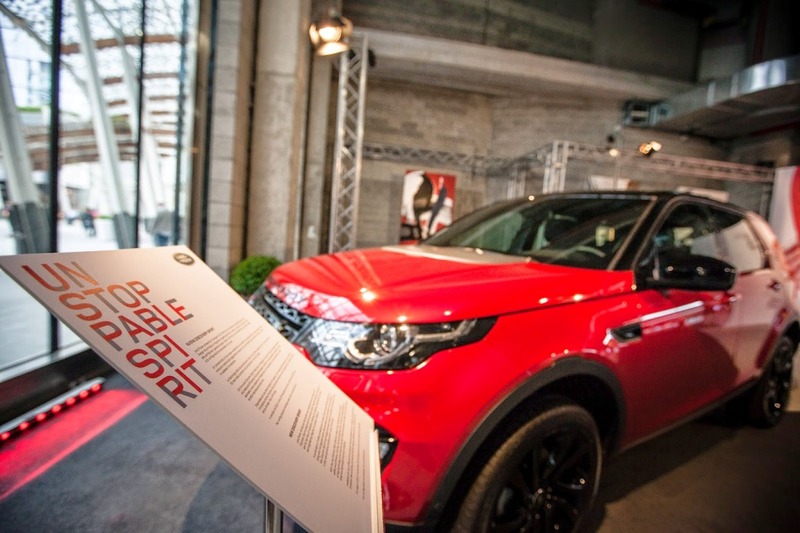 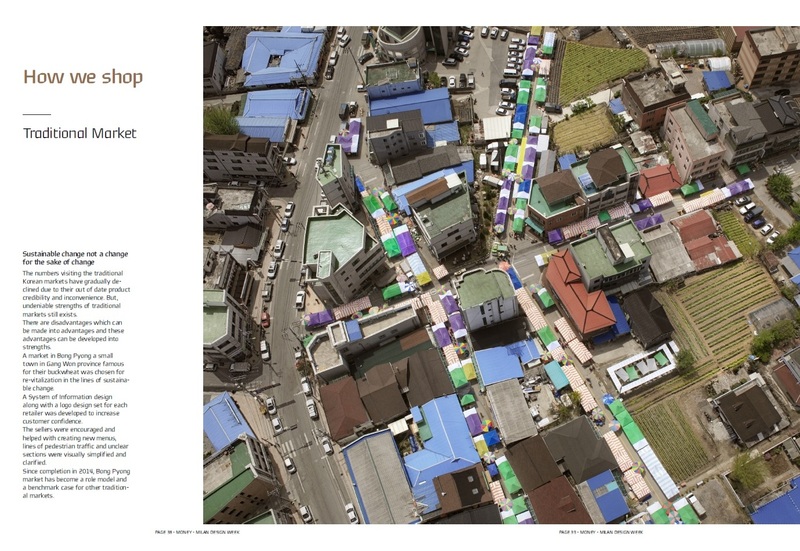 There you could find a Land Rover Discovery Sport car, and an art exhibition curated by McGovern. 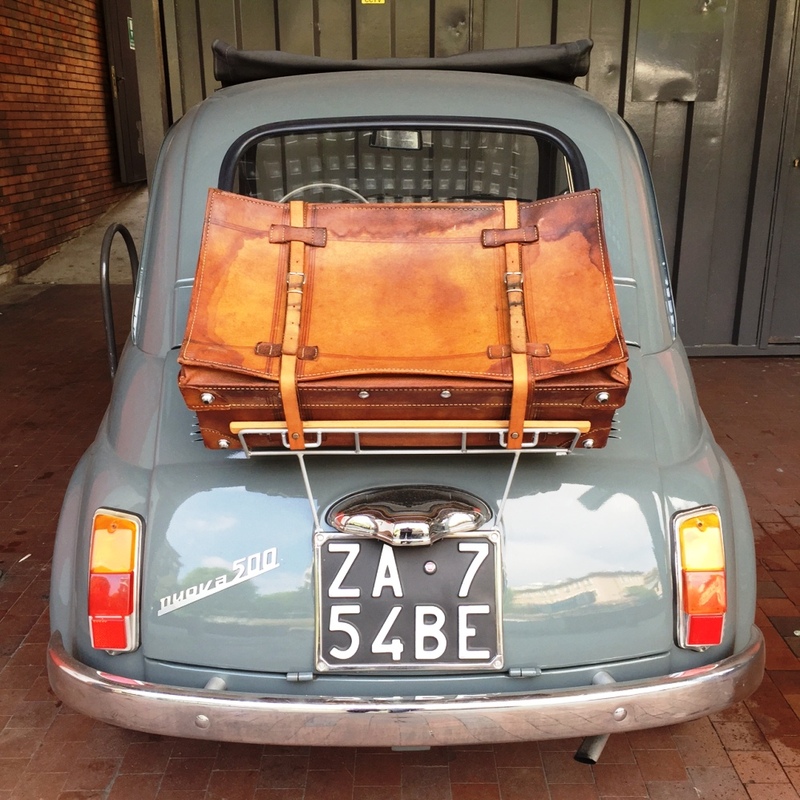 Nino Mustica has done enough interesting pieces to have earned some space on your bookshelves, and his work here is interesting in the same way Giorgio di Chirico was when he designed advertisements for Fiat. 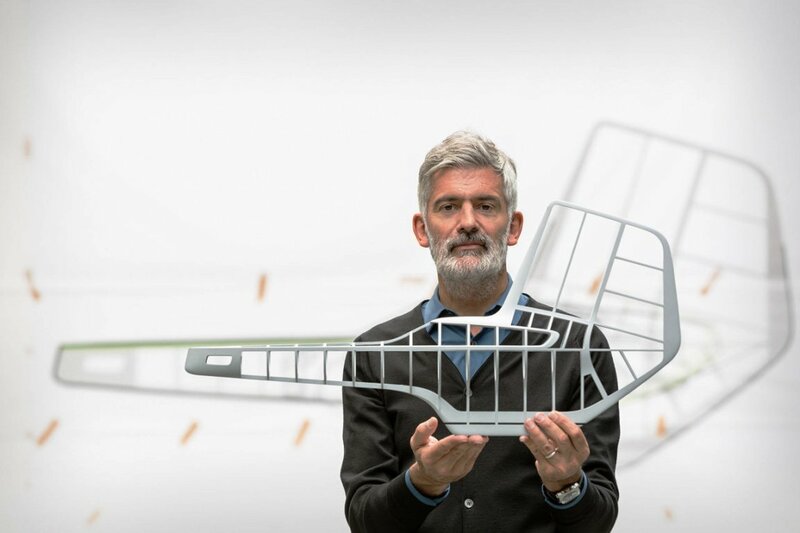 Nino Mustica explores the worlds of art and industrial design – inserting Land Rover shapes and detail within – they might become interesting decorations in a dealer’s show room. 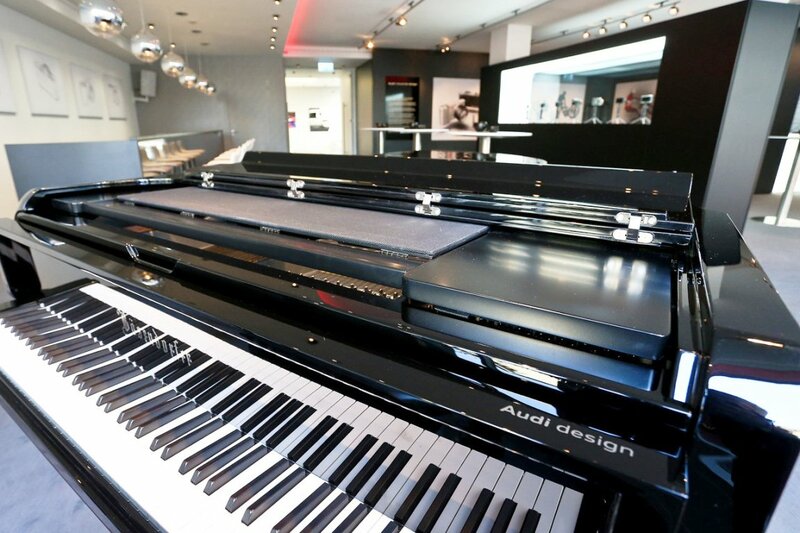 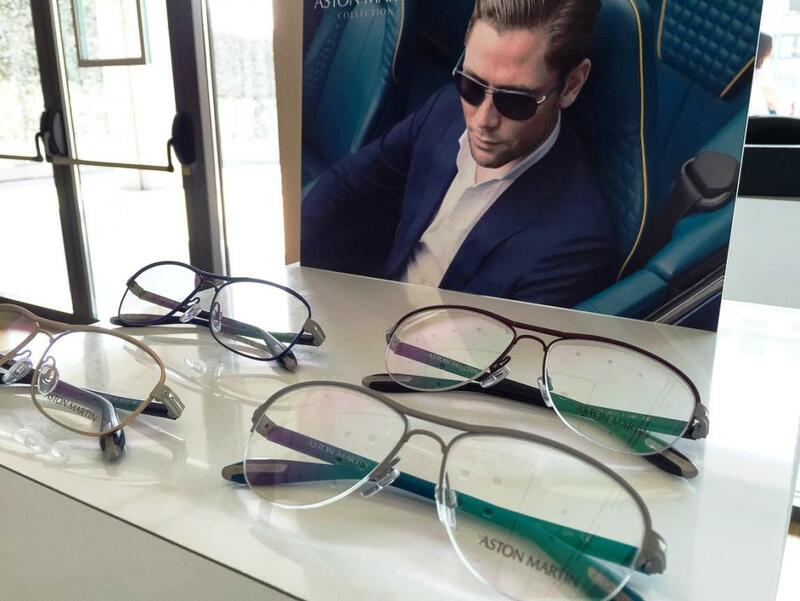 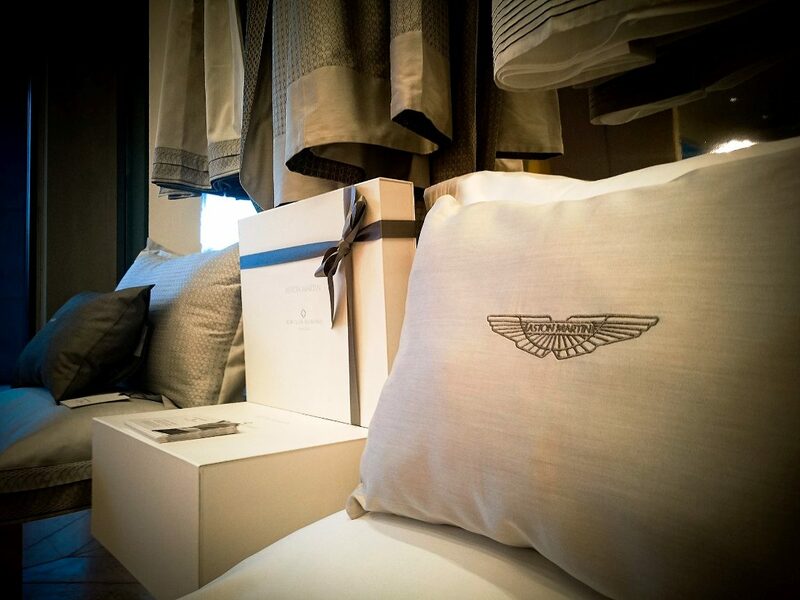 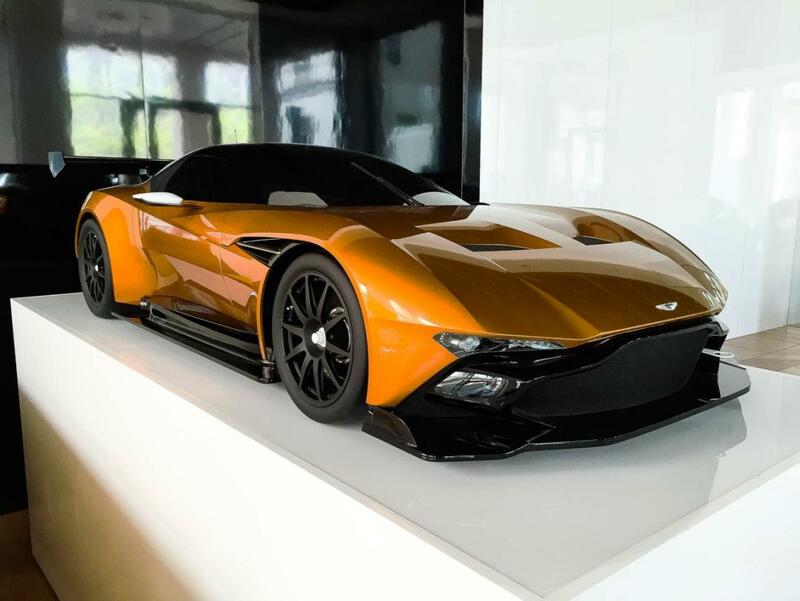 Aston Martin has stuck to what they do, cars and furniture- they continue the endless repetitions. 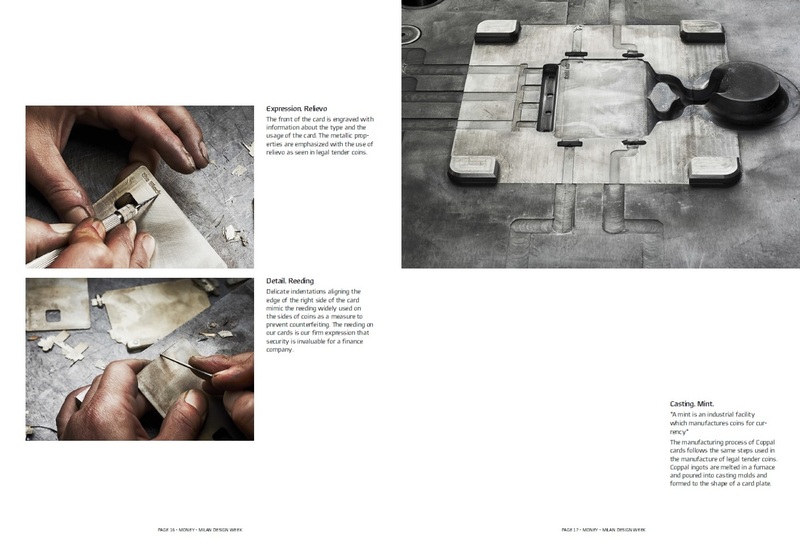 Their “home” catalogue is now thicker than any relevant car literature; their creations have even been subject for books. 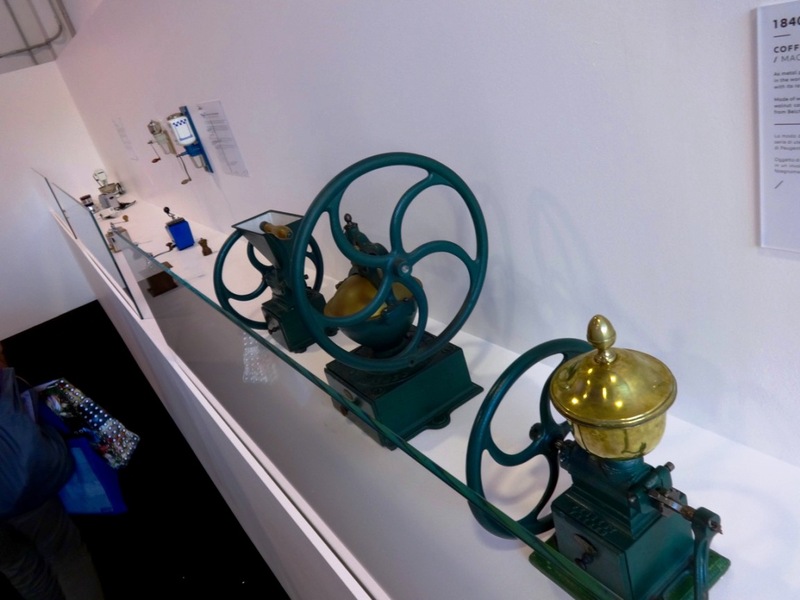 It can’t be a given thing that if you are good at making cars you are also good at making candleholders. 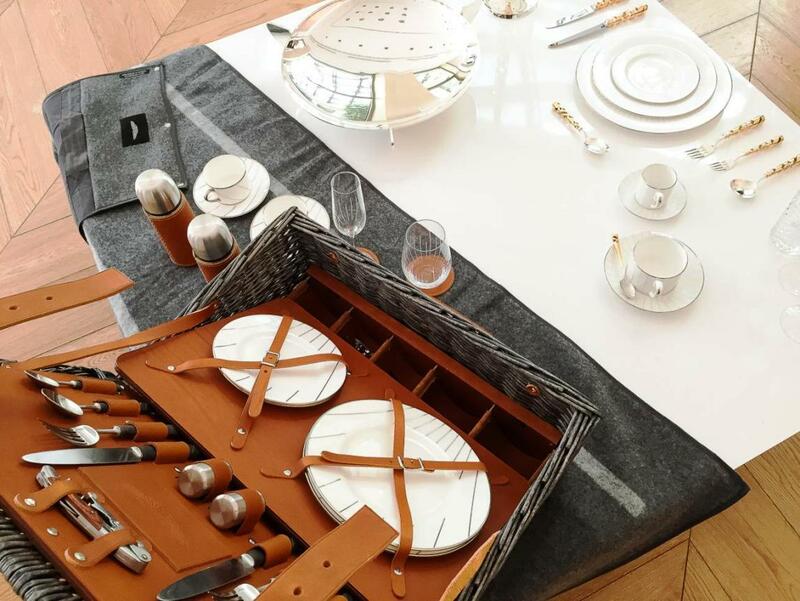 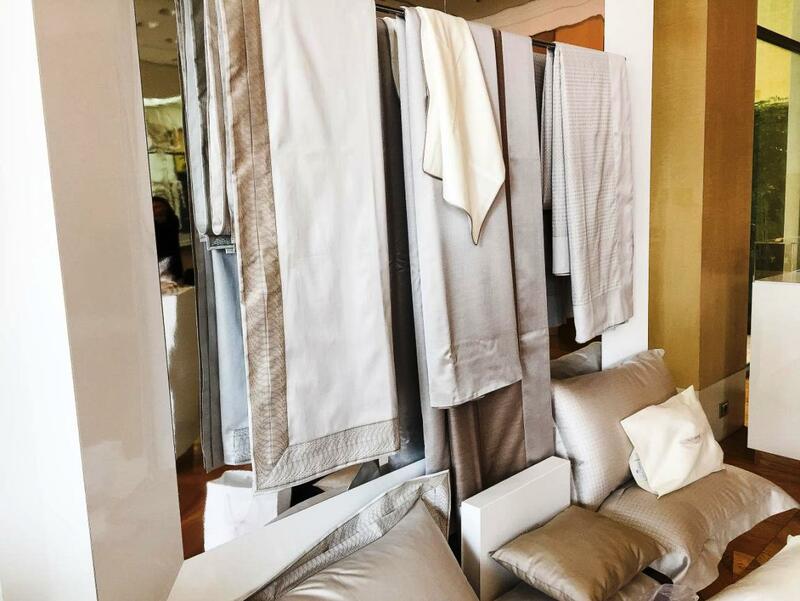 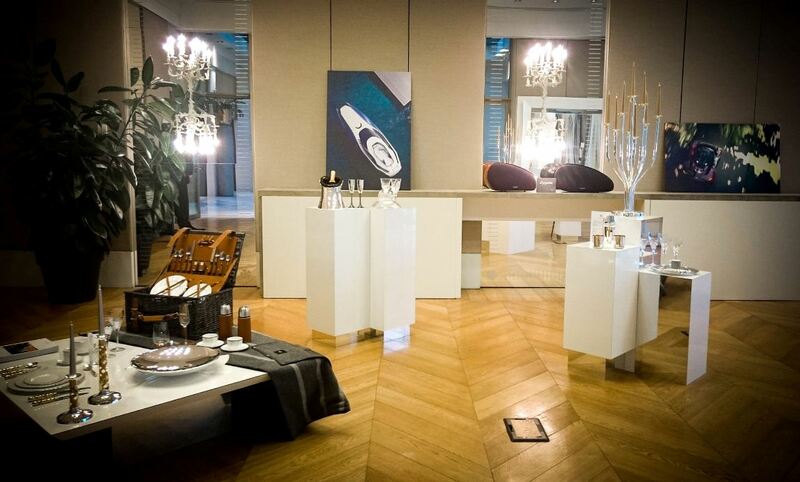 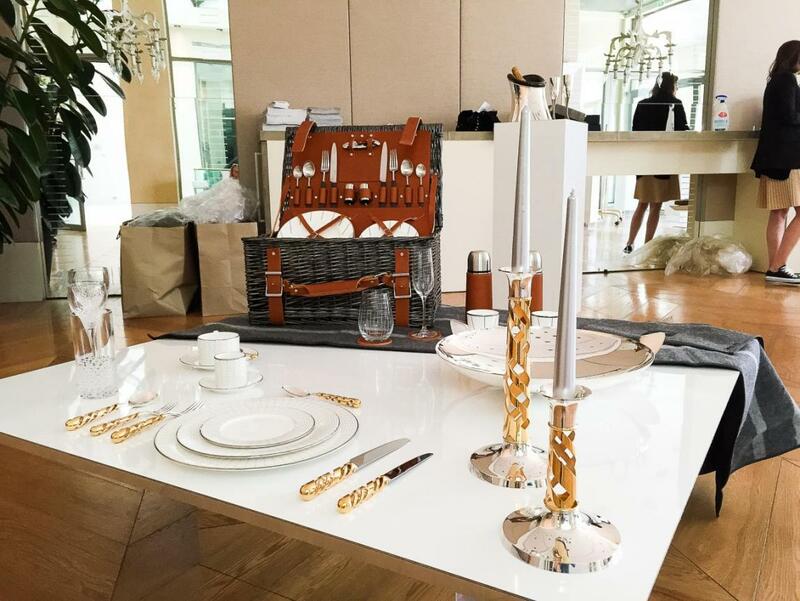 Citroën was invited by the newspaper Corriere della Sera and the design magazine Living, to participate in a special home living exhibition ” The Art of Living” at the Triennale. 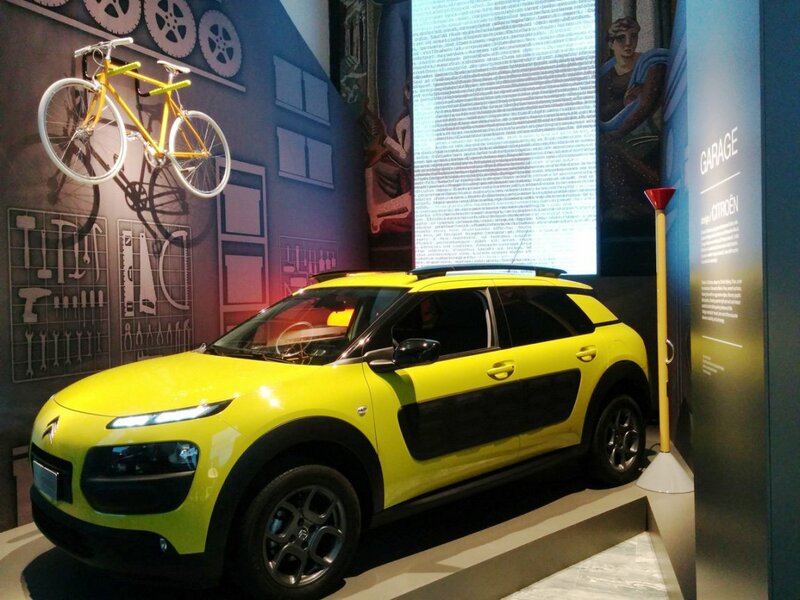 The previous week in New York, the C4 Cactus was awarded the prestigious 2015 World Car Design of the Year. 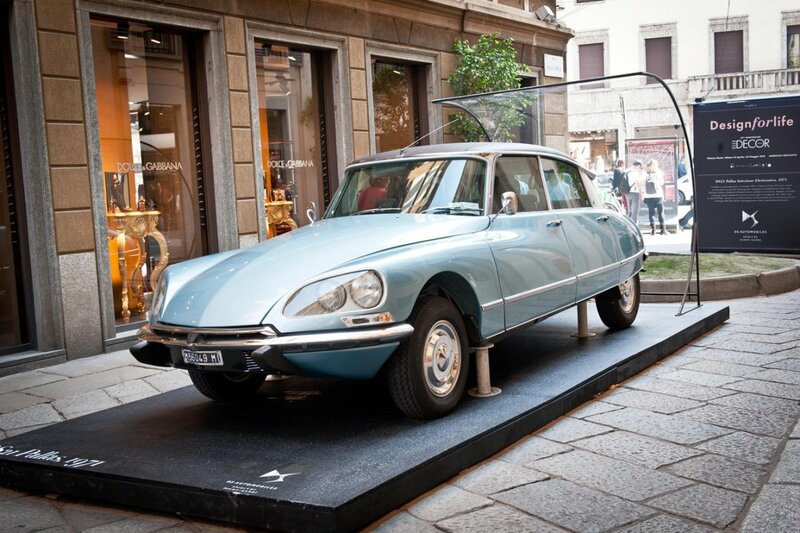 DS, the French brand made autonomous by Citroen recently chose to assist Elle Decor in the exhibition “Design for Life” at Palazzo Reale. 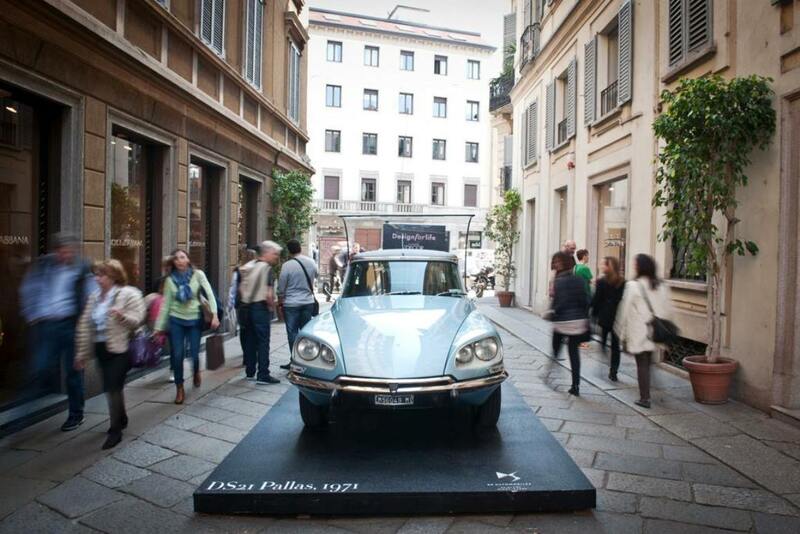 and in Via della Spiga a legendary DS, an icon of style that has marked the history of design, in homage to its’ 60th anniversary. 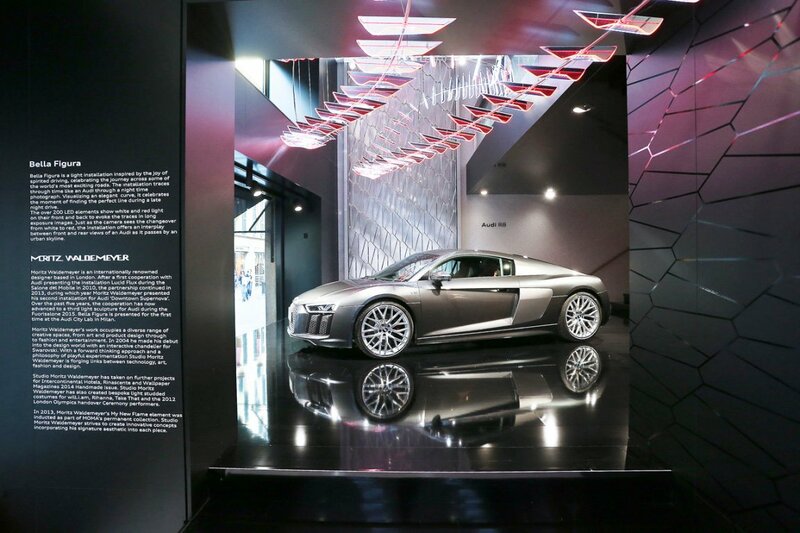 The auto-makers in recent years have been increasingly present at the Salone del Mobile in Milan, as most major car manufacturers take an increasing interest in the event.and muscle in on Milan. 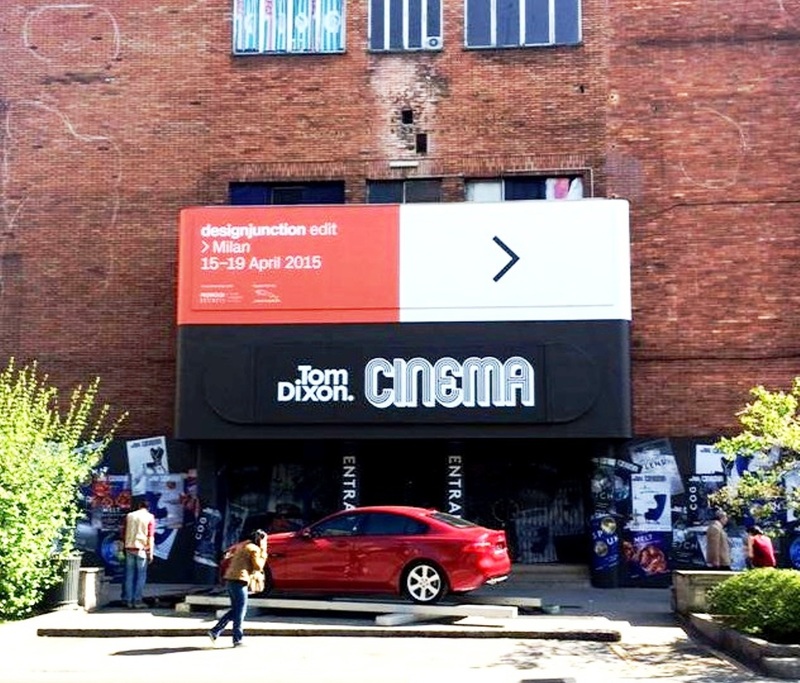 The Salone was again invaded and supported by the Motor Car industry – showing their design credentials to the fullest and making a significant contribution to the exclusive party circuit in town for the Fair, with new installations, design competitions and the appearance of the odd concept car all conspiring to share the limelight with the big furniture brands. 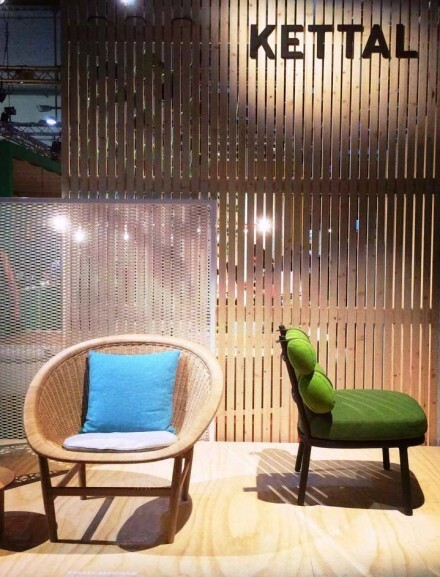 The stand displays full collection settings designed by international talents like Patricia Urquiola, Rodolfo Dordoni, Jasper Morrison and Hella Jongerius and for the first time Kettal has re-edited a modern classic – the basket weave chair by Nanna Ditzel.